The preservation pages provide lists of many of the AEC buses in preservation. The information is collated directly from the owners or other interested parties, from reports in "Buses" and PSV Circle newsletters and from Internet searches of vehicles I have photographed myself. Many large preservation groups have their own websites and I am providing links to these where I know them. 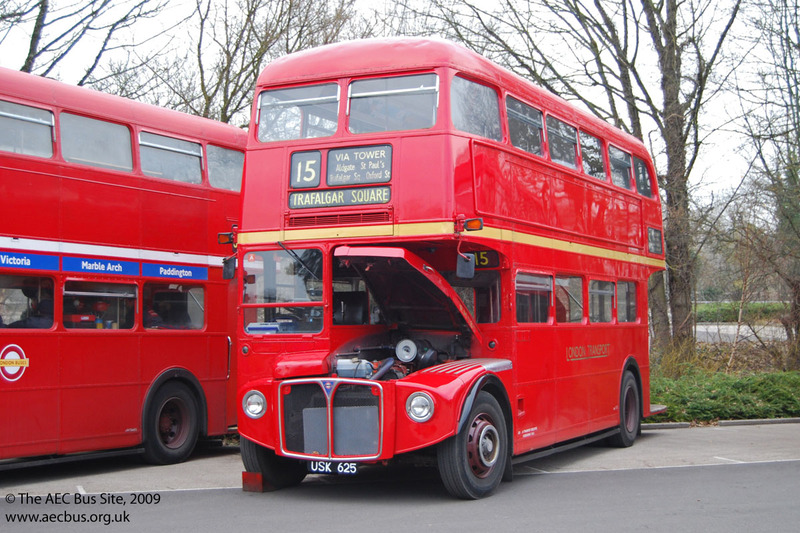 Buses with a Class VI MOT and therefore available for public service are listed on the AECs in Service page, even if they are primarily preserved and only appear infrequently in service. Such vehicles frequently appear at rallies and running days. 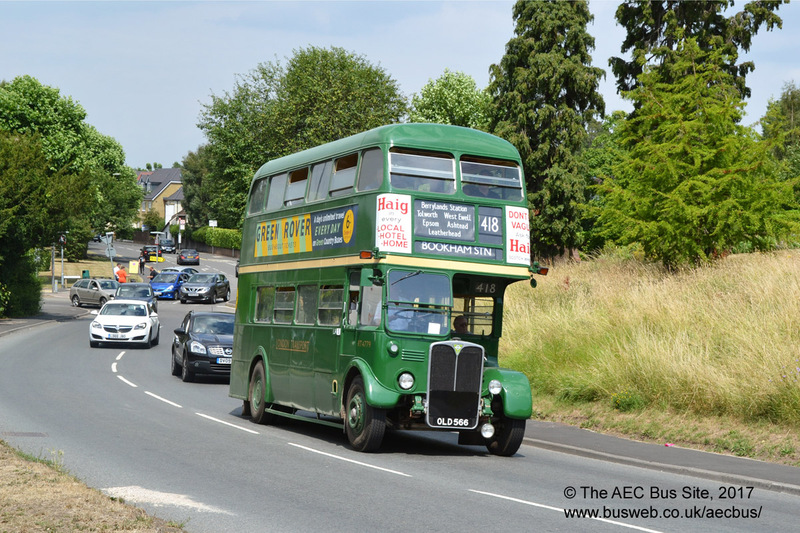 The Rallies and Running Days page has details of a number of events where these preserved AECs may be seen. The running days (mainly concentrated in the South East) are especially interesting as they provide opportunities to travel on the buses. This page contains the lists and photos of preserved AECs that originated with London Transport or London Country. 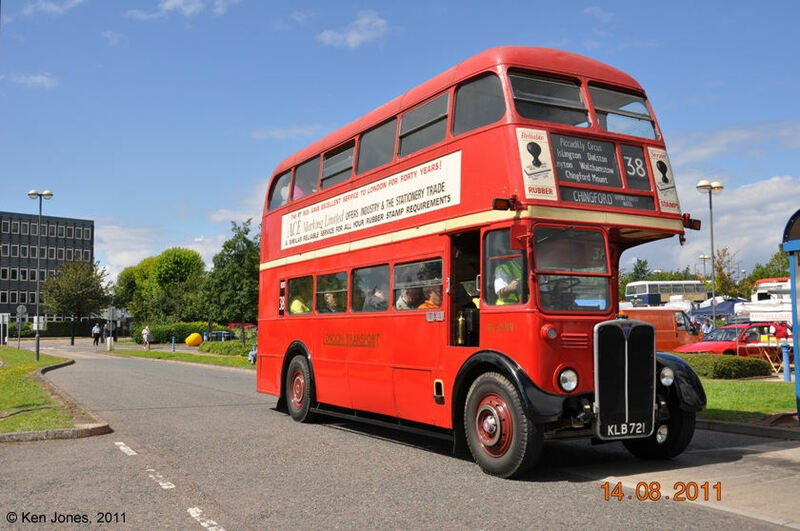 Part 1 contains the list of preserved AEC buses and coaches that originated with other operators all over the United Kingdom. 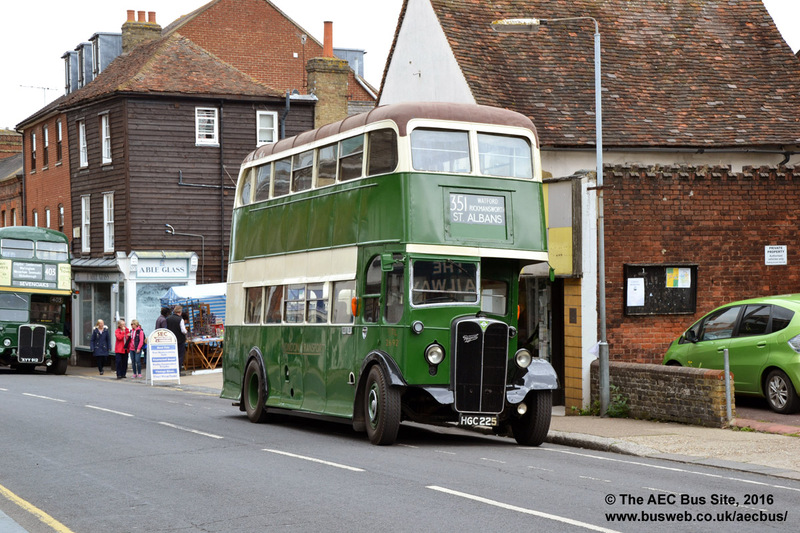 Ensignbus own pre-war AEC Regal 10T10, former London Transport T499. It is pictured in December 2014 after being freshly repainted in LT coach livery. 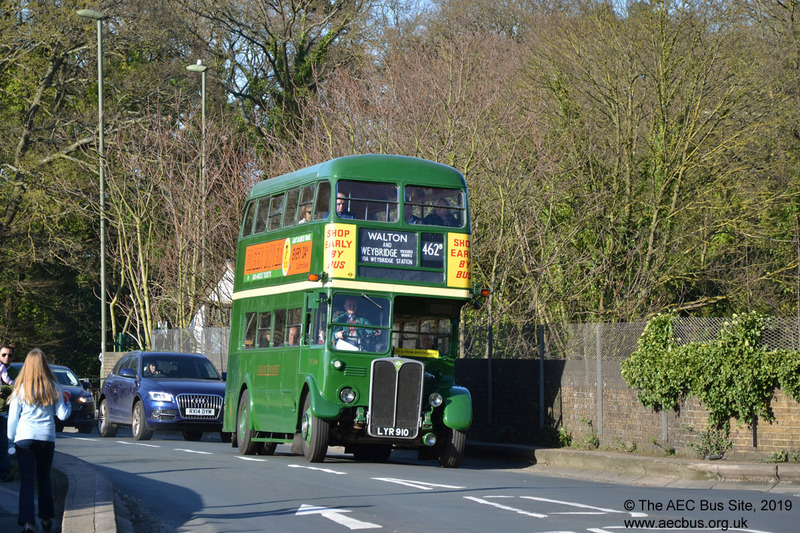 Another superbly restored T-type is T792, seen returning home after a day out at the 2015 Amersham running day. Unusual side-engined AEC Q type, Q83 is also owned by the London Bus Preservation Trust and kept at the London Bus Museum. It has been painted into original pre-war Green Line livery since this picture was taken. 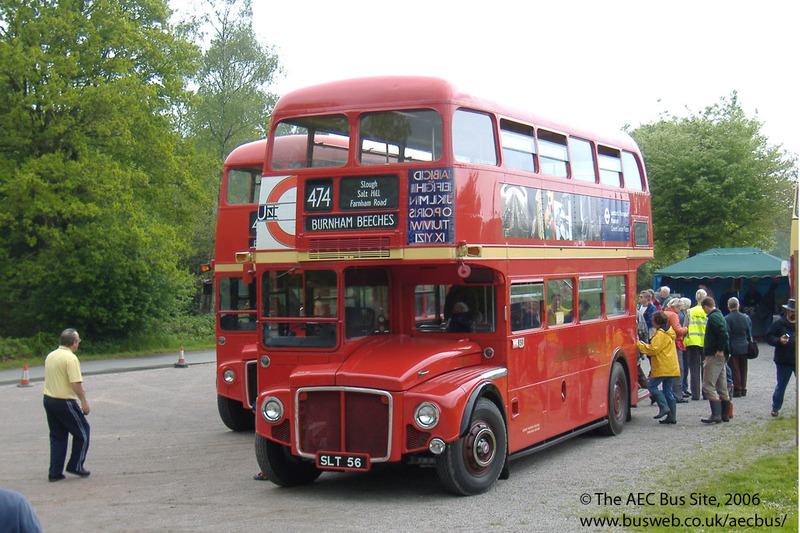 The AEC Regal IV demonstrator, UMP 227, is preserved at the London Transport Museum. 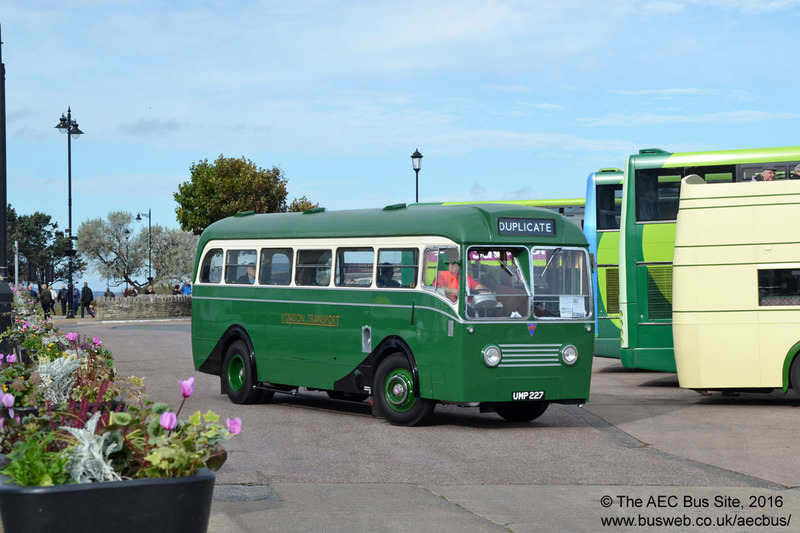 It occasionally ventures out to running days and was a welcome visitor to the 2016 Isle of Wight Beer and buses event. 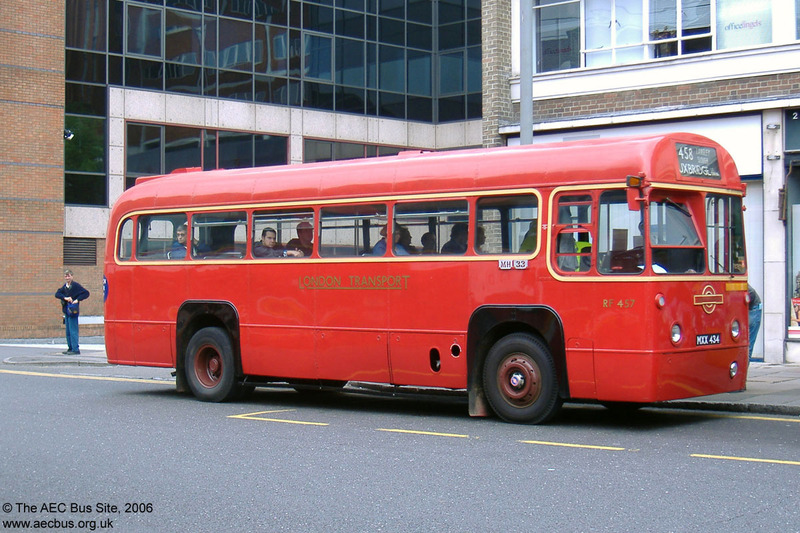 MLL 738 is one of the 65 AEC Regals built with Park Royal "one and a half deck" bodies for BEA transfer services between central London and Heathrow (later replaced by front entrance Routemasters), now with Marshopper in Kent, and gained a PSV licence in 2018. MLL 721 is also owned. More about these vehicles can be found at Ian's Bus Stop. 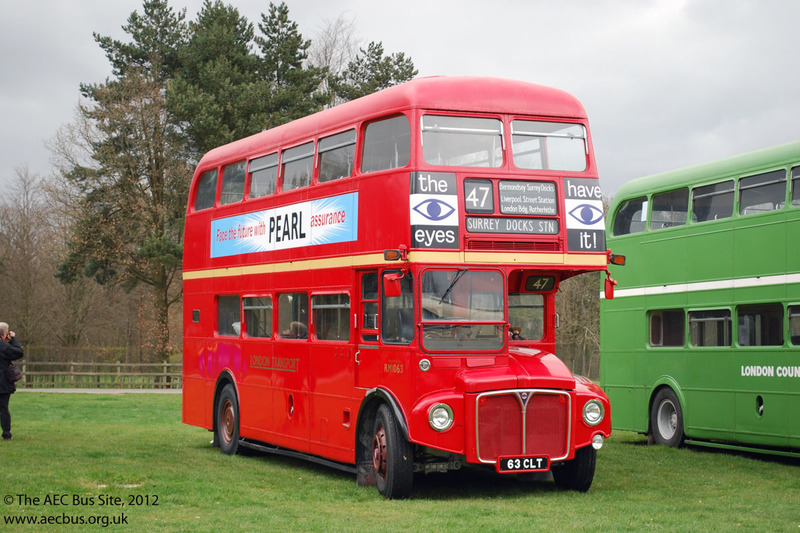 Two more of the AEC Regal IVs with unusual "one and a half deck" bodies for BEA shuttles between Heathrow and Central London, MLL 722 and MLL 735 passed in 2015 from Ensignbus to London Bus Company for further preservation and restoration. 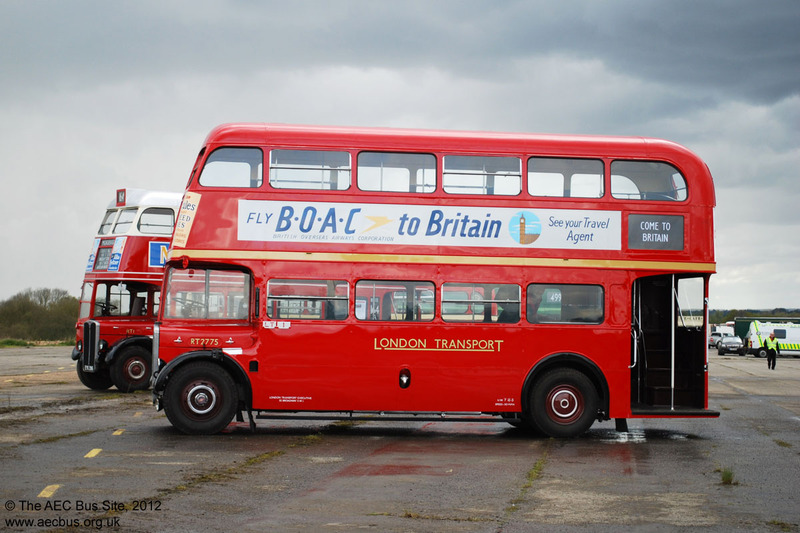 Sister MLL 740 is restored in BEA livery and currently on loan to the London Bus Museum. 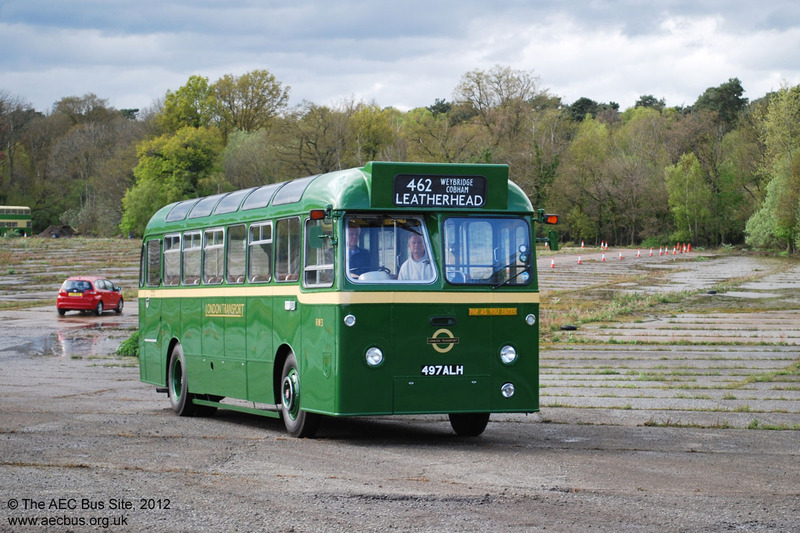 Early Green Line RF4 (LUC 204), one of the first batch built by Metro-Cammell with panoramic windows for additional use on sightseeing tours, is preserved by a private owner in Kent and appears at rallies in the area. The same owner also has RF12 and RF16. Early Green Line RF10 (LUC 210) is under restoration with a private owner in the south-east. 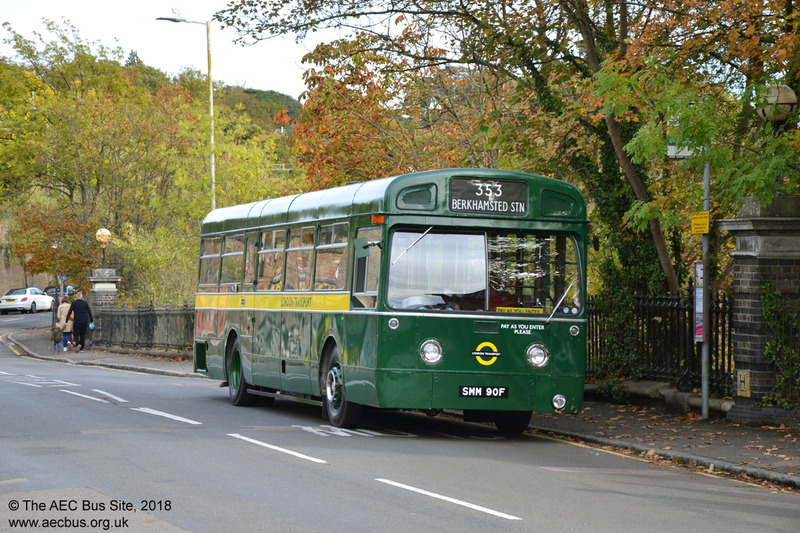 Metro-Cammell bodied RF13 (LUC 213) is another of the first batch in preservation, and has been restored by Quantock Motor Services in Somerset. 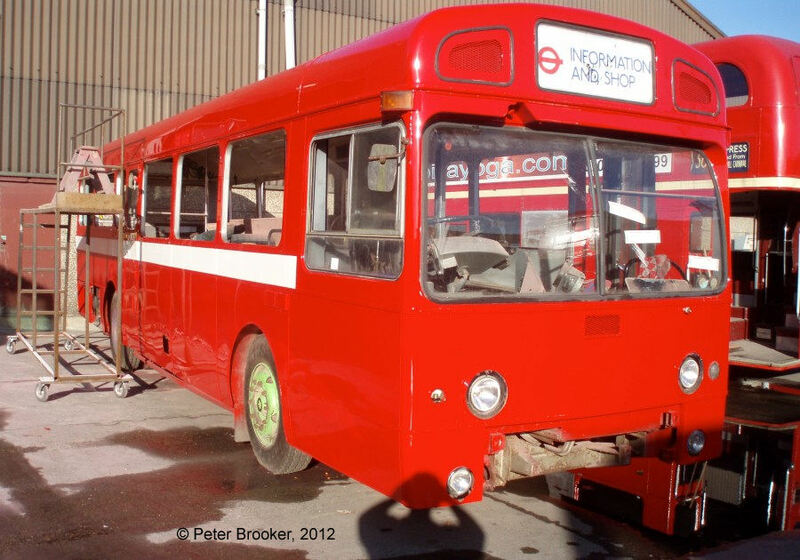 RF19 (LUC 219) and ECW bodied RFW6 (LUC 381) are being restored at the London Bus Museum. RF26 (LYF 377), which was formerly in the fleet of Memory Lane Buses, was sold for preservation in 2010. 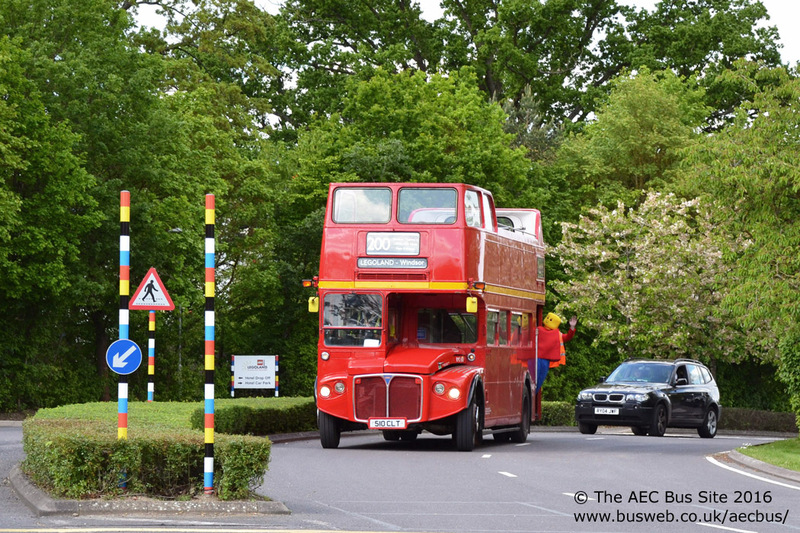 It was seen at Gerrards Cross during one of the running days organised by Amersham & District. 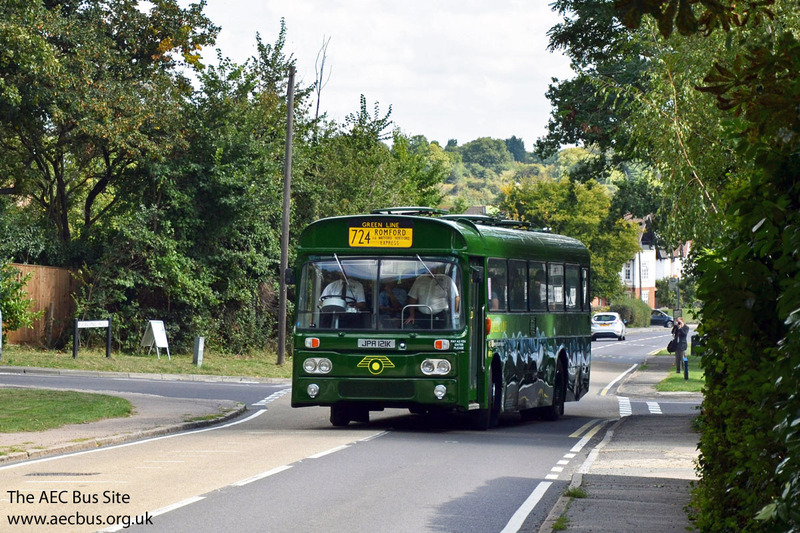 Preserved Green Line RF28 (LYF 379) is freshly repainted and attending running days.It's pictured here at Otford village during the 2015 Sevenoaks running day. 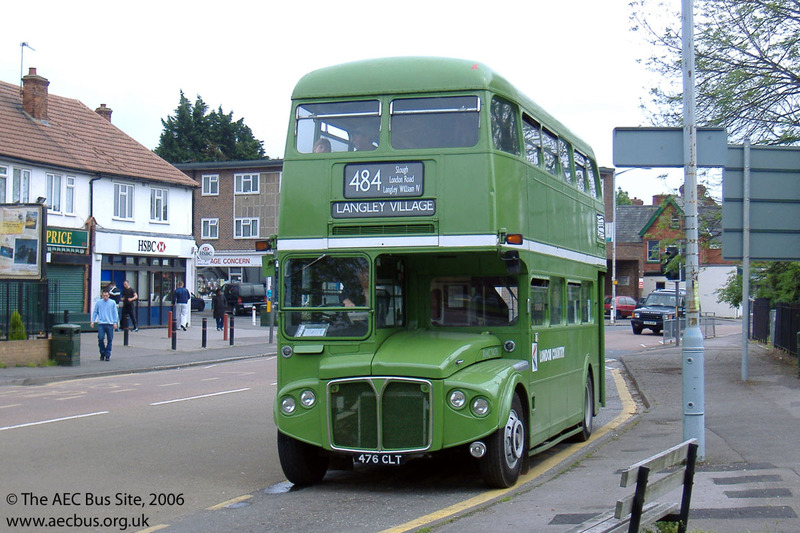 RF146 (MLL 533) is preserved in the livery used for some Green Line RFs downgraded to bus use, with the green band replaced with a yellow one. Another preserved Green Line RF is RF168 (MLL 555), also a regular attender at running days. 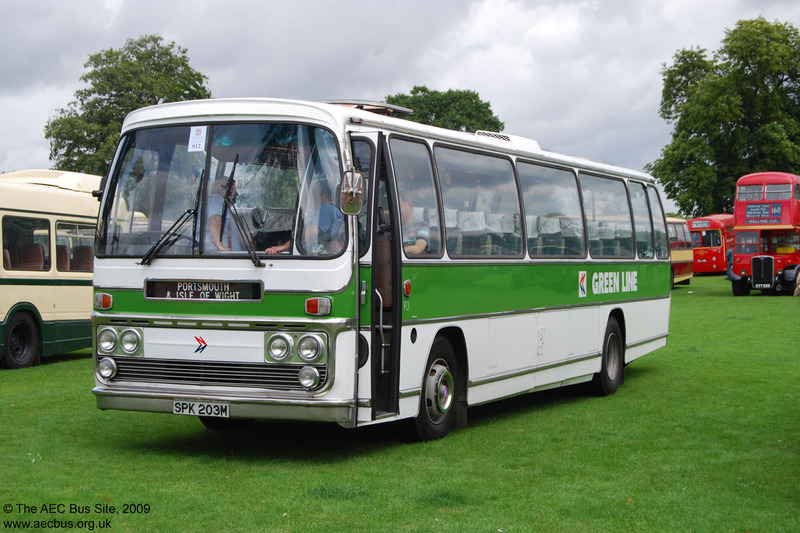 Green Line RF202 (originally MLL 589) is now registered MLL 528 and masquerades as RF141 which had that registration number. It is now with a private owner in Cambridgeshire following a number of years as a special events vehicle with Western Greyhound in Cornwall. As RF202 it was one of the very last RFs to run in service with LCBS and was preserved by them for some time before passing into private hands. 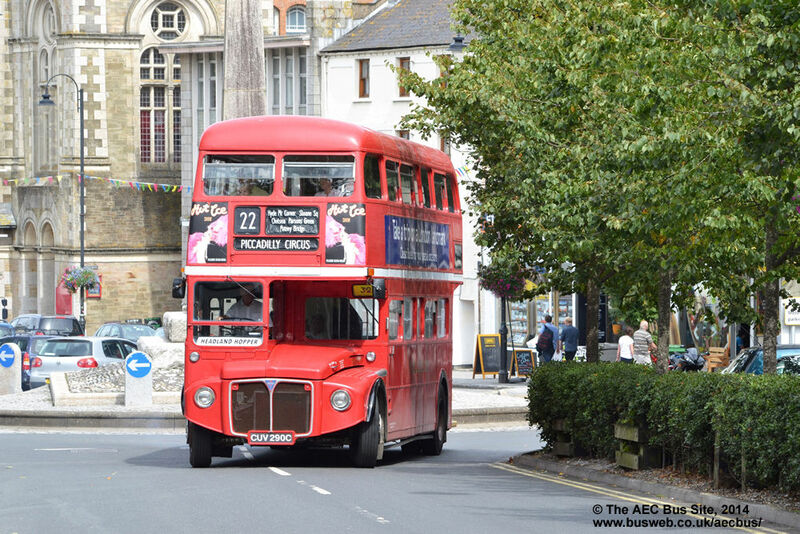 RF226 (MLL 763) is back in preservation following a spell as a service vehicle with Alder Valley Travel. It was pictured on a Greenline running day in December 2017. RF269 (MLL 806) had returned to preservation after a period of use as a private hire vehicle in North Wales. 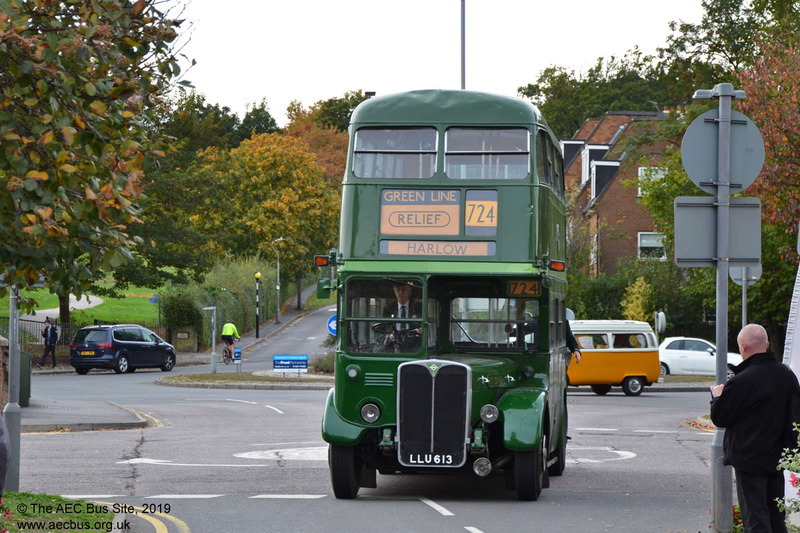 Green Line RF281 (MLL 818) also appears regularly at LCBS themed running days. RF308 (NLE 527) retains the fleetnumber it carried after conversion from bus RF527. 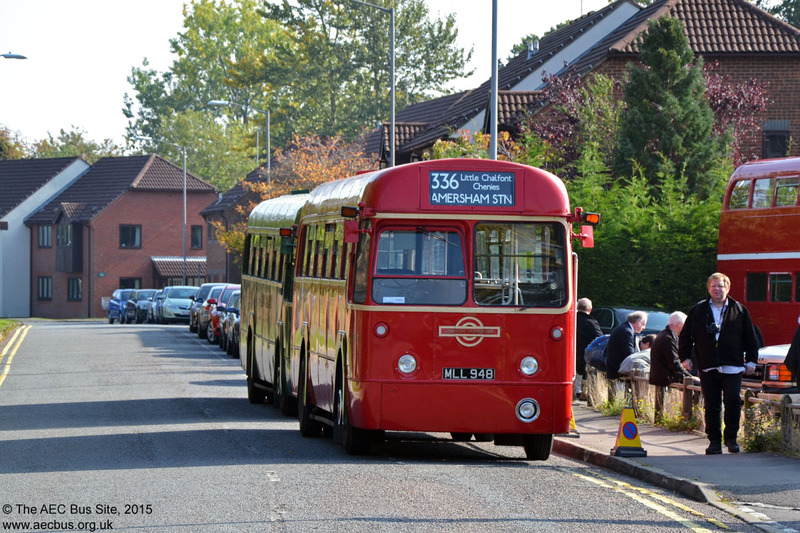 It is a regular at running days and was seen at Bucks Hill during the April 2015 Watford running day. 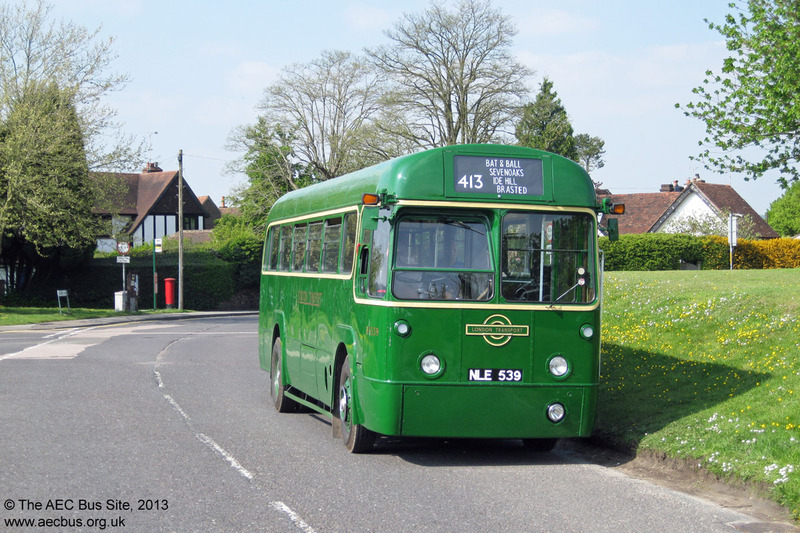 Green RF315 (MLL 952) is preserved in the Lincolnshire area and can be seen at LVVT open/running days. 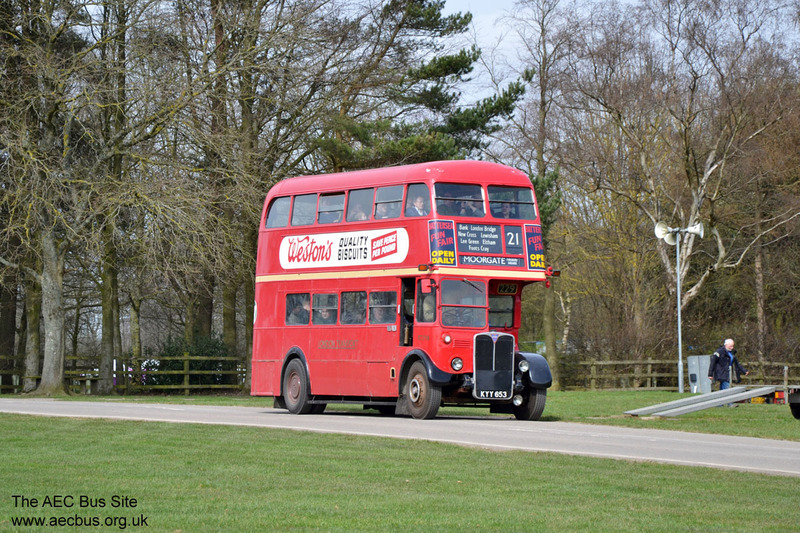 Preserved RF326 (MLL 963) at the 2012 Wisley Airfield rally. Red RF354 (MLL 991) at the 2018 Amerham and Chesham running day. 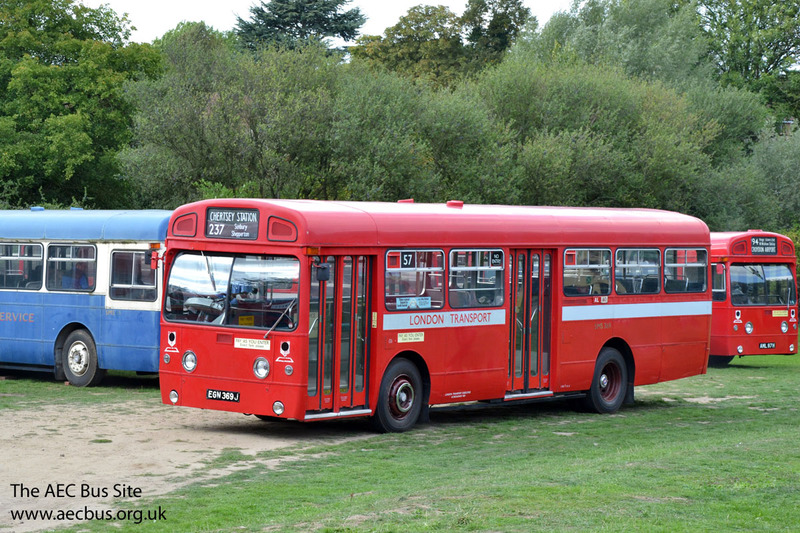 Red RF368 at the 2012 Detling rally. 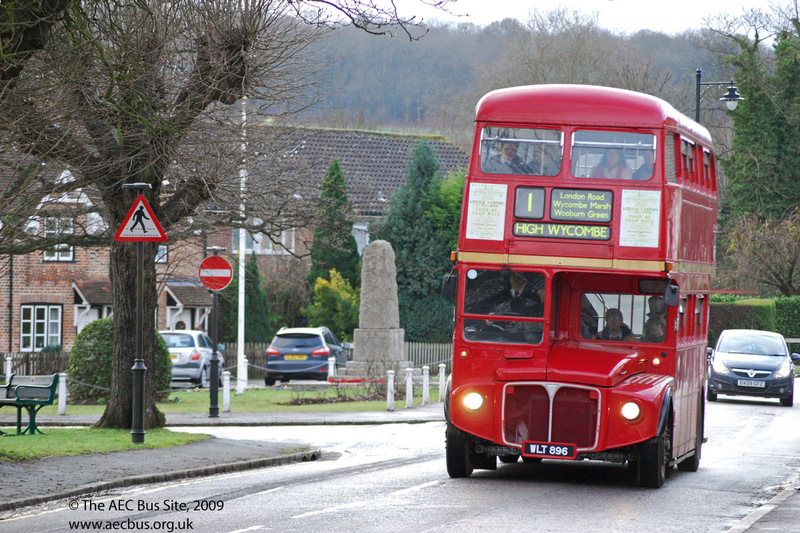 Red RF383 (MXX 25) at Swanley in 2007. 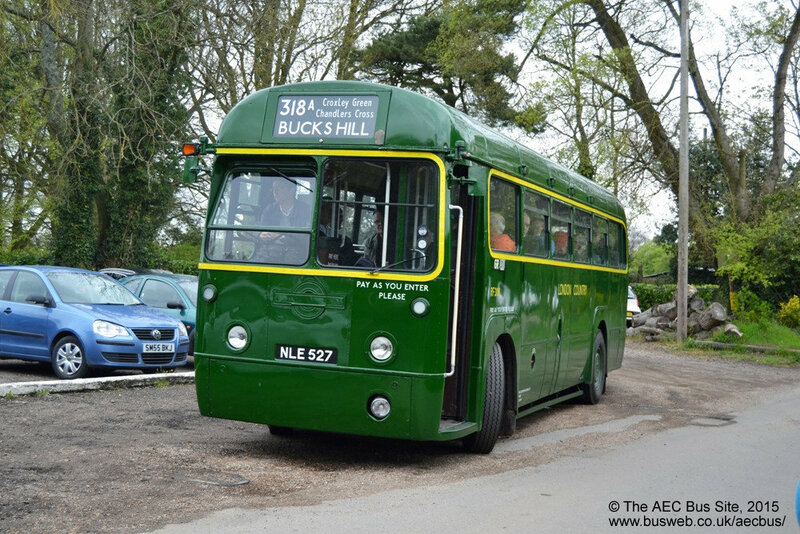 The LBPT's RF395 (MXX 283) at Great Missenden during the 2009 Amersham running day. RF429 rests at Green Street Green before setting out for its return journey to Sevenoaks in May 2013. 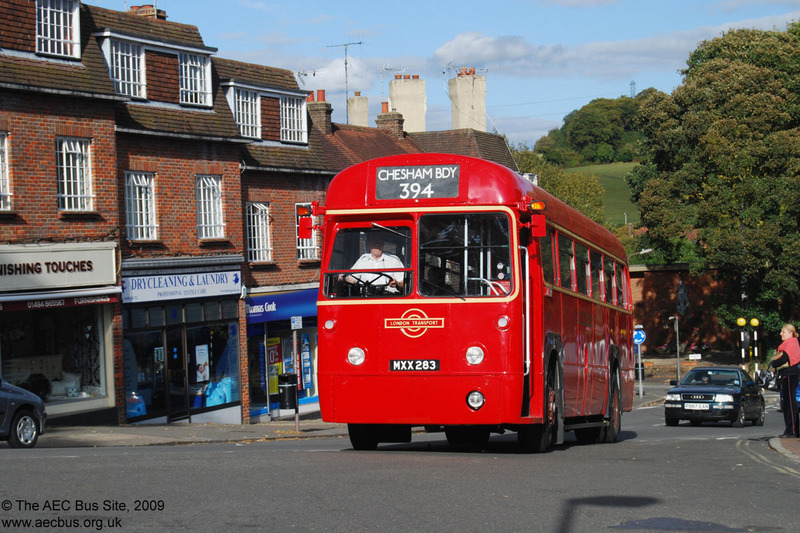 Red RF433 at Chesham during the 2015 Amersham running day. Another regular running day performer is RF453 (MXX 430). Another regular running day performer is RF457 (MXX 434). Another of the preserved RFs, RF489 (MXX 466) at a running day in May 2011. 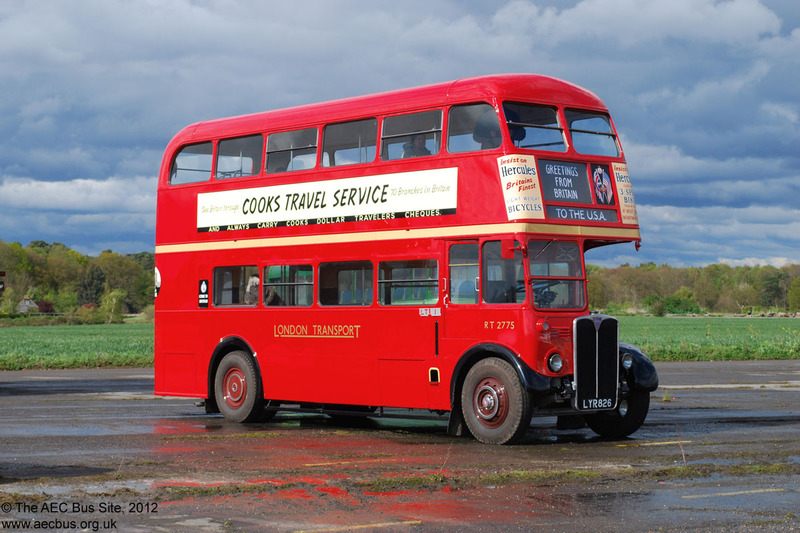 This subsequently joined the heritage fleet of London Retro Bus Hire. Red RF518 swings into Staines bus station during a running day in May 2012. 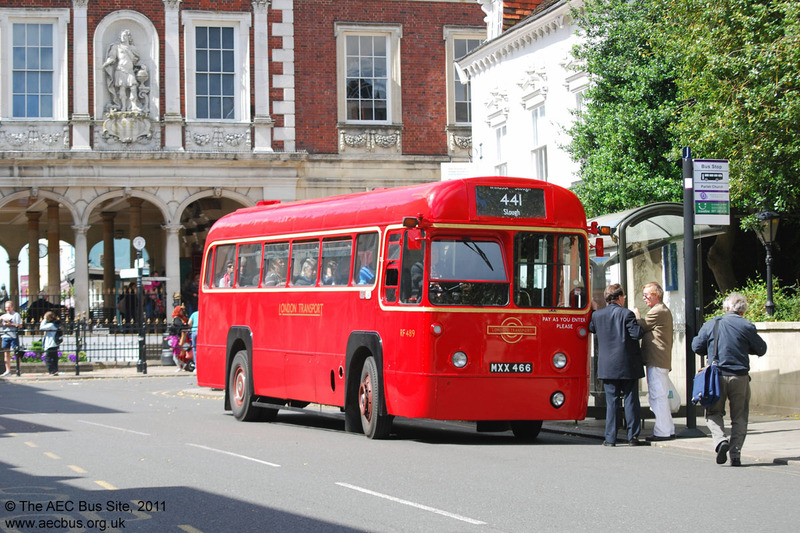 Previously preserved RF530 (MLL 948) has joined the operational fleet of Victoria Events Vintage Bus Hire. 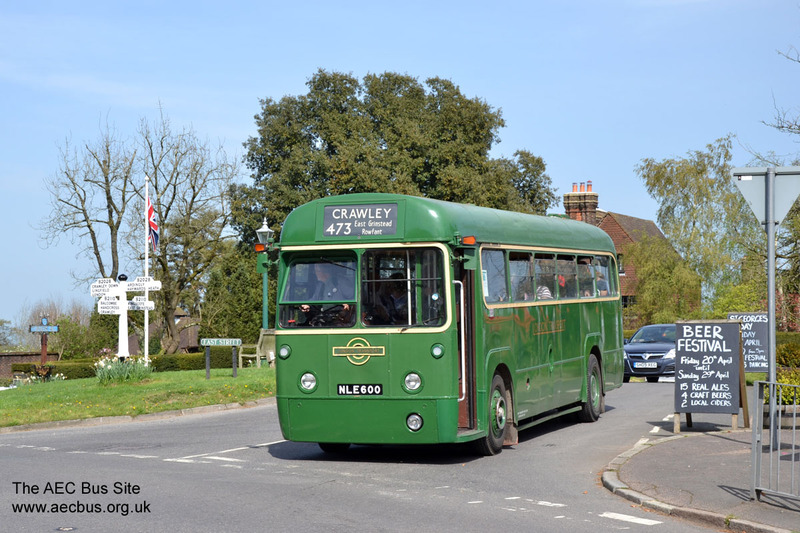 Country bus RF539 at Chipstead while giving free rides at the 2013 Sevenoaks running day. 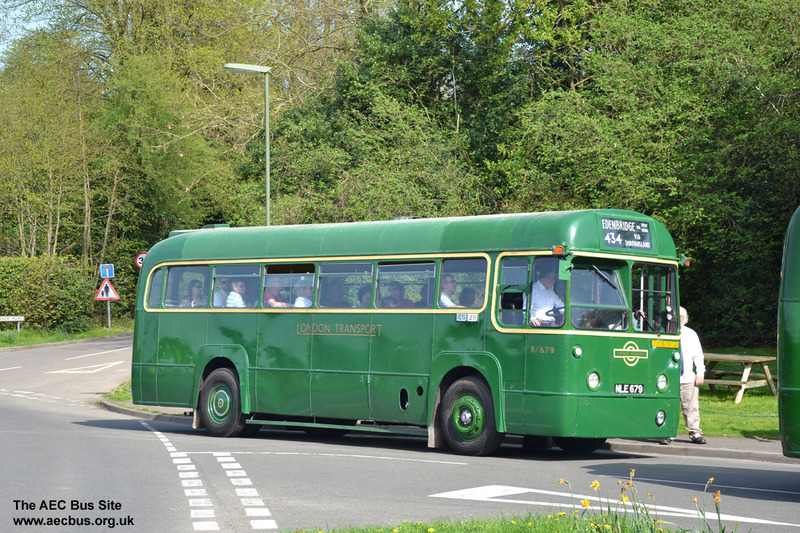 Green RF600 (NLE 600), a member of the Ensignbus preserved fleet, in action at Turners Hill during a running day in April 2018. Green RF603 (NLE 603) is under restoration after changing hands in 2015. 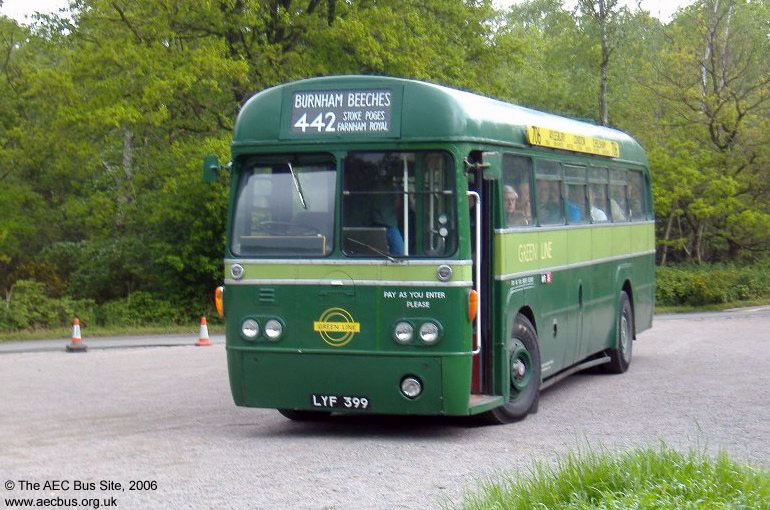 RF627 (NLE 627) is preserved in the Midlands and was pictured by Ken Jones at the 2012 Potteries running day. 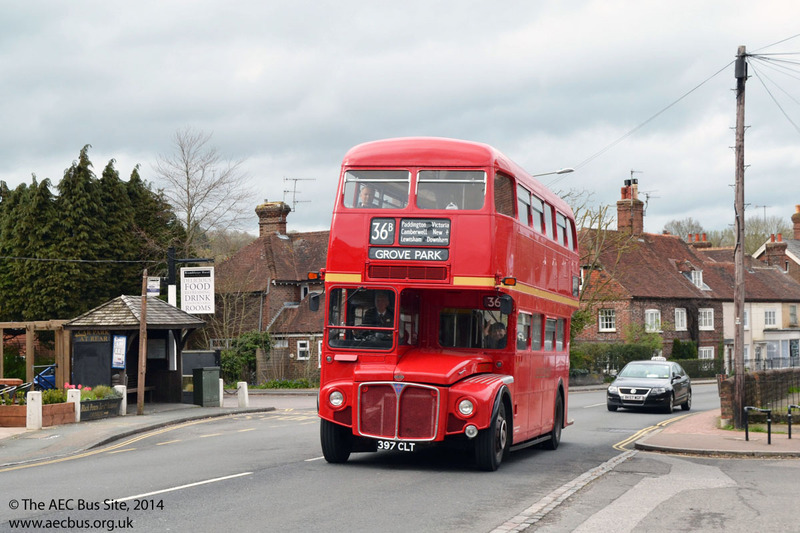 RF633 (NLE 633) recreating the London Country service to Edenbridge during a running day in April 2018. RF636 (NLE 636), now in the London Bus Company preserved fleet, seen at a running day in 2019. 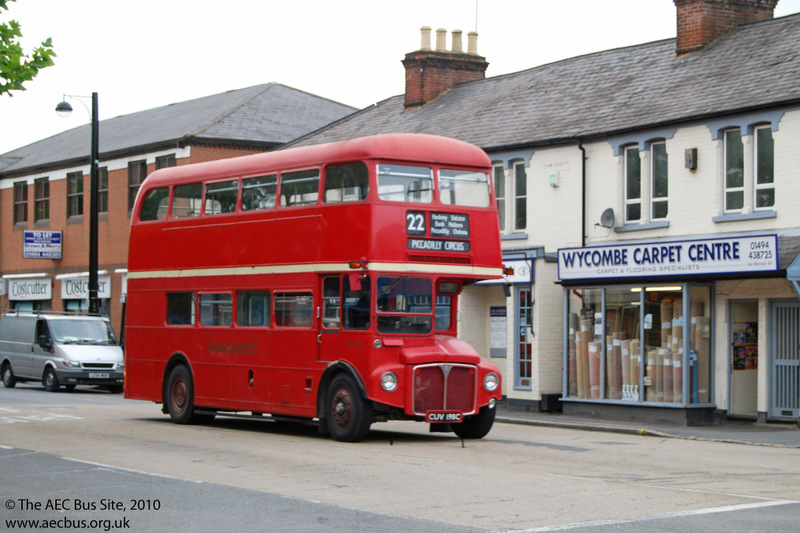 Another preserved country bus, RF667 (NLE 667) was seen at Stoke D'Abernon station during the Oct 2009 Cobham event. 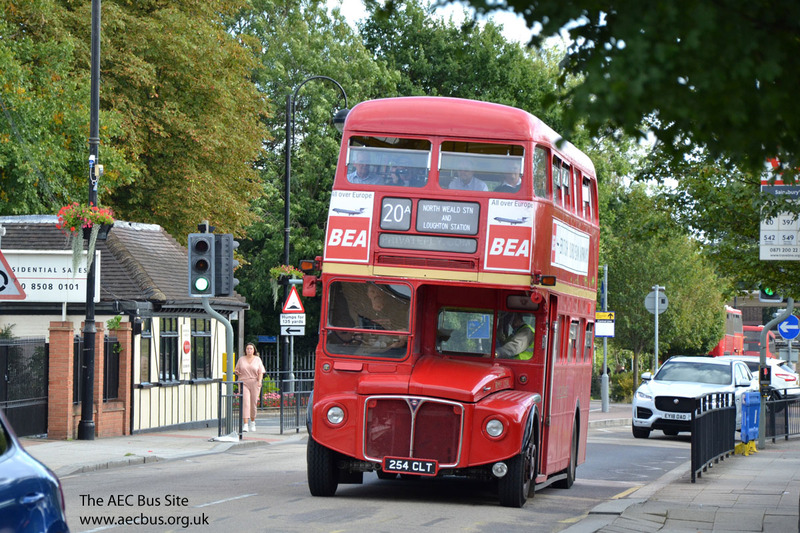 Country bus RF672 (NLE 672) at Alton in July 2014. 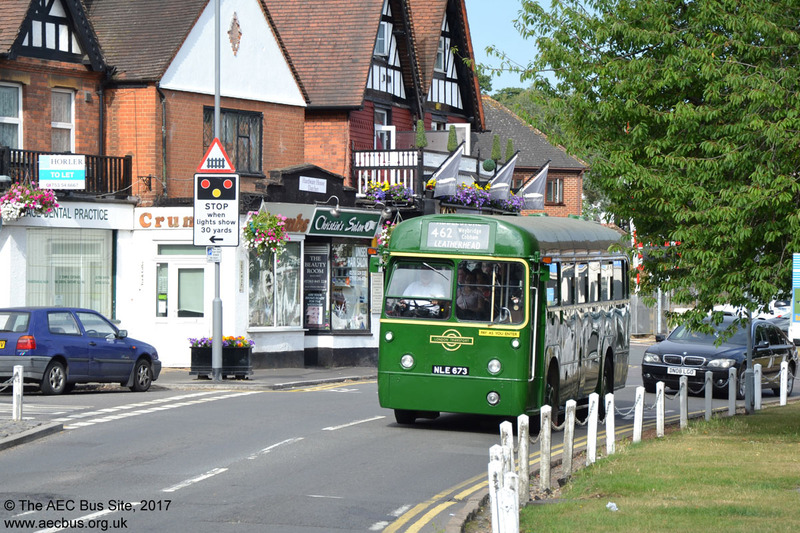 Country bus RF673 (NLE 673) at Datchet en route to the Leatherhead running day in July 2017. The RT/RF Register's RF679 (NLE 679) at Dormansland during a running day in April 2018. Other preserved RFs which can be found at rallies and running days include rd RF432 (MXX 410), green RF113 (LYF 464), RF183 (MLL 570) and Green Line RF213 (MLL 600). 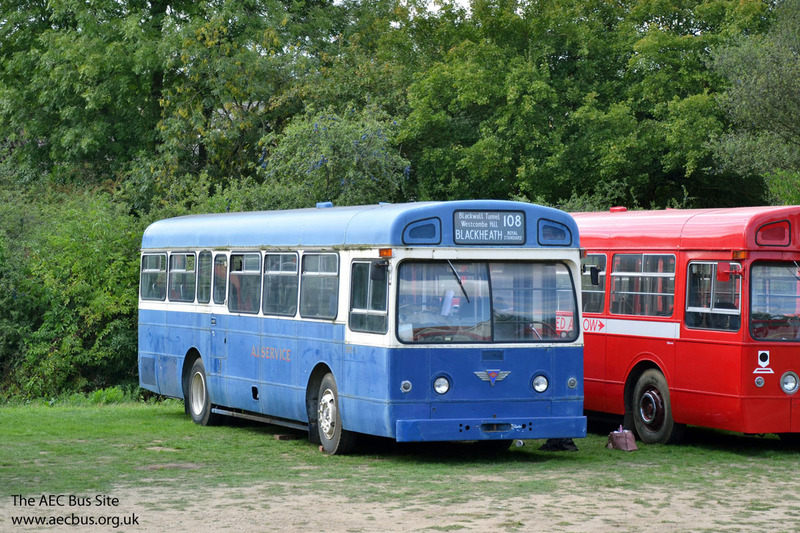 Further preserved RFs were at the 2009 Sandown Park running day and are captured by Ian Smith at Ian's Bus Stop. 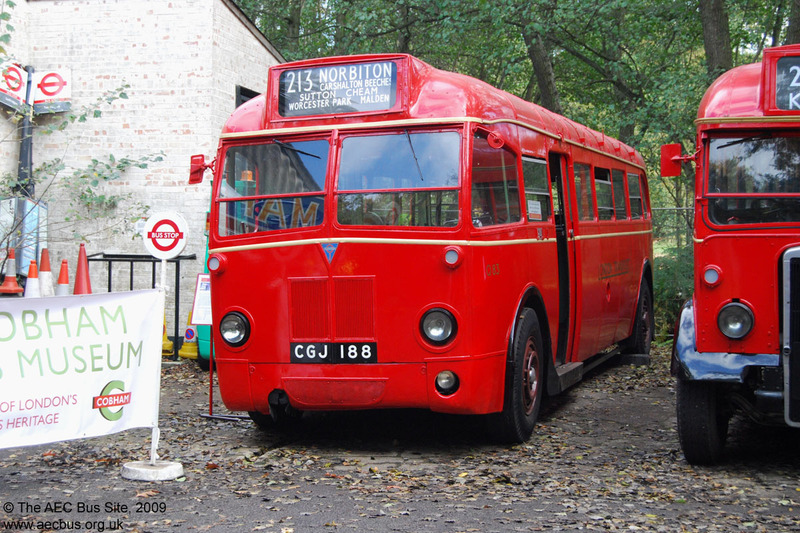 MLL 969 is preserved at the London Bus Museum as service vehicle 332W. RF517 (MLL 935) is one of four ex LT vehicles stored in a yard in Sherborne, Dorset, not currently in active preservation. 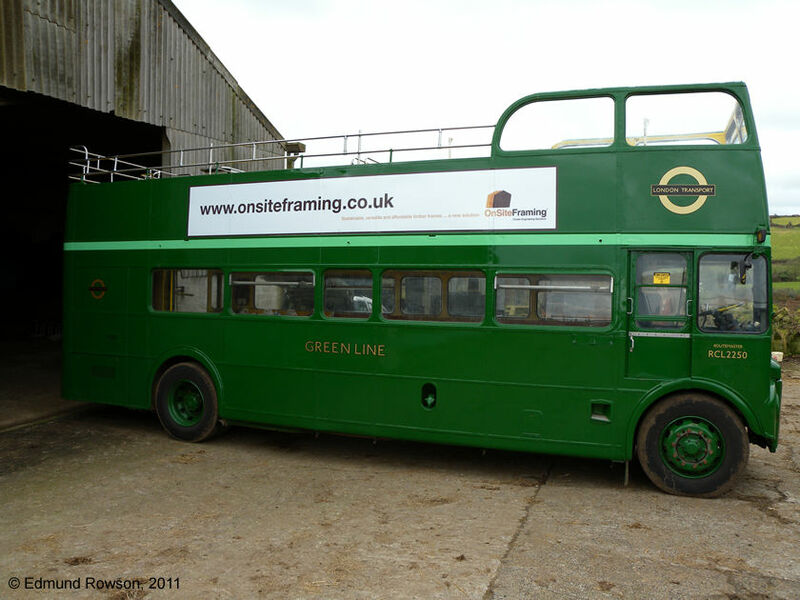 Greenline RF179 (MLL 584) changed hands a couple of times in 2017, but requires a lot of restoration after standing in a field for 30 years and may become a source of spares. Ex LCBS AEC Swift SM106 is owned by private owner Jonathan Wilkins. 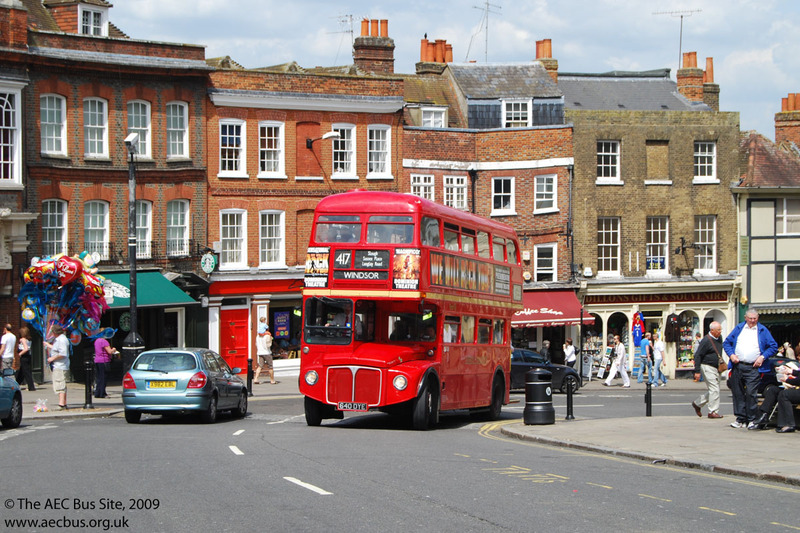 He also runs the London Country Bus Services website on which you will find details about this bus and the preservation effort. Another ex LCBS standard Swift in preservation is SM114 (BPH 114H). 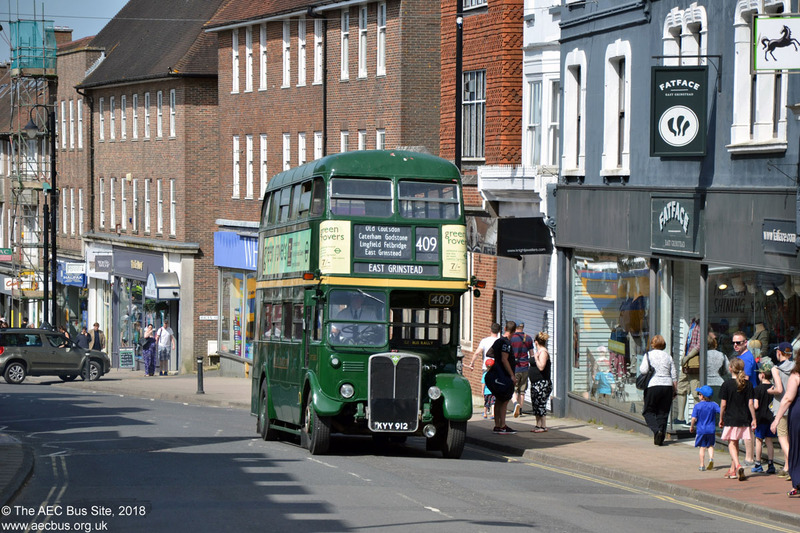 This changed hands in early 2015 and is now with the Bromley Bus Preservation Group. 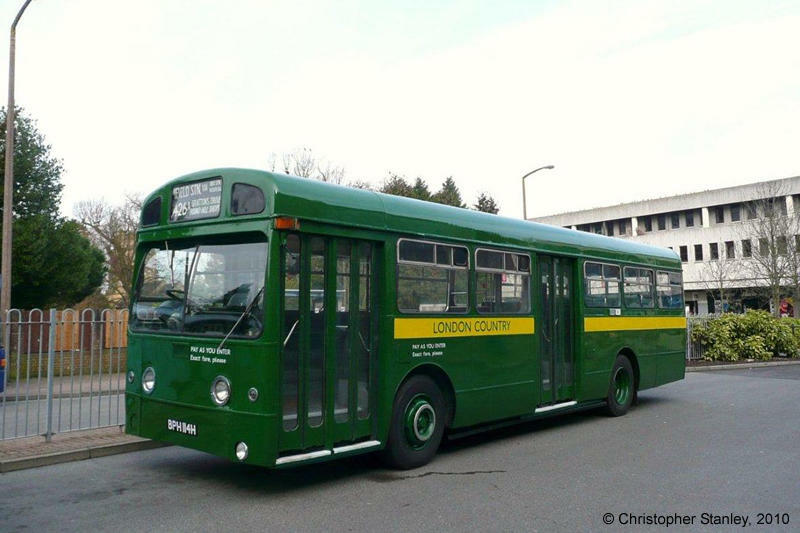 Alexander bodied former Green Line AEC Swift SMA8 (JPF 108K), one of the batch diverted from South Wales, has been restored by the London Bus Company. Sister SMA13 (JPF 113K) is also owned by LBC and is currently in store. 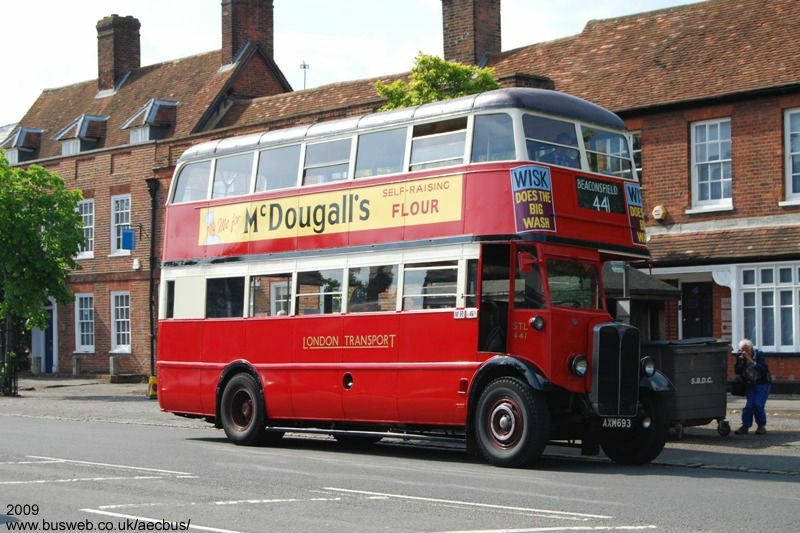 LT Marshall-bodied Swift SM1 (the first one) is in the active fleet of Roger Wright's London Bus Company, and used on Epping-Ongar Railway services during the summer. LT Swift SM30 (AML 30H) was in the fleet of Emsworth & District, and was reported under restoration in 2000 but has not been heard of since. The picture shows it at a running day in 1995 when it was still an operational vehicle. LT Swift SMS88 (AML 88H) is under restoration by the London Bus Company, and is pictured in 2018 still in A1 Service blue livery. Sister SMD91 (AML 91H) is also known to be in preseervation. 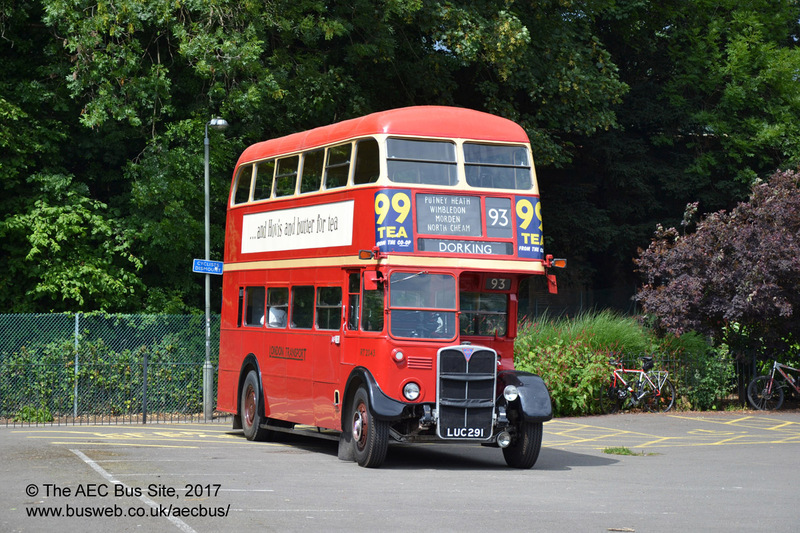 SMS97 (AML 97H) was acquired for PCV use by London Retro Bus Hire in 2014. It is pictured at North Weald EOR station in September 2018. LT Swift SMS274 (EGN 274J) ran for many years as a route bus in Malta, latterly registered DBY 623, and was heavily modified during its time there. Following a period in store following withdrawal in 2011, it was repatriated to the UK in 2016 as a heritage vehicle with Go-coach Hire. LT Swift SMS369 (EGN 369J) is owned by the London Bus Museum. It is a regular perfomer at their running days, and visitis other events. SMS678 (EGN 678J) has been residing in Essex for 25 years, but is intact and was mechanically overhauled shortly before its sojourn. It was started up again in the summer of 2010, and moved to a site near Leytonstone for continued preservation in 2011. MCW bodied SMS753 passed to a new owner in February 2009 and is being restored. The pictures show it coming on nicely but in need of a complete replacement set of seats. 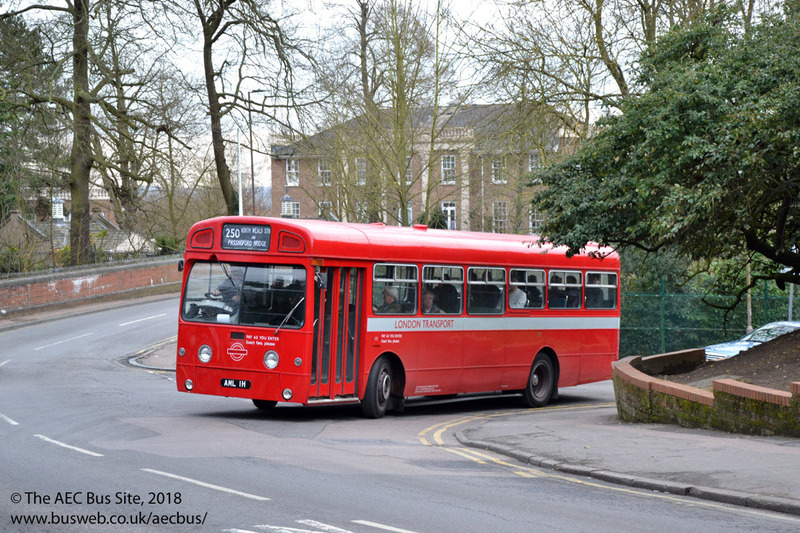 AEC "Merlin" (London Transport's name for a long wheelbase Swift) MBA444 (VLW 444G) has completed a long restoration and since 2016 it has been appearing at rallies in full Red Arrow livery. 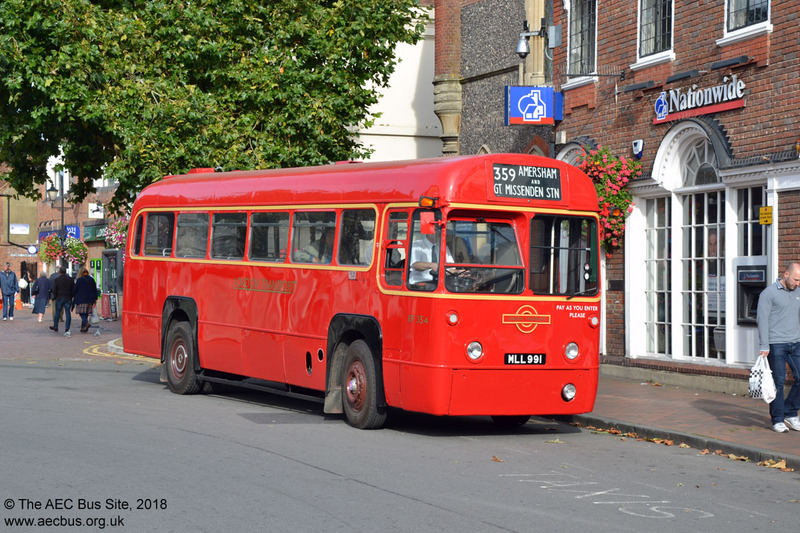 "Merlin" MBS539 (VLW 539G) was acquired by London Bus Company from a private preservationist and has been restored to operational condition in the heritage fleet. 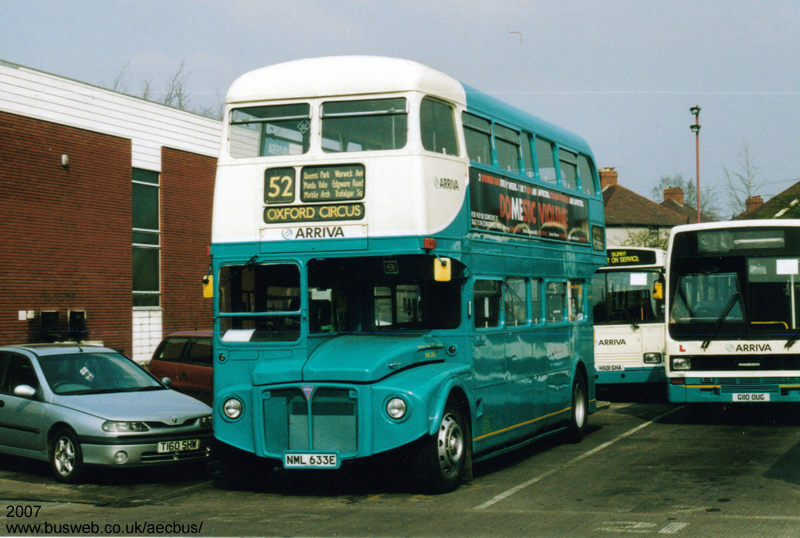 It had previously operated in service with Blue Triangle when it was owned by the proprietor of LBC. 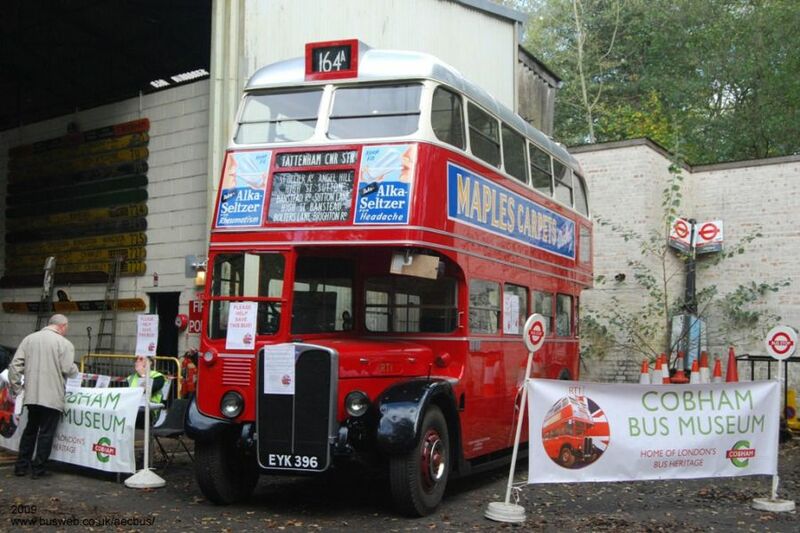 MBA582 (AML 582H) is preserved at the London Transport Museum, Acton, It ventures outoccasionally for rallies and running days. 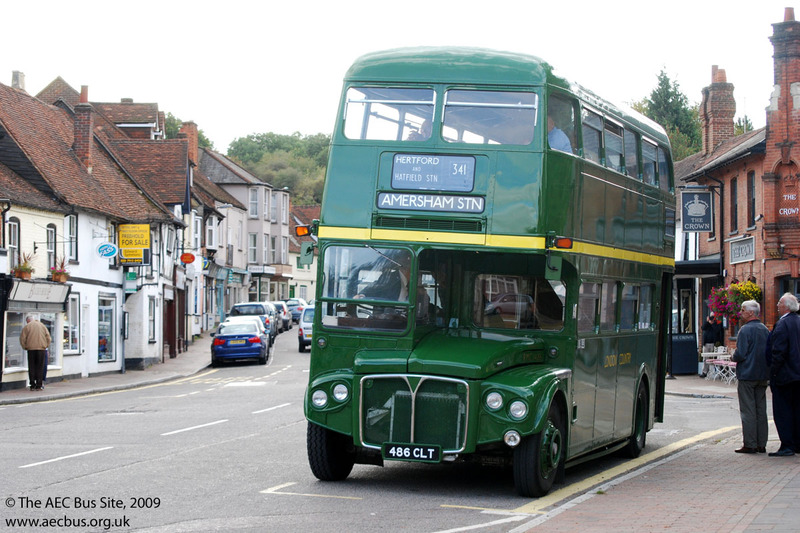 MB641 (AML 641H), is owned by a private owner in Hitchin, after being restored to operational condition by the proprieter of Bryans of Enfield. RW3 is one of three Willowbrook bodied 2-door Reliances bought by London Transport for experimental use on country routes. 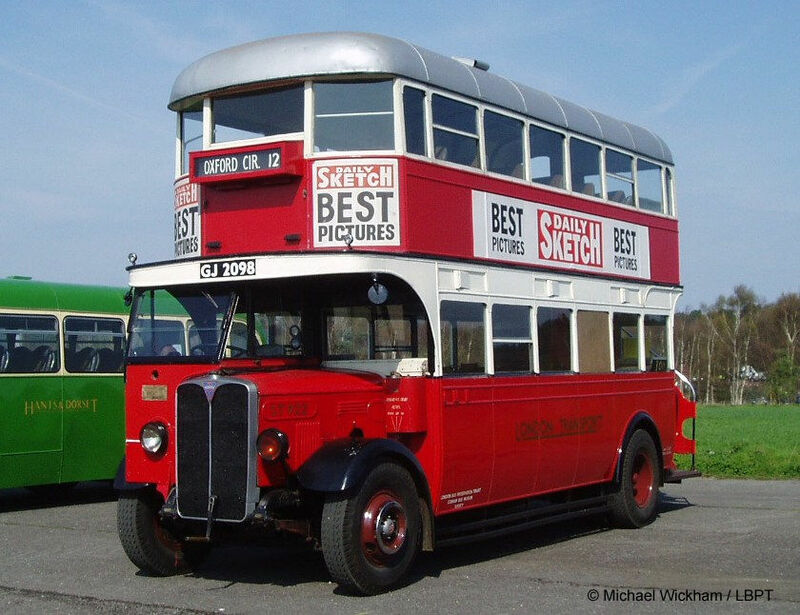 Bought for preservation in 1988, it has been superbly restored after changing hands in 2010 and is currently on long term loan to the London Bus Museum. 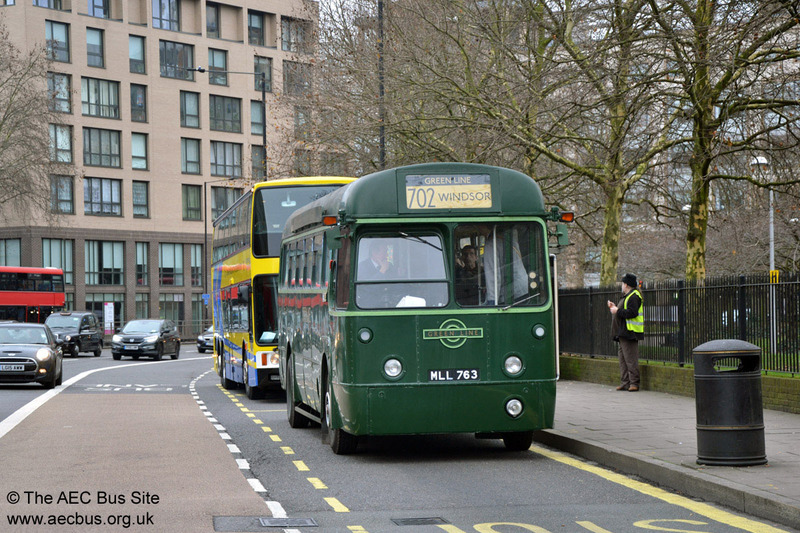 Preserved Green Line Park Royal bodied AEC Reliance RP21 (JPA 21K) passed to the London Bus Company heritage fleet from its private owner in 2012. 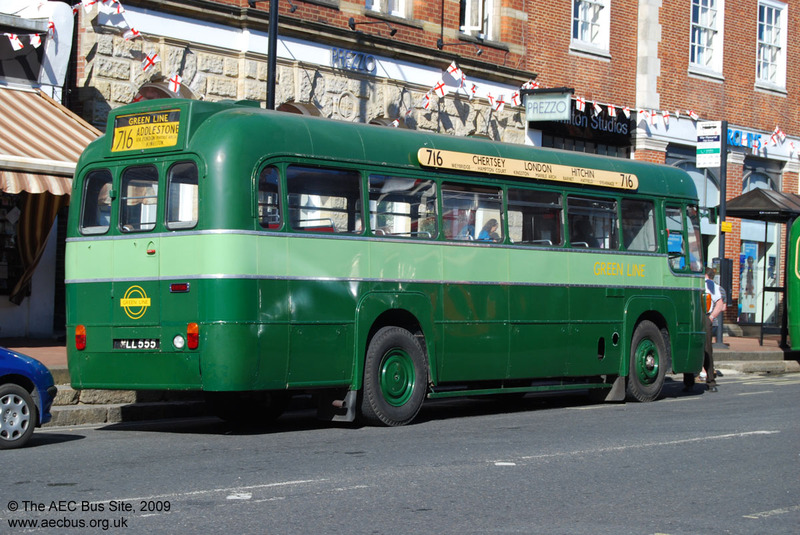 Last of batch RP90 is preserved in original Green Line livery at the London Bus Museum and appears at rallies in the south. This and RP21 are the only two of the batch of 90 still in existence. Green Line Reliance/Plaxton P3, which was bought for tours and National Express duties, changed hands in 2011 and is now owned by Richard Walker and Fred Lawrence (Colne Estuary Preserved Buses). 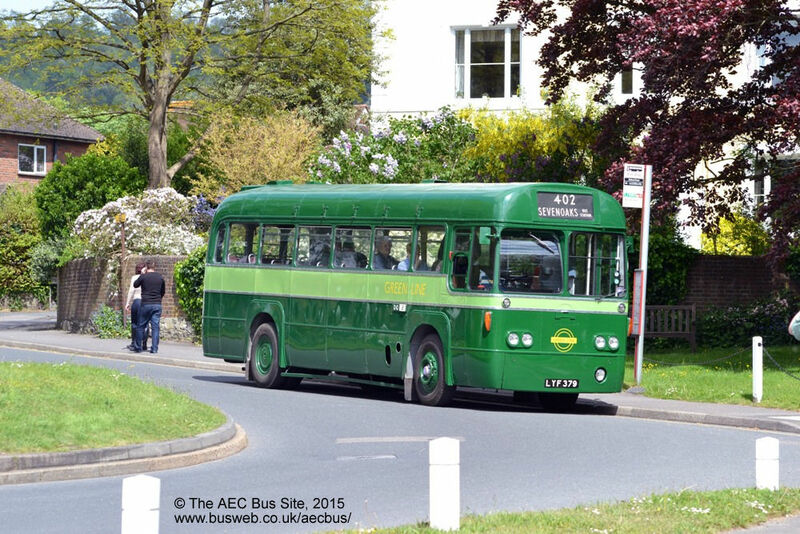 Green Line AEC Reliance/Duple RB51 has moved in preservation from Ensignbus to the Bromley Bus Preservation Group. 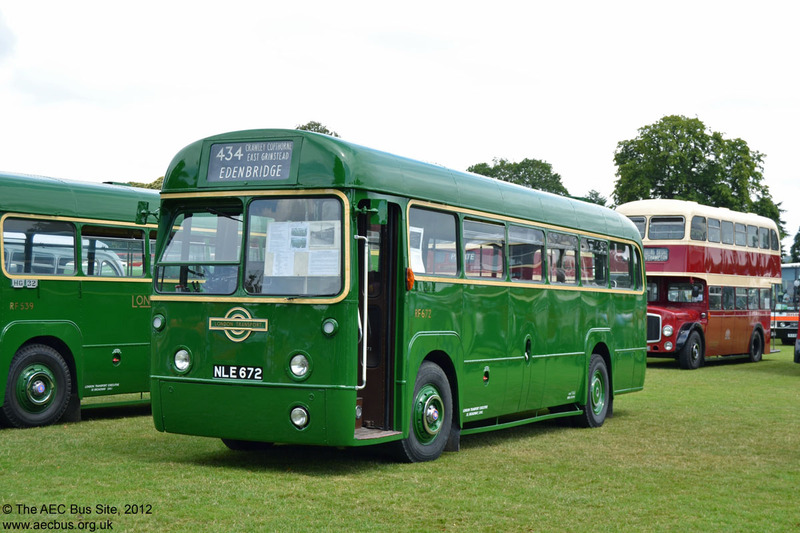 It was pictured in the display line-up at Amersham during the 2011 running day with a previous owner. Former Green Line AEC Reliance/Plaxton RS136 passed to Stephen Bryce of Dunn-Line in 2006. He will restore it in the livery of Lincoln City Transport, in who's fleet it ran for a number of years after its Green Line service. 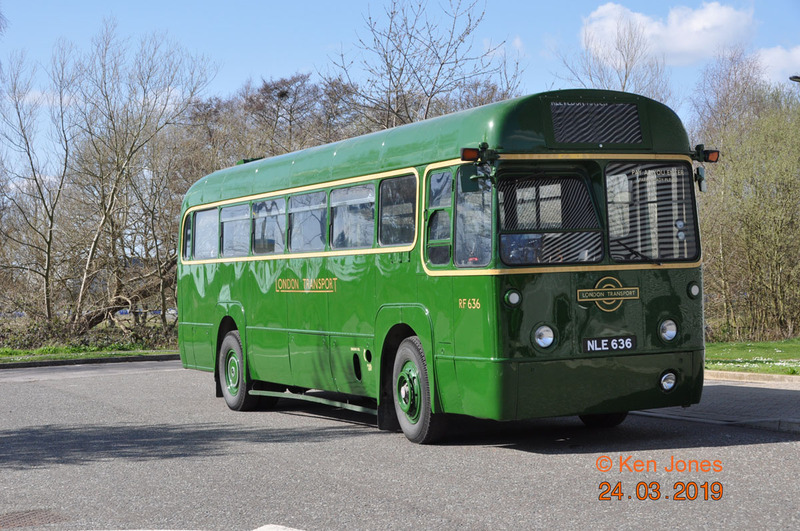 Mike Assiph of the Taybus Vintage Vehicle Society has purchased one time Green Line RS137 from last owner Meffans of Kirriemuir for preservation and ultimate restoration into the 1980 Green Line Golden Jubilee livery it carried when new. The second picture shows it in this livery in January 1980. The last Green Line Reliance, RS150 (EPM 150V) passed into private preservation in 2018 following a stint with Just Travel of York. It will be painted into the livery of Anderson Travel with whom it had previously operated. 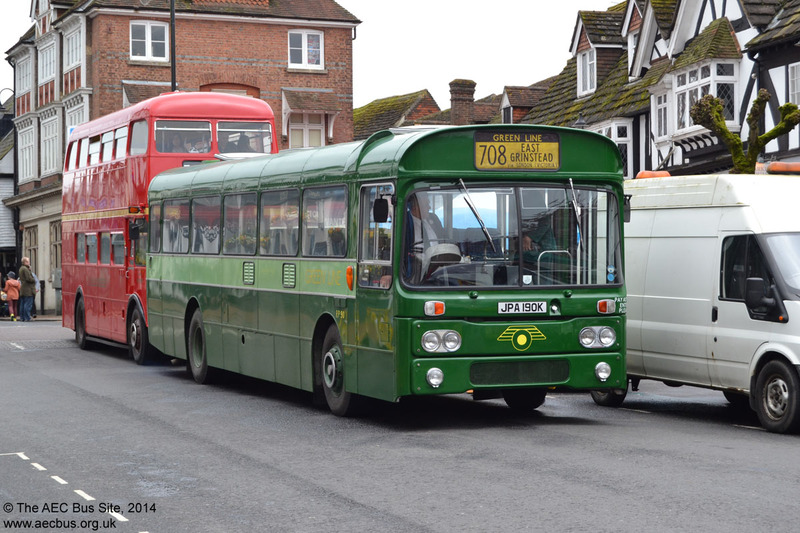 Another of the older generation Regents, the London Bus Museum's STL2377 was giving rides at the 2009 East Grinstead running day. 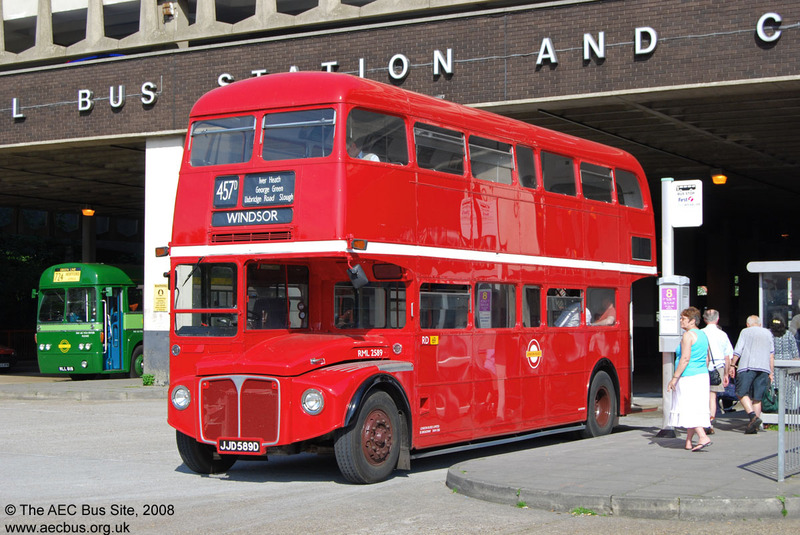 Similar STL2093 (DLU 92) is preserved with Ensignbus. Preserved STL2692 seen at a running day at Faversham in May 2016. Half of the first of a dynasty! 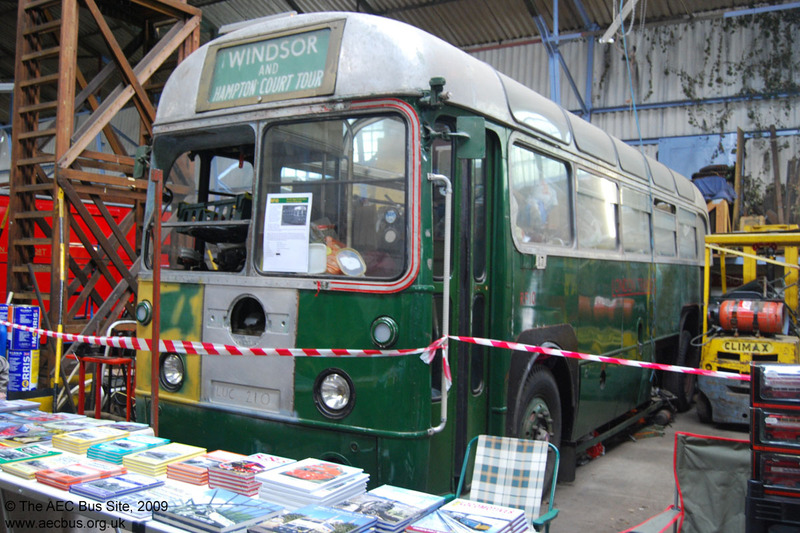 The body of RT1 at the Cobham Bus Museum in 2009, where it was stored pending sale. Following an appeal to keep it in the country it was purchased by LBPT and now resides at their current premises. The original chassis of RT1 was dismantled at Chiswick in 1946 and it now sits on the chassis of RT1420. So which is the oldest RT chassis currently in preservation? RT172 is preserved by preserved by the Aire Valley Transport Group. After withdrawal by LT in 1958 it ran in the Bradford fleet for 10 years until 1968, and is preserved in Bradford livery. 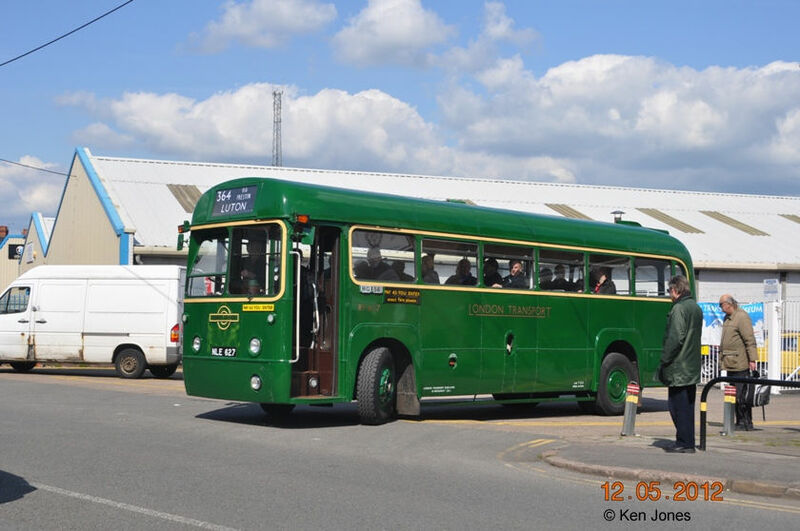 Green RT593 was seen glistening in a fresh coat of paint outside the Go-coach depot during the 2015 Sevenoaks running day. 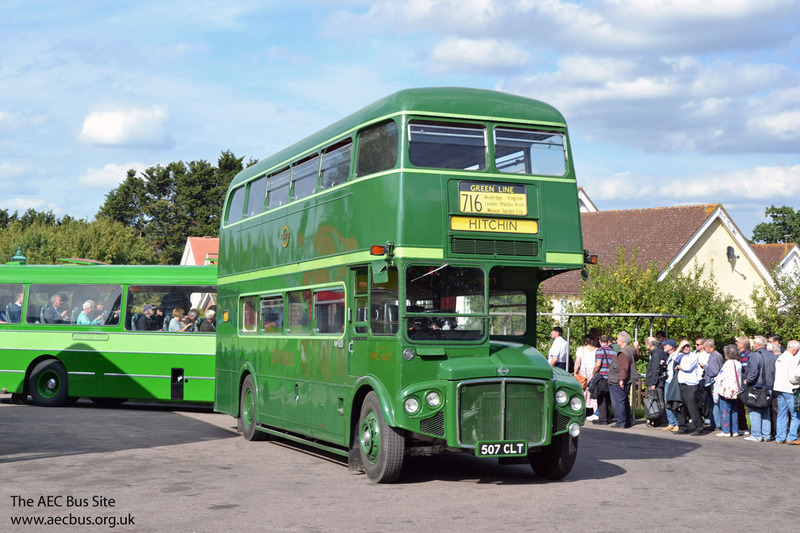 The Purley Transport Preservation Group's RT604 (HLX 421) is in NBC green livery, and is a regular performer at running days in the South East. 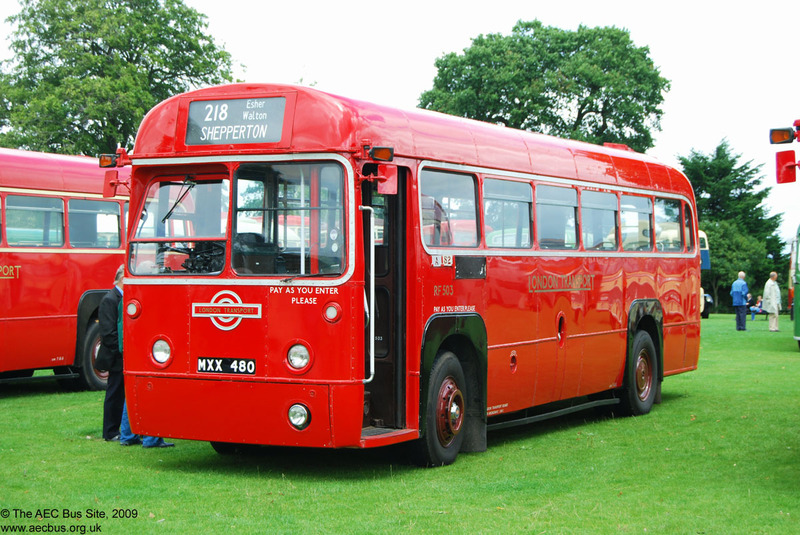 Red RT935 (JXN 325) pictured at the Alton rally in 2009.It subsequently passed to Crosville of Weston-super-Mare and sold again in 2016. RT981 (CSL 498 ex JXN 9) and RT2553 and RT2553 (LYF 278) are preserved by the former owners of Carousel Buses. 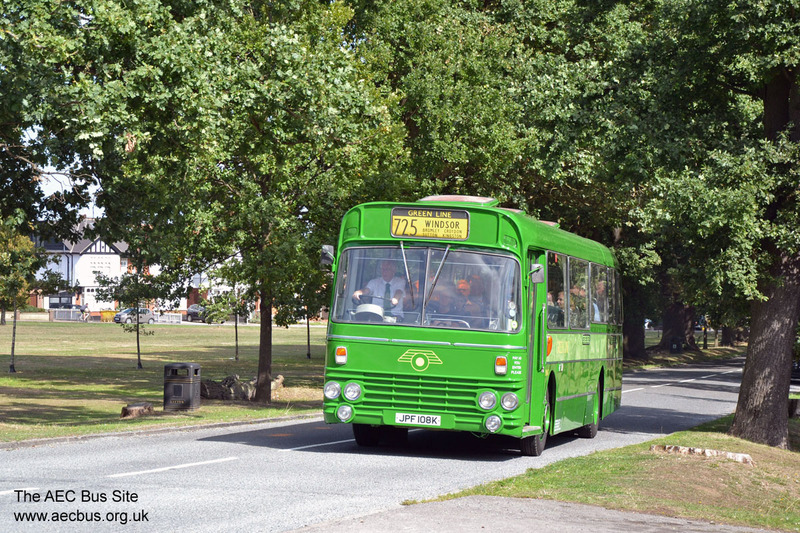 RT1018 (JXN 46), which survived for many years as a trainer at Hemel Hempstead, is preserved in Lincoln green by private owner Mike Lloyd. 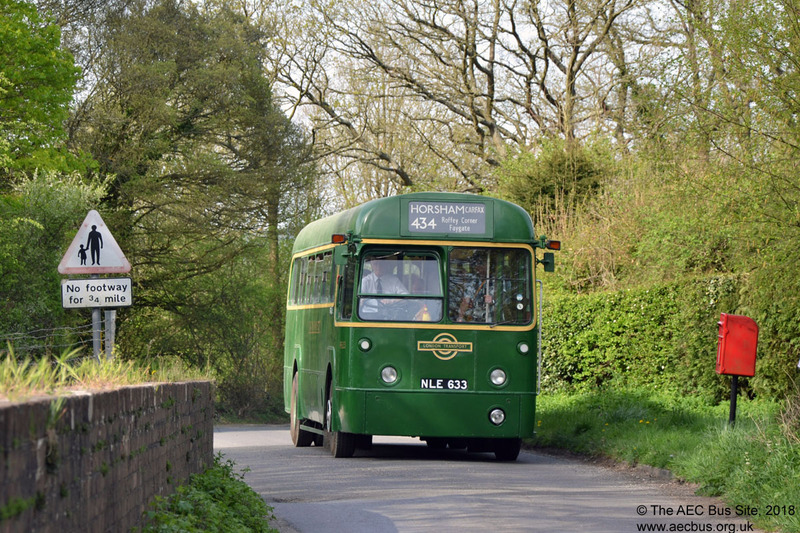 RT1347 (KLB 596) is with a private preservationist in Leicestershire. 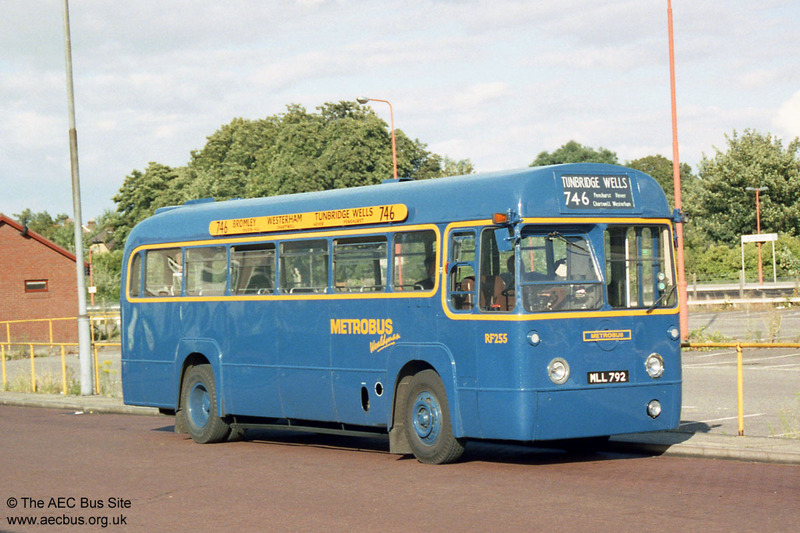 It has been painted in the livery of Brown's Blue Bus Service, who operated nine RTs in the Leicestershire area in the early 1960s. Preserved RT1574 stands in the sun at Alton. Another that is preserved well away from its London haunts, RT1599 was in action at the 2011 Bristol rally and running day (picture by Ken Jones). RT1798 (KYY 653) in LT red at the 2018 Detling rally. RT2043 (LUC 291) is preserved in LT red livery. Green RT2083 at Windsor during a running day in May 2011. RT2177 (KGU 106) is another preserved in LT red livery. 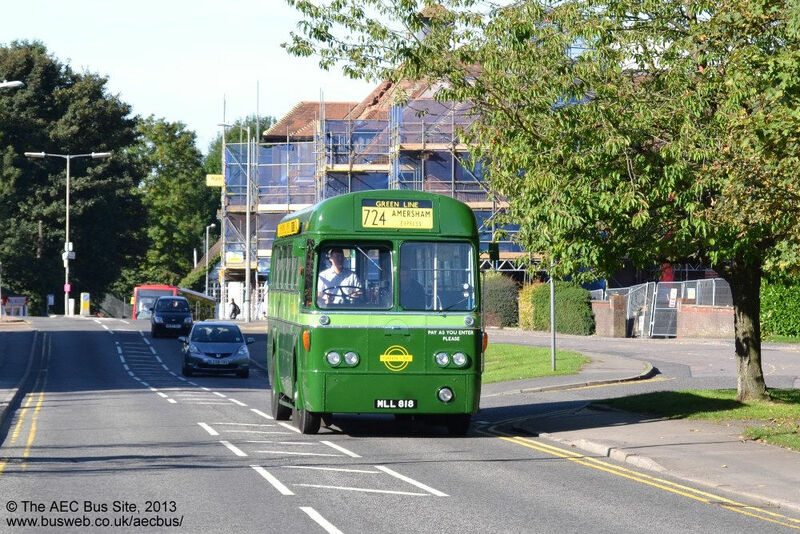 RT2494 (KXW 123) is one of three which ran as open-toppers with Guernseybus and is preserved in their livery as number 14. It appears in this guise at rallies. Another of these three, RT3435, is in the London Bus Company (ex Blue Triangle) operational fleet, and RT1377 moved to Malta in 2008. RT2657 has been preserved in the Paris Transport Museum since 1965 and is still in its 1965 condition with roof mounted number box. 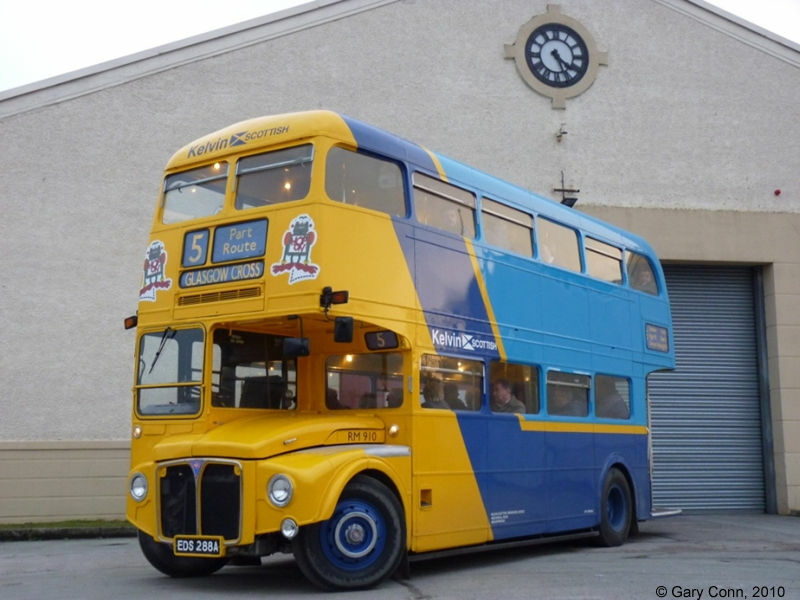 It was relocated on long term loan to the London Bus Museum in 2013. 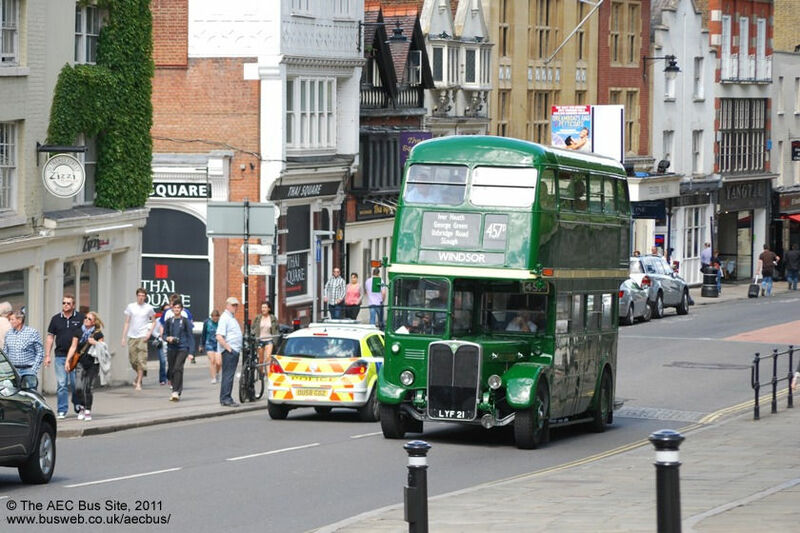 RT2688 has been preserved since 1981 and is seen here during the RT75 celebrations in London. 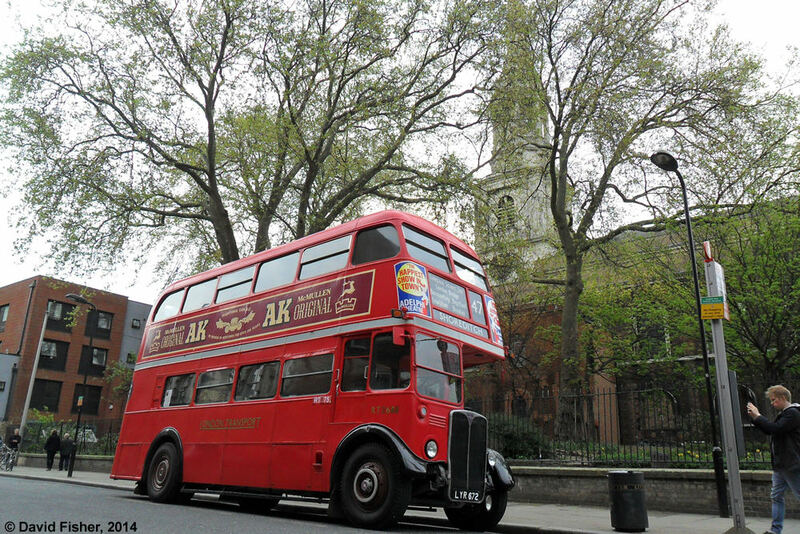 The location is Shoreditch Church - a terminus that it served regularly during it's final years whilst at Catford and Bromley Garages between 1973 and 1975. 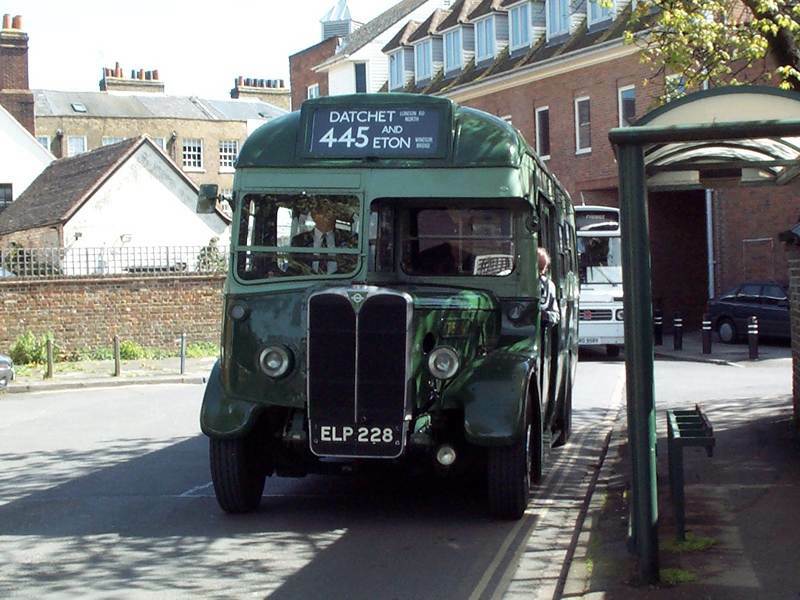 Also preserved at the London Bus Museum is RT2775 (LYR 826). This was restored in 2012 to the condition it was in when it was used for a promotional tour of the United States. 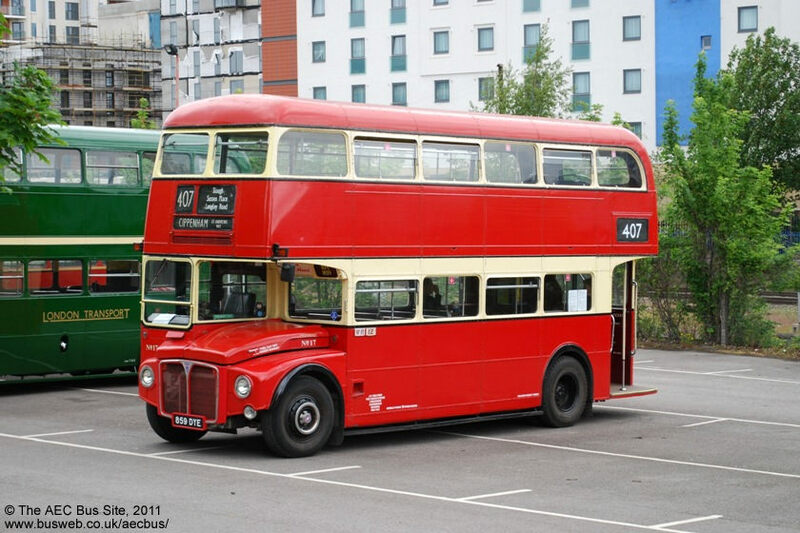 RT2794 (LYR 964) is preserved in London red by a private owner in the Manchester area. RT2976 (NLE 744), which was almost derelict after a long time in a yard in Norfolk, passed to Jon Pratt (proprietor of Crosville Motor Services) in 2011, and is currently undergoing restoration by Marden Commercials of Benfleet. 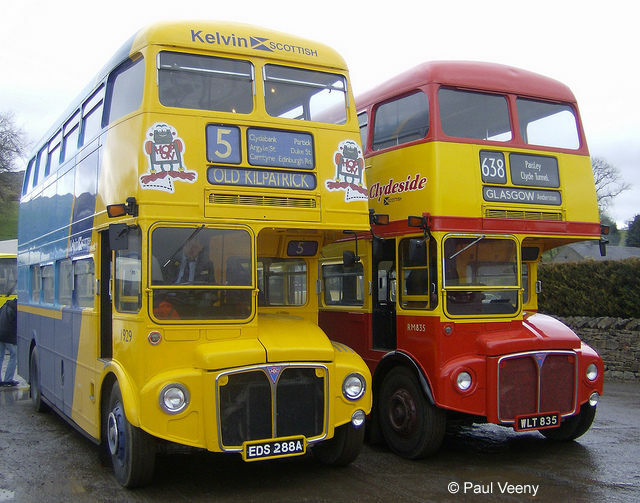 RT3028 (NLE 918) and RT3143 (KYY 872), both Weymann bodied models, are in preservation with an owner in Kent. 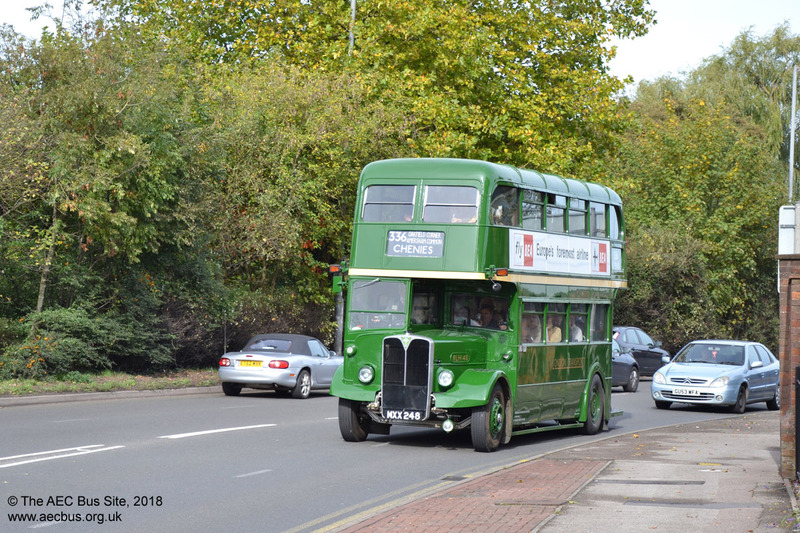 RT3183 (KYY 912) is another preserved in Lincoln green livery and was seen giving free rides in April 2018. 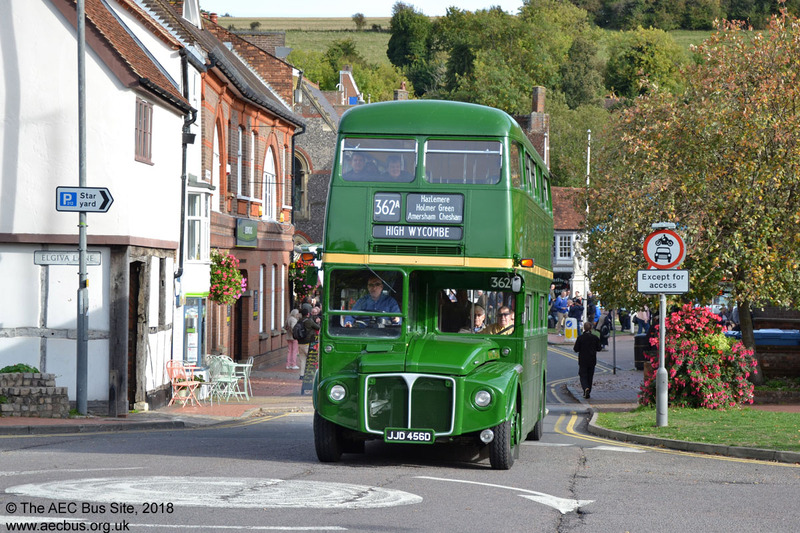 Green RT3254 (LLU 613) at Chesham during the Amersham/Chesham 2018 running day. 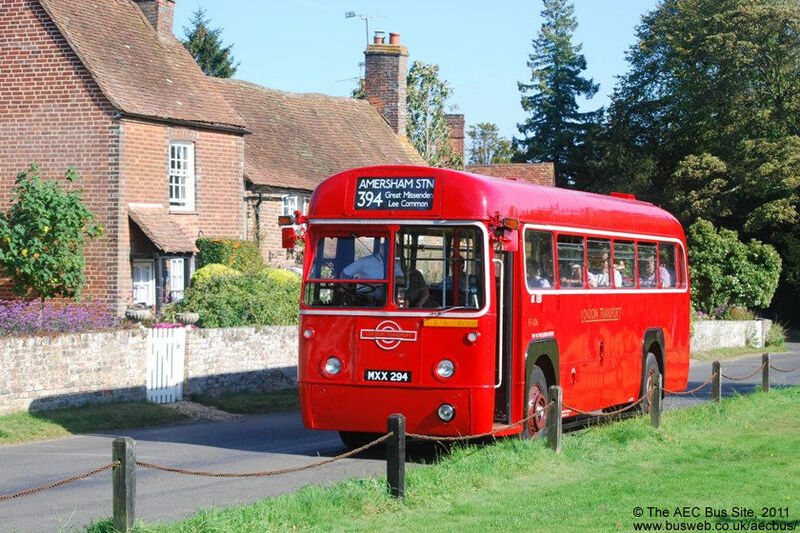 RT3491 (LYR 910) is preserved at the London Bus Museum and is well known in the South East for its regular rally appearances. 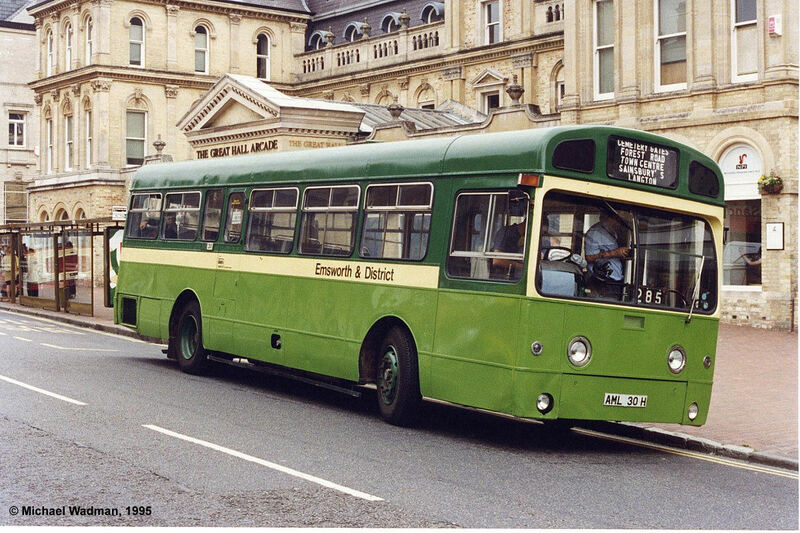 Lincoln Green RT3496 (LYR 915), which has the body from the original RT606 hence the roof top mounted number box. 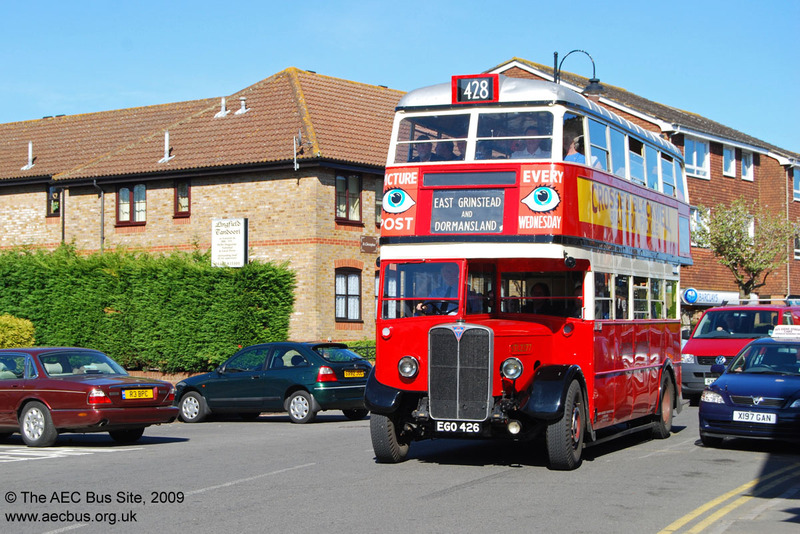 RT3775 (NLE 882) is privately preserved, in company with Routemasters RM811 and RML2731. 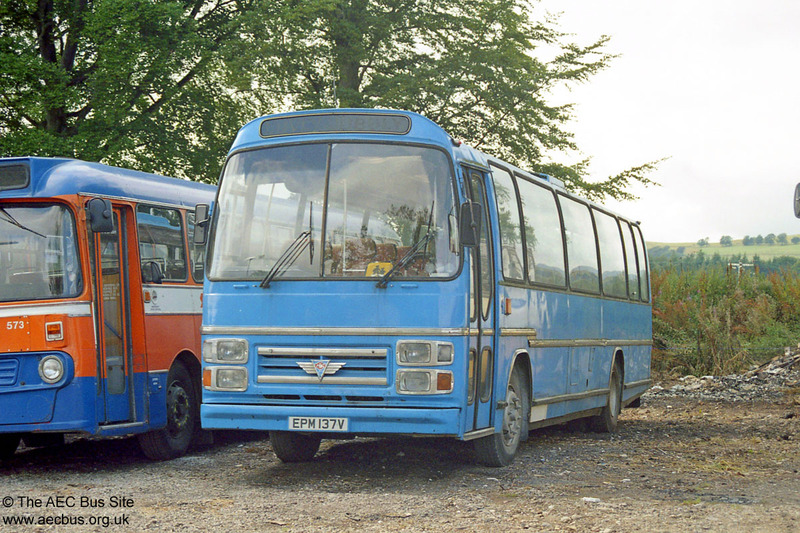 It had previously been in the London & Country and the Ensignbus heritage fleets (the picture shows it with London & Country in 1994). RT3902 (LLU 701) is preserved with operator Sharpes of Nottingham. 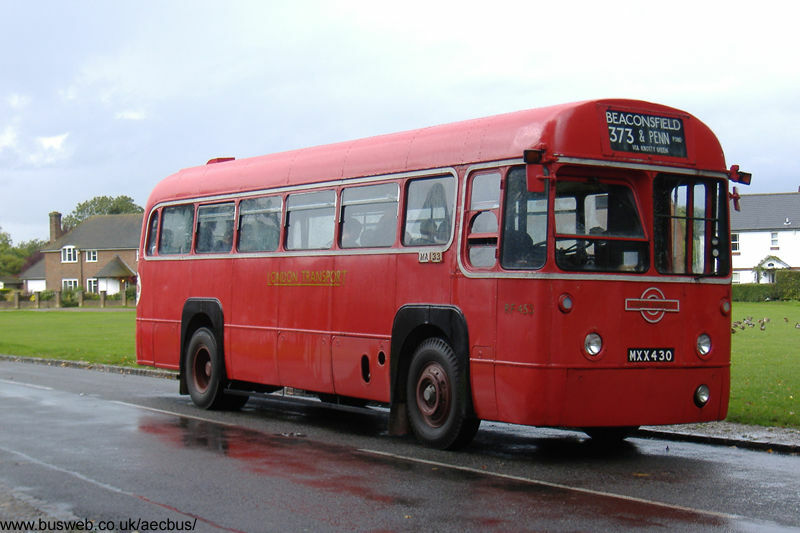 Saunders bodied RT3955 (LUC 114) returned to the UK for preservation in 2006 following a stint in France with Londonbus France, and is with a private owner in the north of England. Preserved RT4139 at the South East Bus Rally rally in 2018. 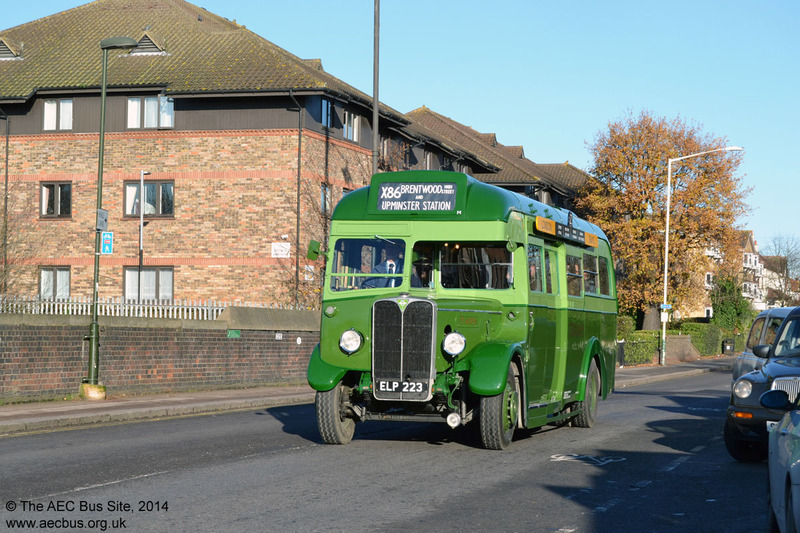 Green RT4494 is preserved in the Lincoln area and was pictured in November 2014. 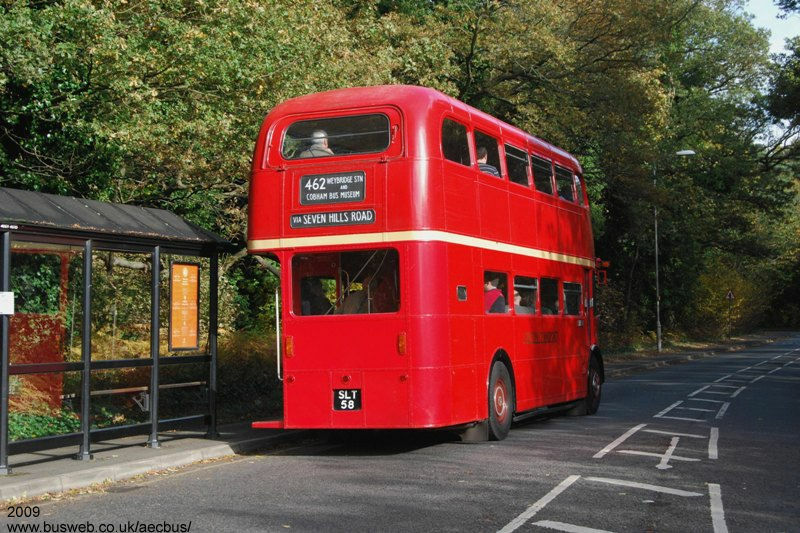 RT4779 (OLD 566) is preserved at the London Bus Museum. It was seen at Leatherhead during a running day in July 2017. 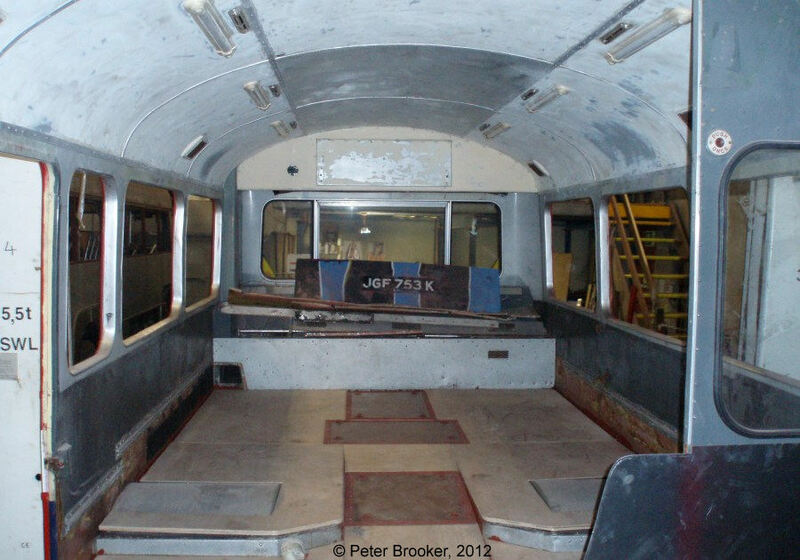 A picture of this bus during restoration is on the Before and After page. Lowbridge AEC Regent RLH32 (MXX 32) is preserved by Timebus Travel. It was seen at Amersham in 2008 in the livery of Leeds independent Samuel Ledguard with whom it ran after it left London service. 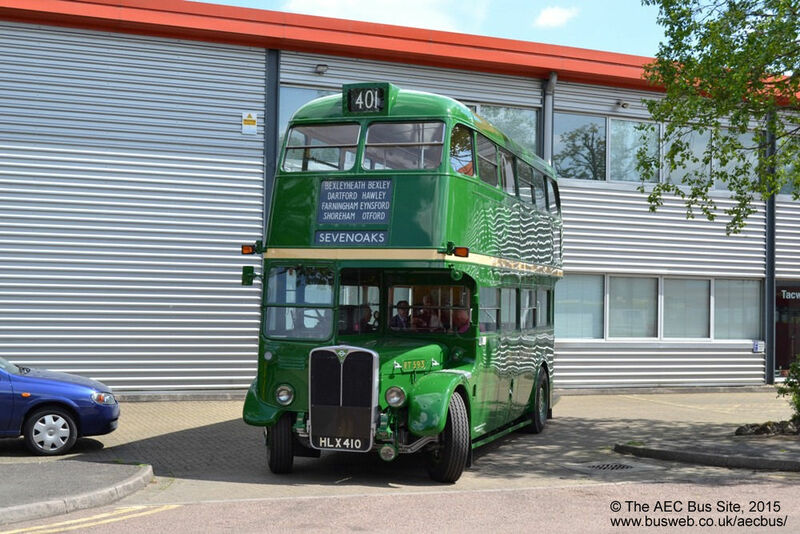 Lowheight AEC Regent RLH48 is preserved at the London Bus Museum following a long time in the ownership of Timebus Travel. RT961 (KGU 235) is preserved by Roger Wright, owner of heritage operator London Bus Company, which also has RT2150 (KGK 959), RT2799 (LYR 969), RT2911 (MLL 658) and several others in store, and has operational RTs in service. RT594 (KLB 716) and RT329 (HLX 146) are among four ex LT vehicles in store at Sherborne, Dorset, not currently in active preservation. 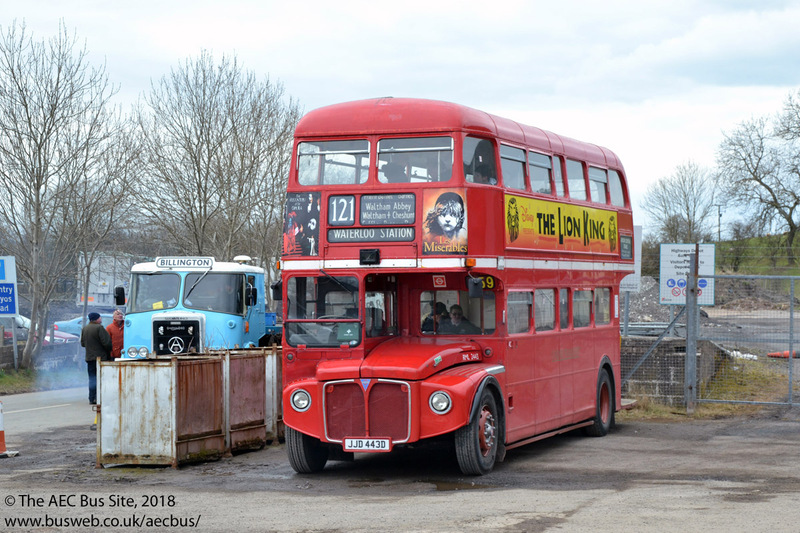 RT1884 (LLU 770) and RT4442 (NXP 796) changed hands in 2018 and are awaiting restoration with the new owner. 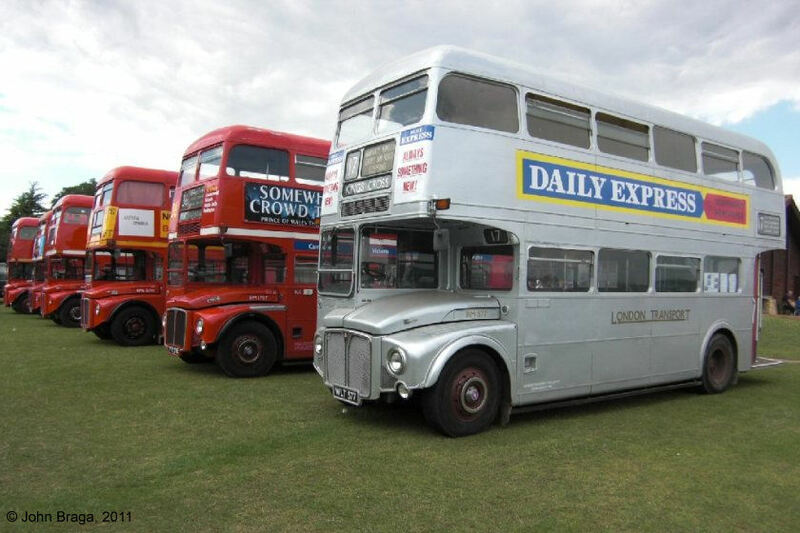 Other preserved Regents which can be found at rallies and running days include RT113 (FXT 288 - a 1940 model), RT227 (HLW 214), RT1702 (KYY 529 -owned by the RT1702 Preservation Society) and STL1470 (CXX 457 - as tree lopper 971J), and members of the London Bus Company and Ensign operational fleets. 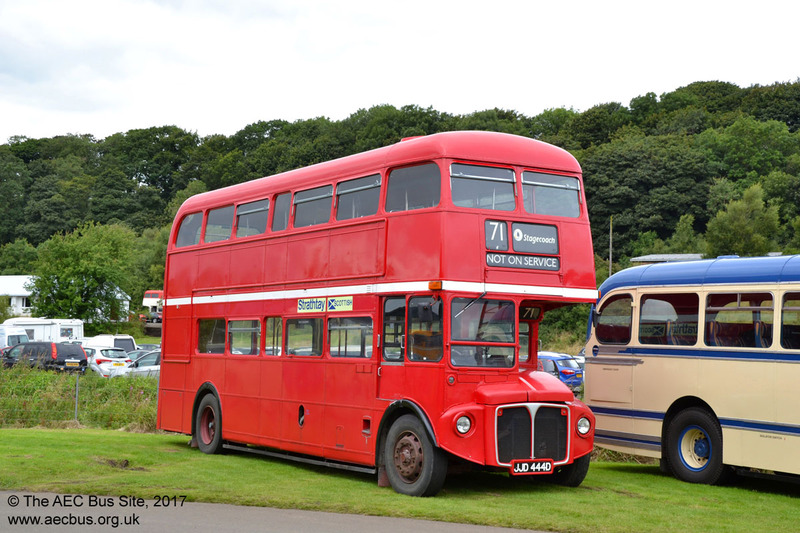 The first Routemaster, prototype RM1 has been restored to working order at the London Transport Museum and now appears at Rallies. 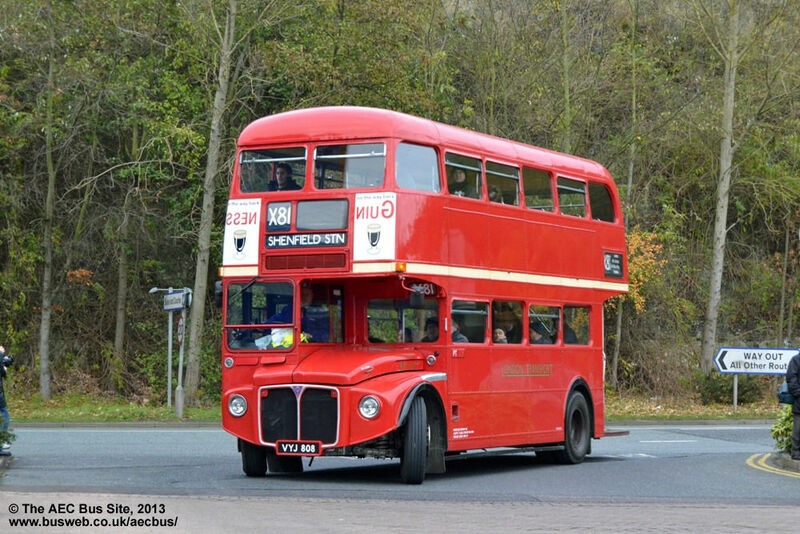 The second Routemaster prototype RM2 is also at the London Transport Museum. 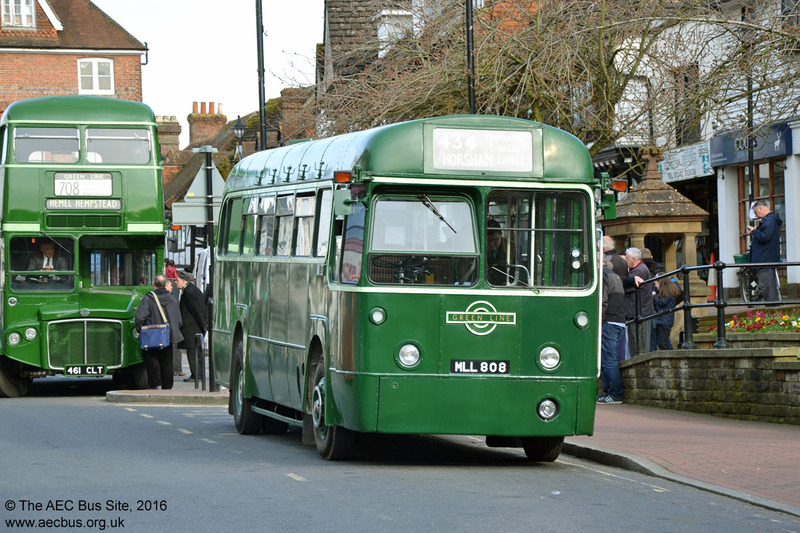 It turned out for the 2016 East Grinstead running day. Prototype Leyland powered Routemaster RML3 (in this case the L means Leyland rather than long) is at the London Bus Museum and is licensed as a PCV to run on their service to Weybridge station. 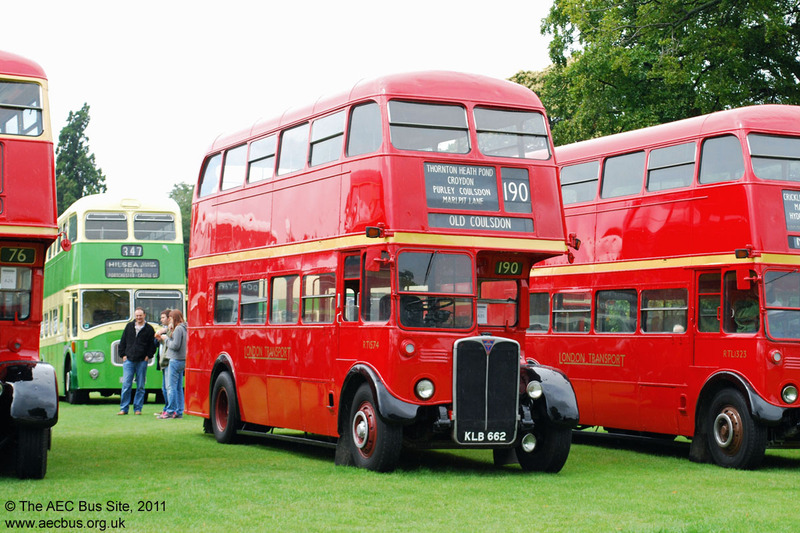 The prototype Routemaster coach, RMC4, has been preserved for many years - originally by London Country. It is now in the operational fleet of The London Bus Company (so doesn't really qualify for this page but is too special to leave out). Unique forward entrance FRM1 is at the London Transport Museum and occasionally ventures out to rallies. 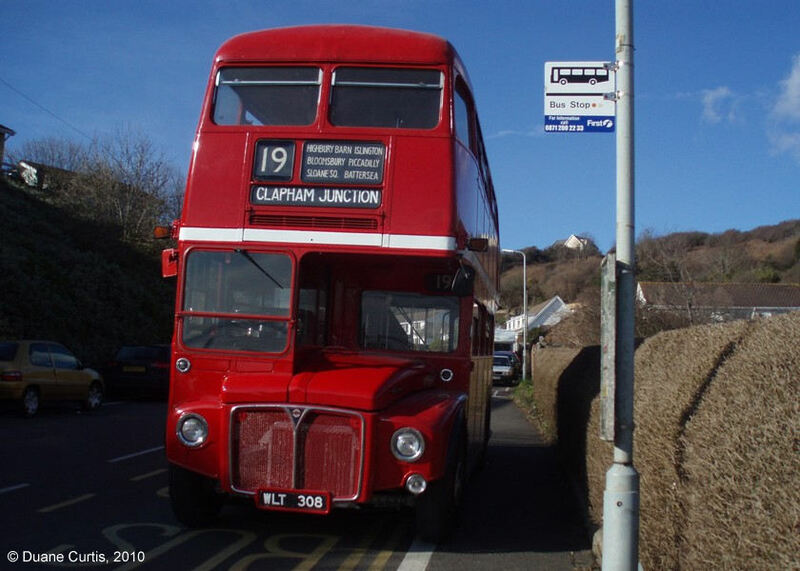 The first production Routemaster, and the last to enter passenger service with London Transport following 18 years as a test vehicle, RM8 is now preserved by the RM8 Club. 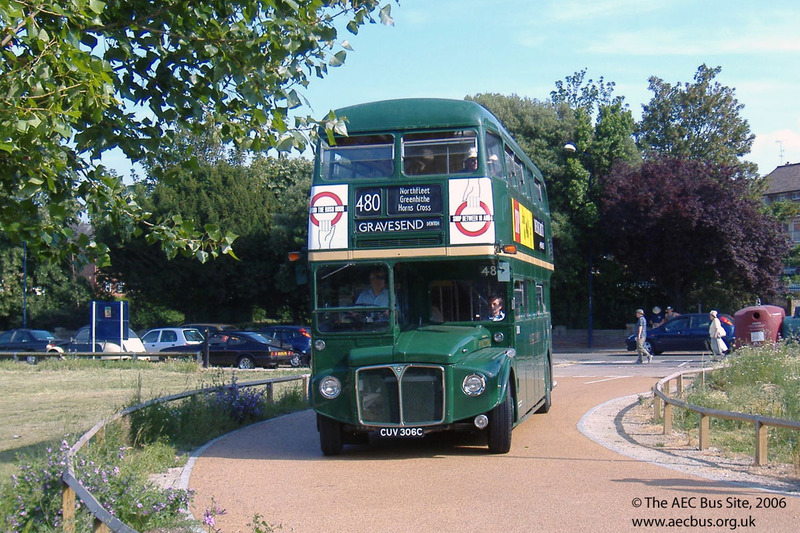 Early production Routemaster RM44 is preserved in the livery and identity of Southend Transport 122. 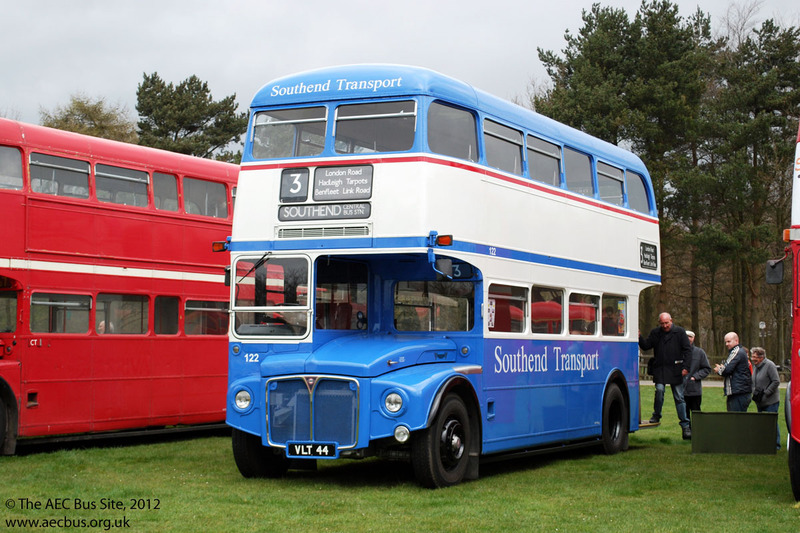 It was one of a number purchased by Southend from London Transport. 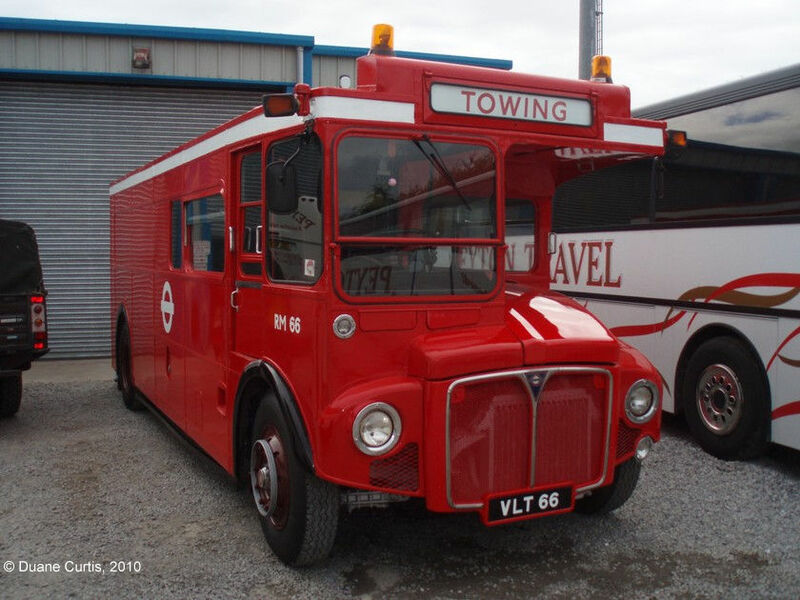 Towing bus RM66 is preserved by the RM66 Group and kept at the Swansea Bus Museum. Open top RM120 (SSL 809 ex VLT 120), latterly with First London, was sold to a private owner in 2008 for preservation. Private owner Jim Carr purchased RM196, and has it back out on the road following a respray. RM308 is with Duane Curtis in Swansea and is regularly rallied in Wales and the south-west. The picture was taken at Mumbles in 2010. RM316, which last ran in servive with Reading Mainline, is with a preservation owner in Ireland. Another preserved ex Reading Mainline is RM244 (which is currently registered VLT 250, the plate from RM250) in Wales. 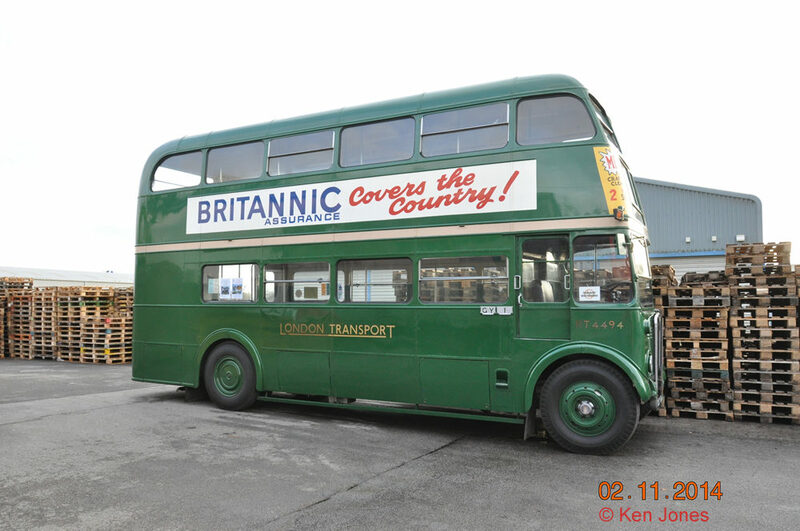 RM378 is with Dave Green, Travelgreen, Doncaster, currently registered WFO 410, and is being immaculately restored. 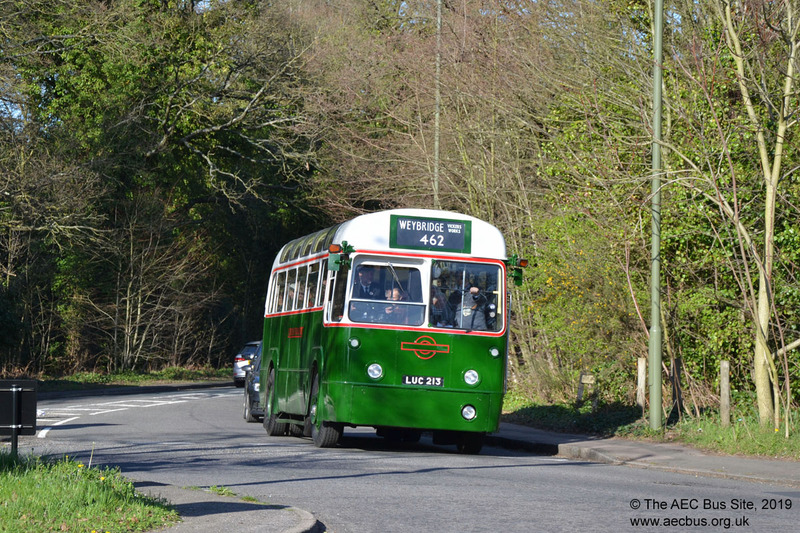 RM446 (WLT 446) passed into the preserved fleet of Weston-super-Mare based Crosville during 2017. Preserved RM506 was seen at the Aston Manor Transport Museum's farewell event in October 2011. The collection has moved to an alternative site at Aldridge but it is not yet open to the public. RM577 is preserved in unpainted silver livery (which was carried for a while by RM577's body when it had the identity RM664) by John Braga, and is appearing at rallies. John also has a website dedicated to AEC Regals. 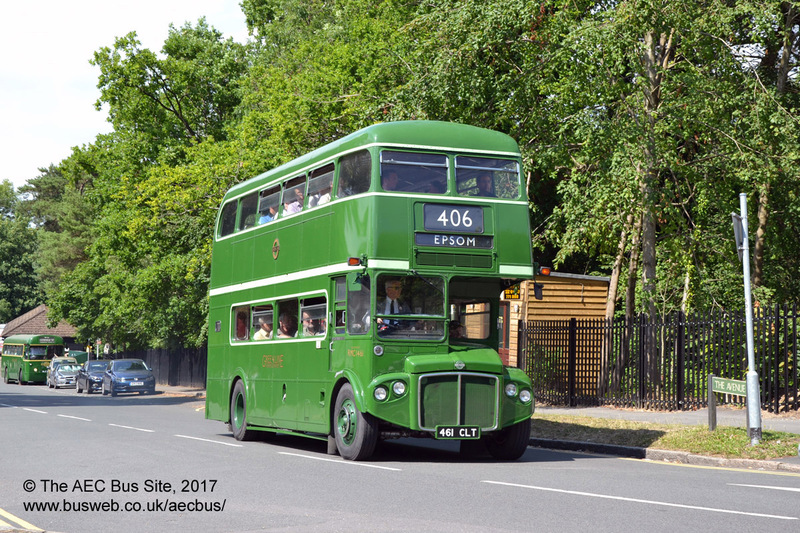 RM597 (WLT 597) has been restored to original London Transport condition and appeared at the Imberbus event in 2017. Preserved RM613 was seen working on loan to Southern Transit for one of their Bank Holiday special servces in May 2018. 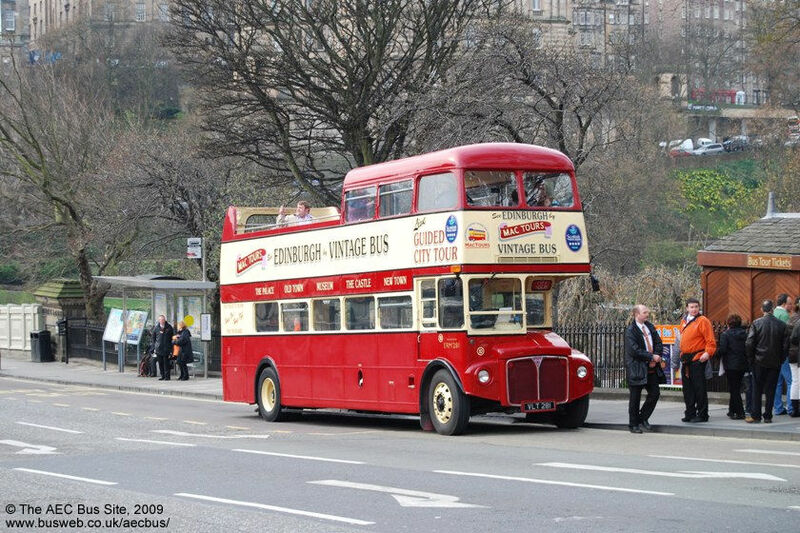 RM759 (WLT 759) is preserved by Michael Roulston at the Beith Transport Museum in a version of Glasgow City Transport livery carried when it operated a Glasgow city tour for First Glasgow. RM835 is preserved by the Clydeside Preservation Society in the attractive livery of Clydeside Scottish, with whom it ran after initial withdrawal by London Transport. 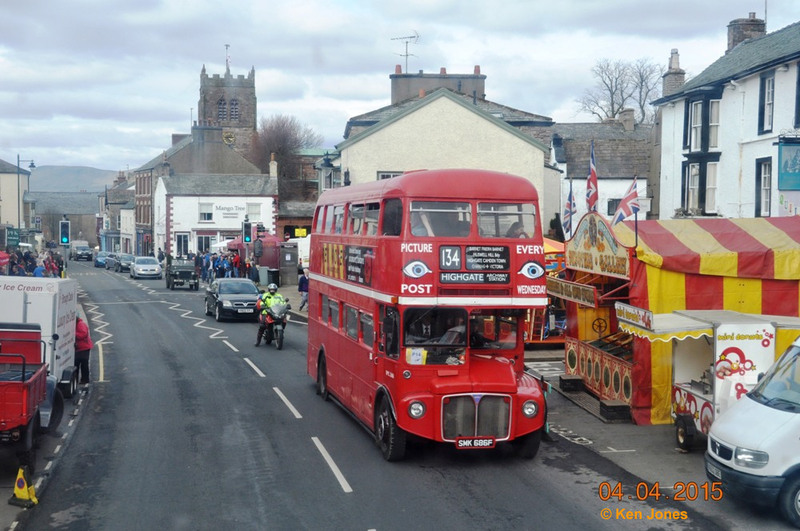 It was pictured at the Easter 2018 Kirkby Stephen Rally. RM910 is preserved in Kelvin Scottish livery, representing the period in the 1980s when it operated for Kelvin as their 1929. It is owned by Gary Conn and Martin Guerr and kept at the GVVT Bridgetown depot. This picture of RM835 and RM910 together was taken by Paul Veeny, who wouldlike to acquire any other RM with Kelvin connections. RM887 was sold in 2011 to a private owner in Eastbourne. 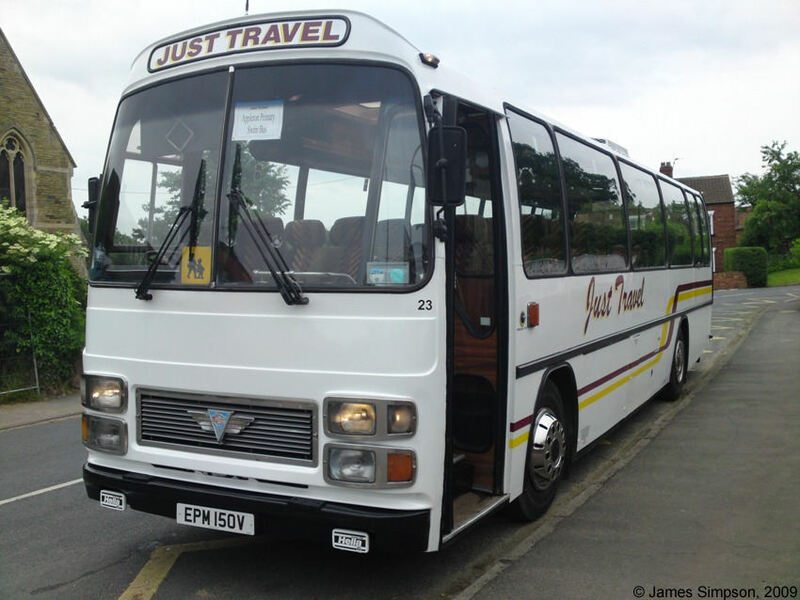 It has been loaned to Classic Bus North West for a Blackpool seafront service in 2012, and is now registered 202 UXJ. 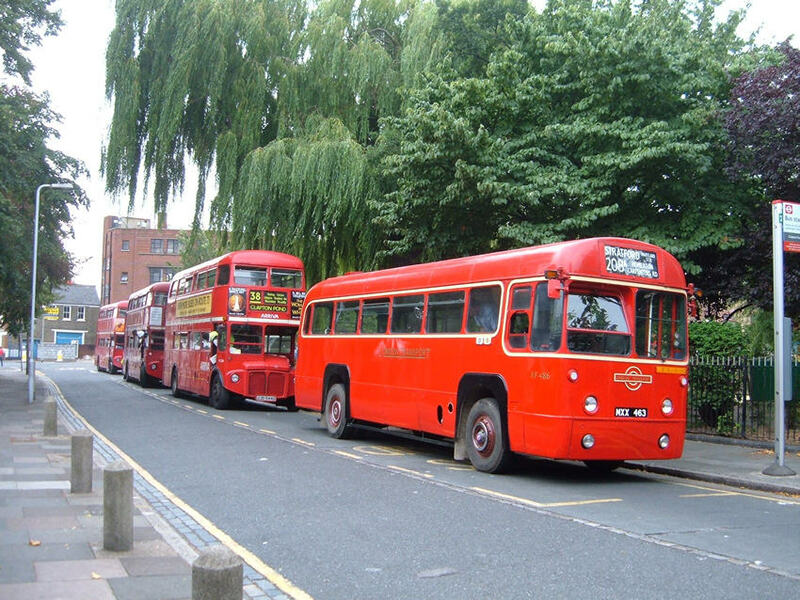 RML896 and RM2198 are preserved by the former owners of Carousel Buses, in whose fleet they last ran as operational vehicles. RM928 at the 2009 Alton rally. 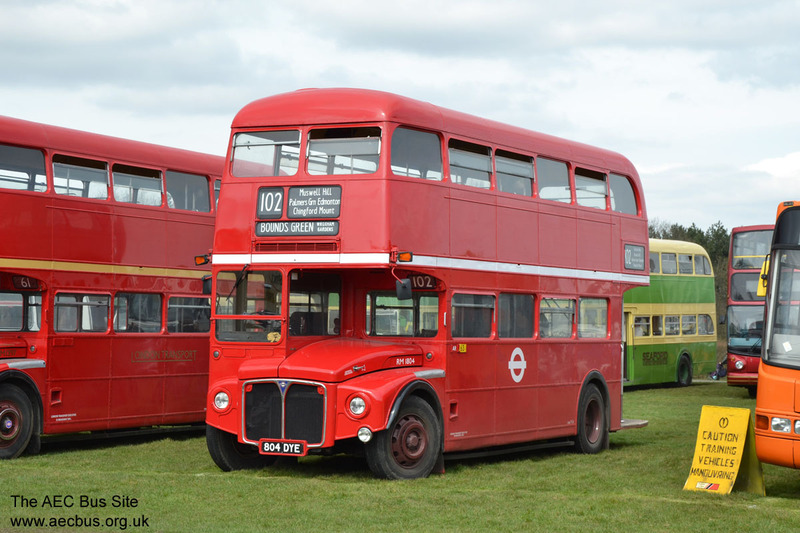 Another preserved Routemaster that can be seen at rallies, RM938 at Detling in April 2018. 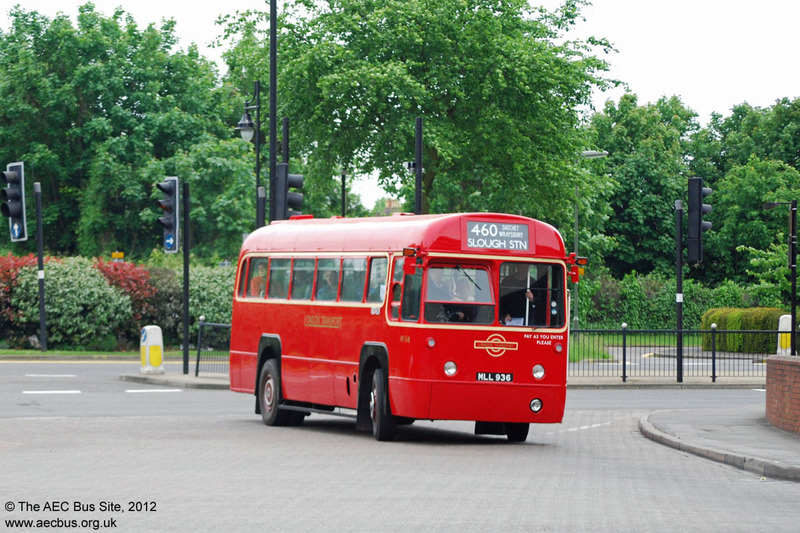 RM1005 is owned by Transport for London's Commissioner Peter Hendy, and is a regular visitor to running days. RM1033 is preserved by the owner of AEC Merlin MB90. Interestingly, during the period of body and running unit swapping by LT, 1033 acquired the body, A-frame and B-frame of RM1030 - so really it is 1030! More info can be found at the RM1033 website. Preserved RM1058 (204 UXJ) changed hands in 2013 and is now with a private owner in Gloucestershire. 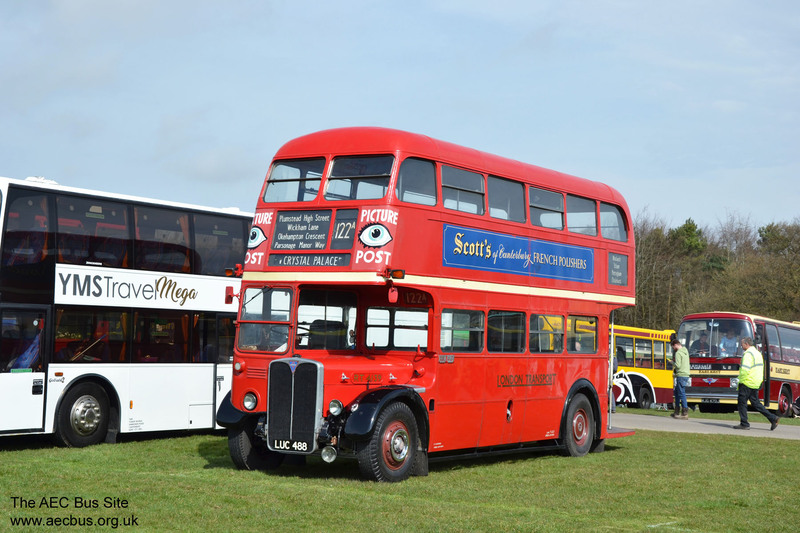 Smartly turned out RM1063 at an event in Detling in 2012. 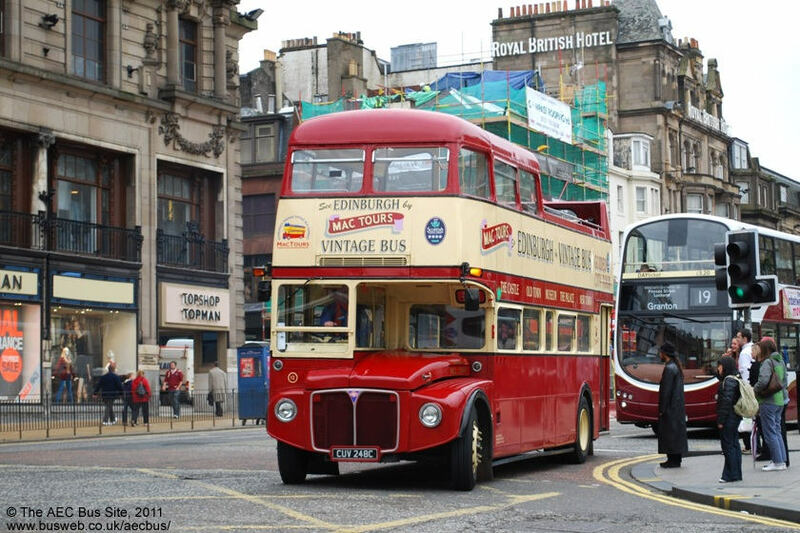 RM1224 was sold by LT to United Counties and then passed to Stagecoach in Perth where it was re-registered UYJ 654. It was sold for preservation in 1997 and is now privately owned in East Grinstead. 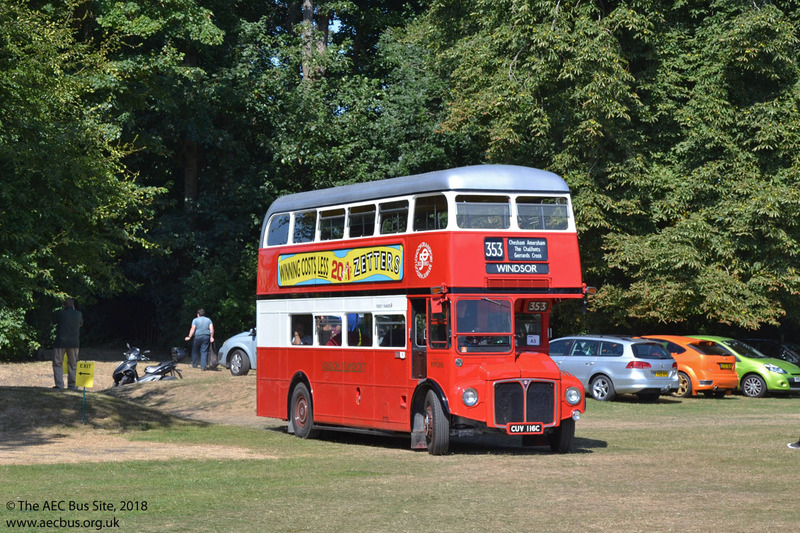 RMF1254, the prototype forward-entrance Routemaster, which later moved from London Transport to Northern General, is now restored to active preservation with London Routemaster Bus Company, Wisbech, and was captured at an Epping Ongar Railway event in 2018. RM1361 is privately owned but operates on loan to Ensignbus. It was seen on the December 2013 Ensignbus running day at Lakeside. 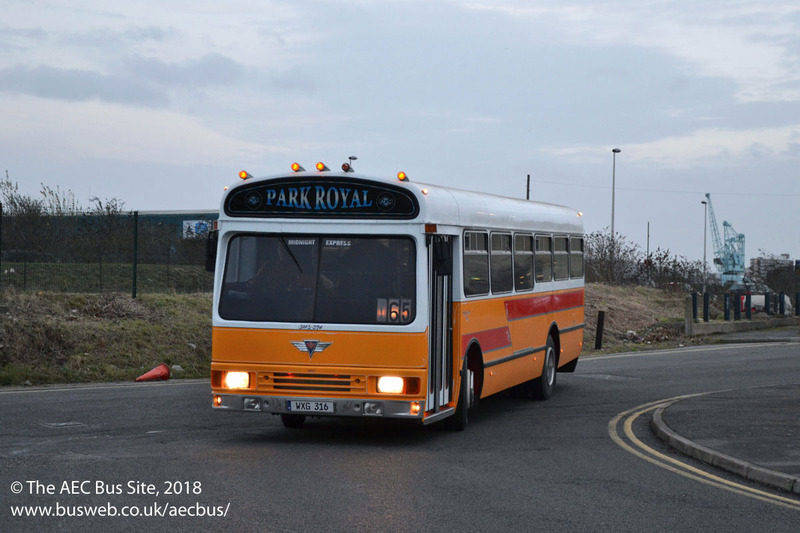 An unusual RM in preservation is RM1368, which was converted to single deck after an arson attack in 1973 but saw little service as a PCV and passed into departmental service with LT. It was pictured in 2012. 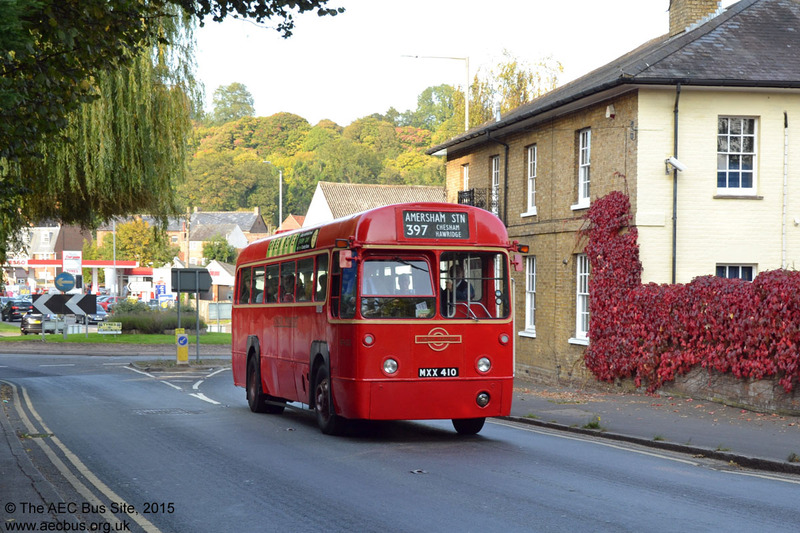 Preserved RM1397 at Forest Row during the East Grinstead running day in 2014. RM1414 (414 CLT) is preserved at the Manchester Museum of Transport. 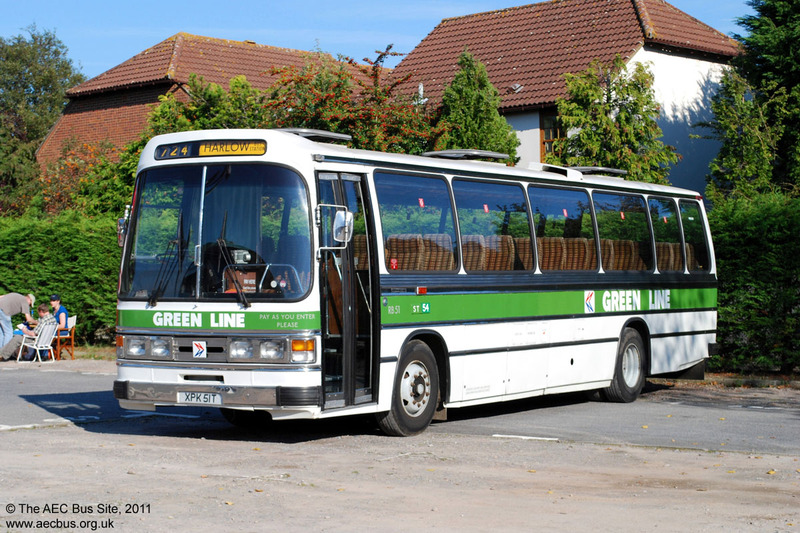 Green Line RMC1456 (456 CLT) has been privately preserved for a number of years and changed hands in February 2013 after being sold at auction. Sister RMC1462 (462 CLT) is also privately preserved. 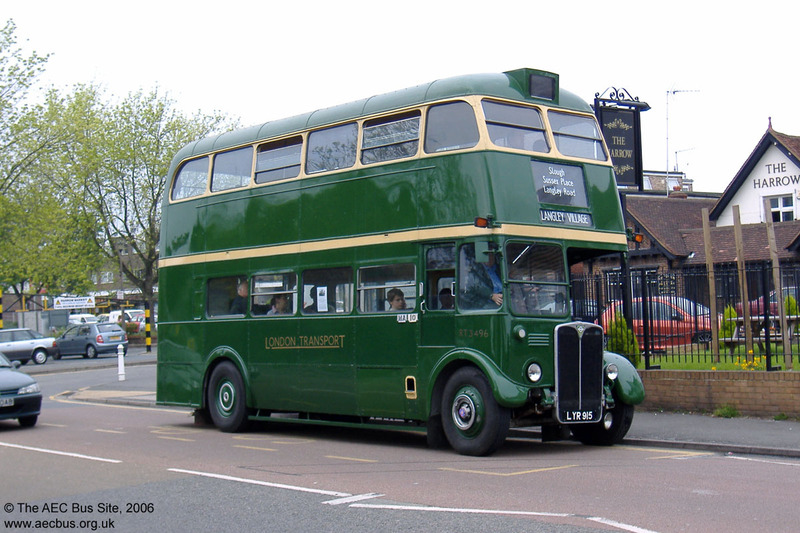 Green Line RMC1461 (461 CLT), which ended its working career running on London route 15 for Stagecoach, is preserved at the London Bus Museum and appears regularly at running days. 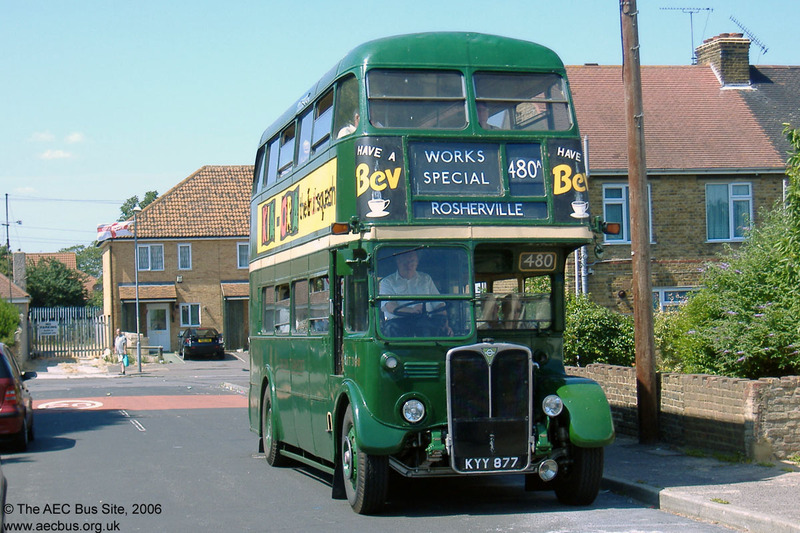 RMC1469 was restored over a number of years by Kevin McGowan before passing to a new owner in 2006, and then to the Isle of Wight Bus Museum. RMC1500 carries the registration plate from RMC1486 and displays that fleetnumber also. 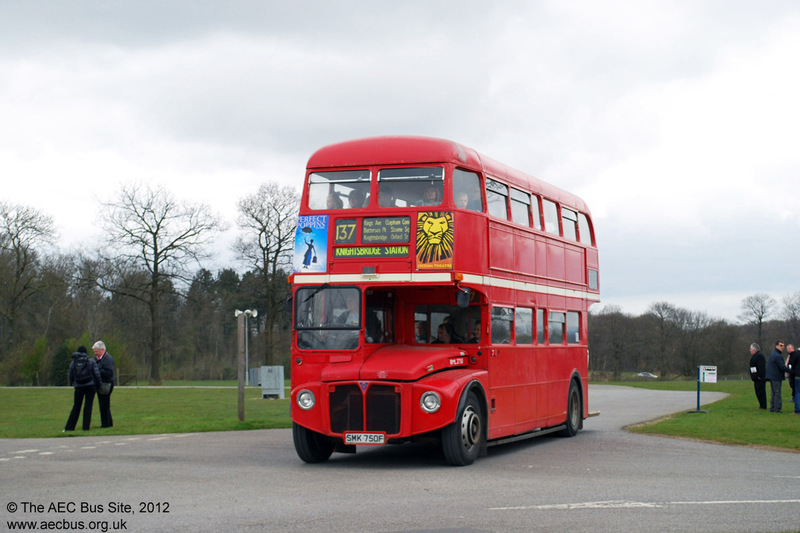 It is preserved in London Country bus livery, and has been active at rallies and running days. It changed ownership in November 2013. 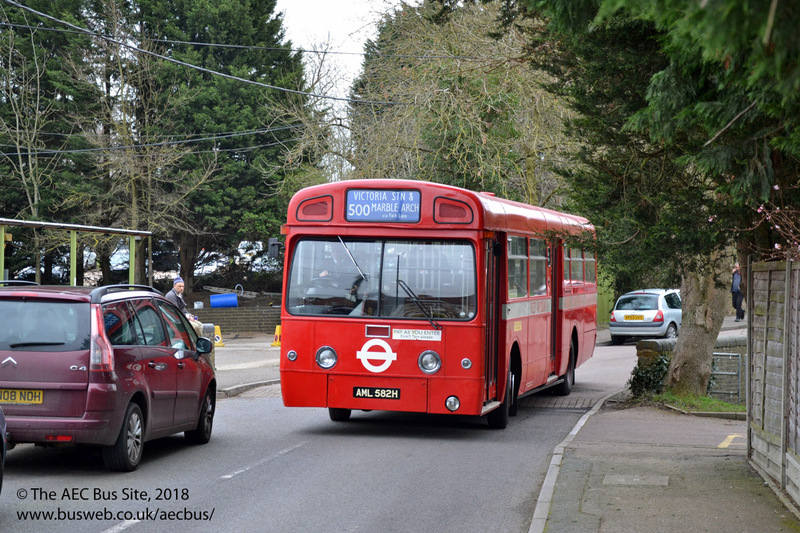 RMC1507 has passed from a private preservationist to the preserved fleet of London Bus company in 2018. Former Centrewest and First Berkshire open-top RMC1510 was sold to a private owner in Reading in 2017. It last operated for First on the Legoland shuttle in 2016. RM1640 seen in Windsor during a running day in May 2009. Open-top RM1783 passed to a private owner in London in 2012 after spending a few years in Cornwall with Western Greyhound. Privately owned RM1804 has been treated to a recent repaint and was seen at the Detling rally in April 2018. Preserved RM1955 in a later variation of London Transport livery, with the now famous roundel. RM1973 is preserved by London Taxi Exports. 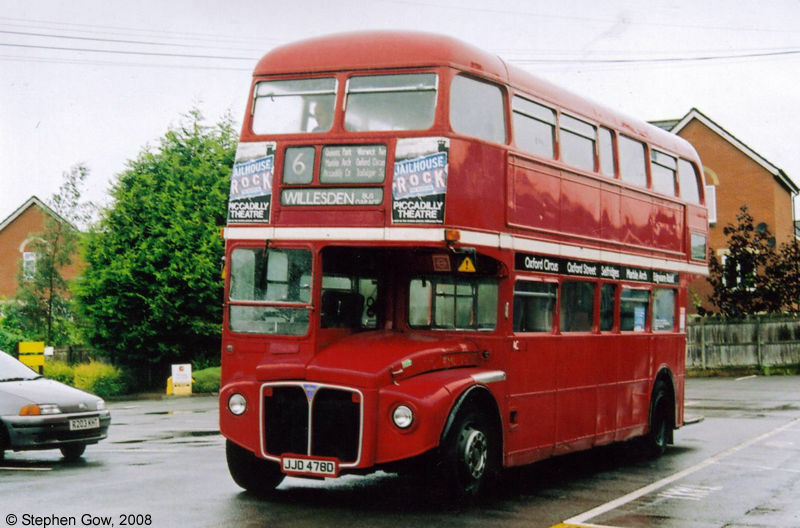 It was bought straight out of service with Metroline where it ran the last Routemaster journey on the 390. It had a mechanical overhaul in 2012 and bodywork overhaul commenced in 2013 to restore it to fine condition. RM1990 is preserved in the livery of Reading Mainline for whom it ran in the 1990s. 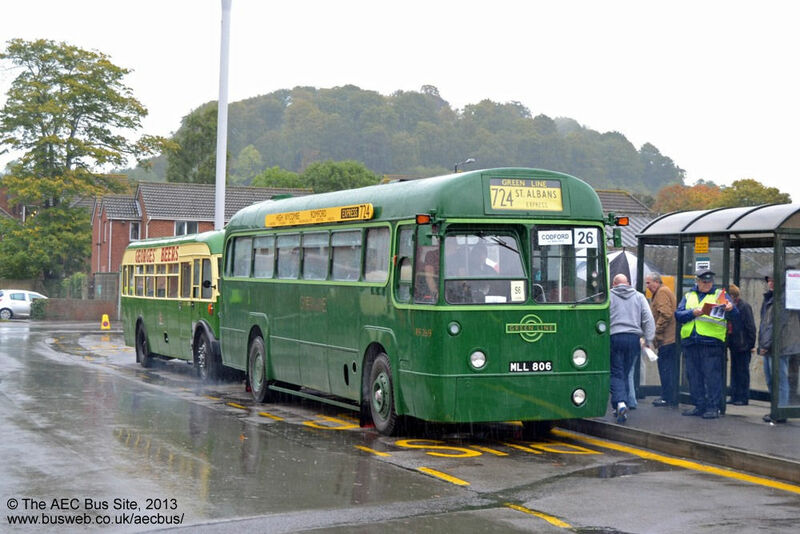 Also in Mainline livery, RM999 (WVS 423) and RM1859 (859 DYE), are preserved by Reading Heritage Transport and also used for heritage operations and hires. 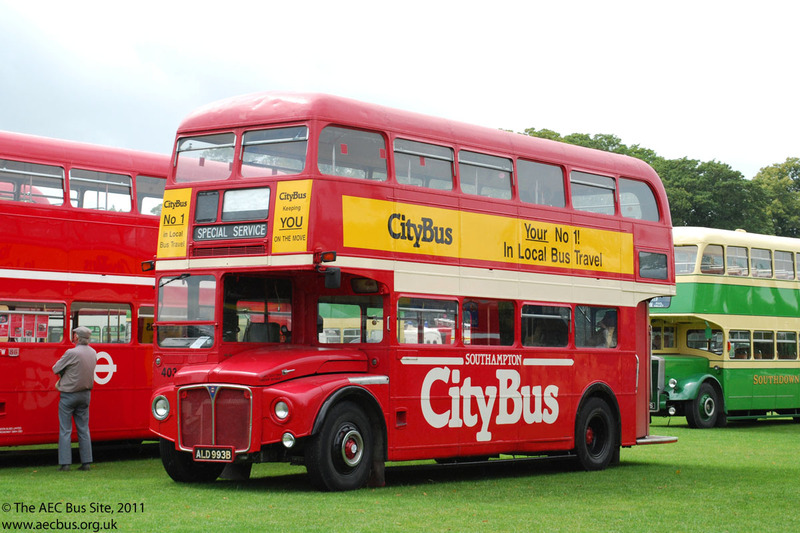 RM1993 is preserved in the livery it wore when numbered 403 in the Southampton Citybus fleet. RM2037 is preserved by Keith Rose and appears regularly at rallies. It last ran in service with Reading Mainline / Reading Buses. 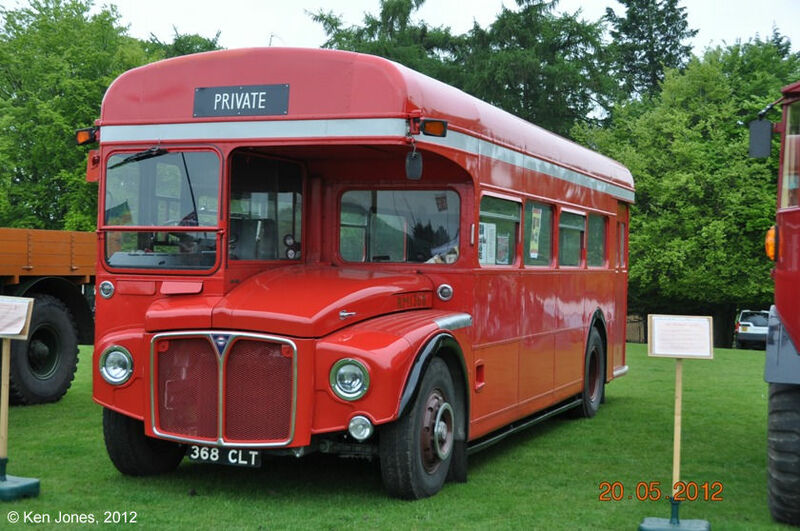 Private owner Peter Legg has RM2116 in preservation and takes it regularly to rallies and running days, such as when seen at Alton in 2018. 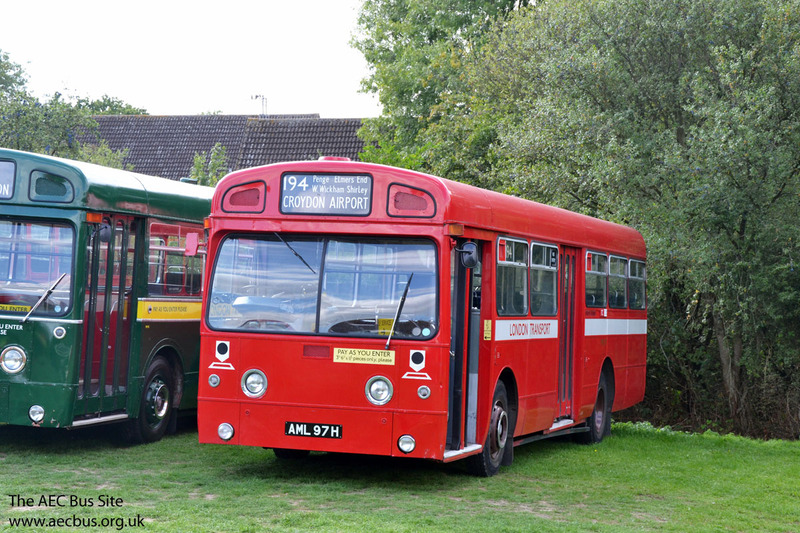 RML2185 (CUV 185C) and RML2266 (CUV 266C) are preserved by the proprieter of Carters Heritage Buses of Ipswich. 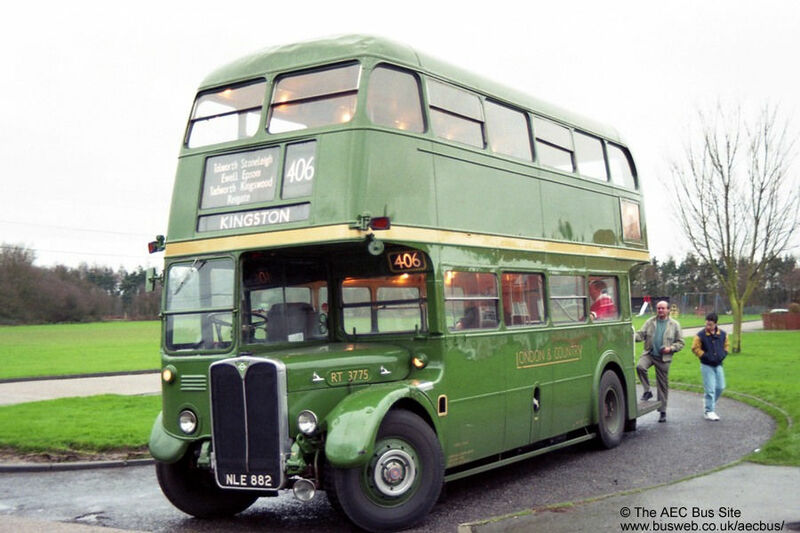 One of the single batch of long-wheelbase Routemaster coaches built for Green Line work, and later transferred from London Country to London Transport as red buses on route 149, RCL2219 is preserved in its original Green Line livery at the Wythall Transport Museum. 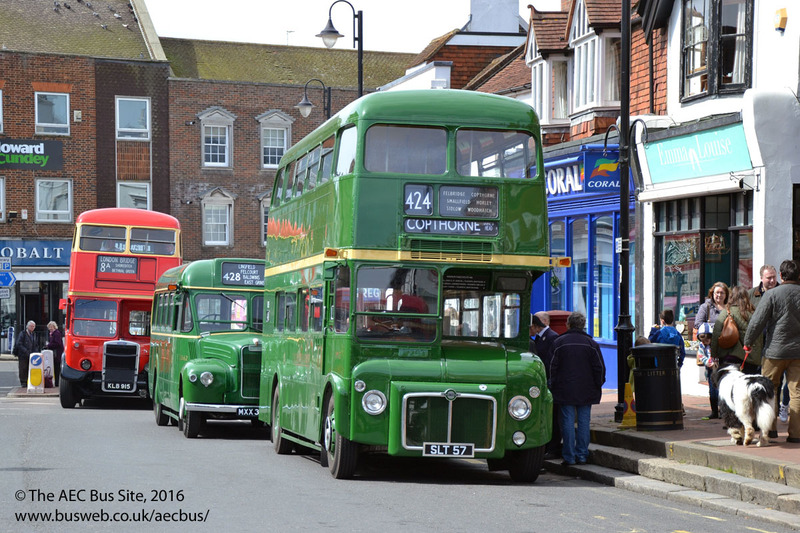 Another of the RCLs in preservation is RCL2233, seen at the 2017 Isle of Wight Beer and Buses weekend in Green Line livery. 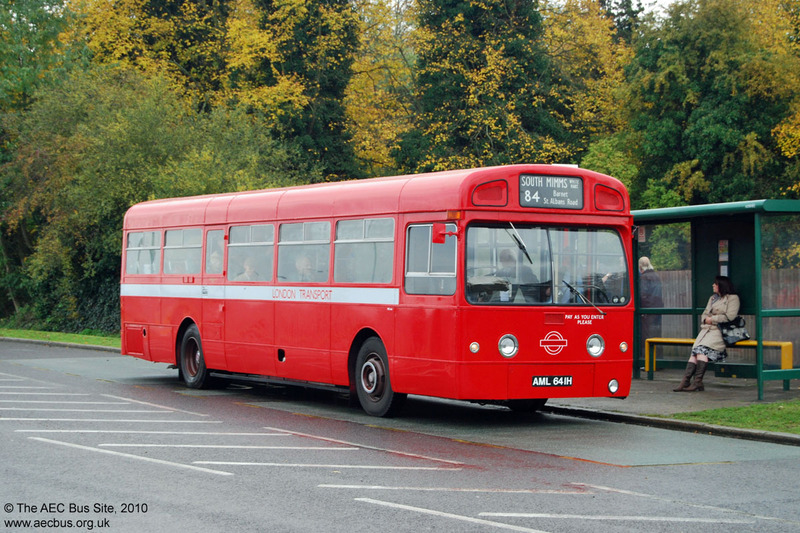 Sister RCL2254 is preserved in the livery of Bus Engineering Limited. 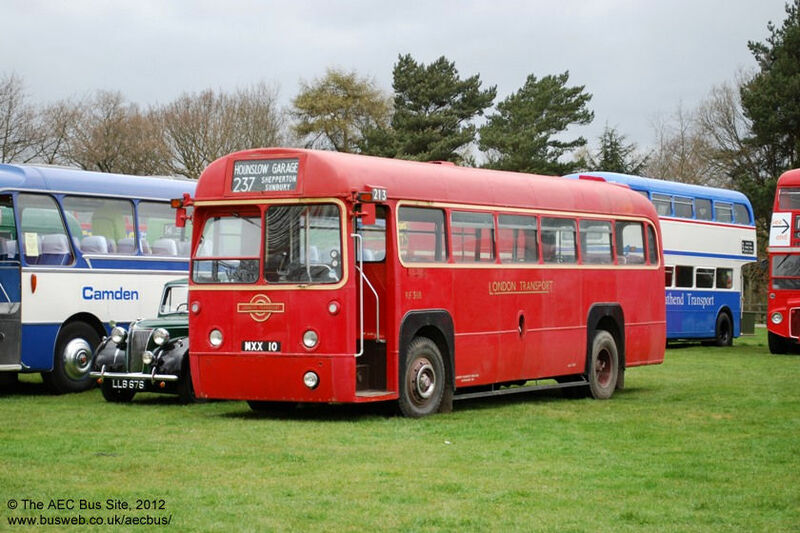 RCL2260 is in the operational fleet of London Bus Company Ltd and also appears regularly at running days. Open-top RCL2250 had been in Devon for NPSV use but was sold in 2016. Prior to that previous owner Ed Rowson oversaw its repaint into the original livery of Lincoln Green and restoration of some seating to the lower saloon. 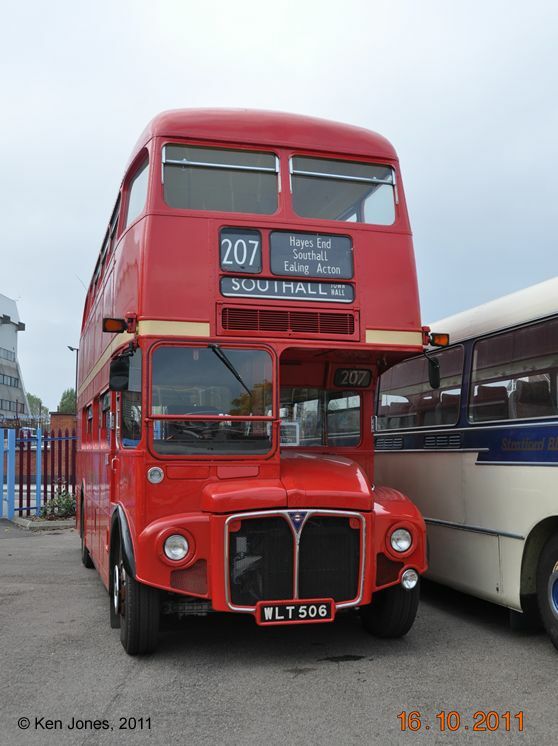 RML2275 is preserved by a private owner in Wolverhampton. 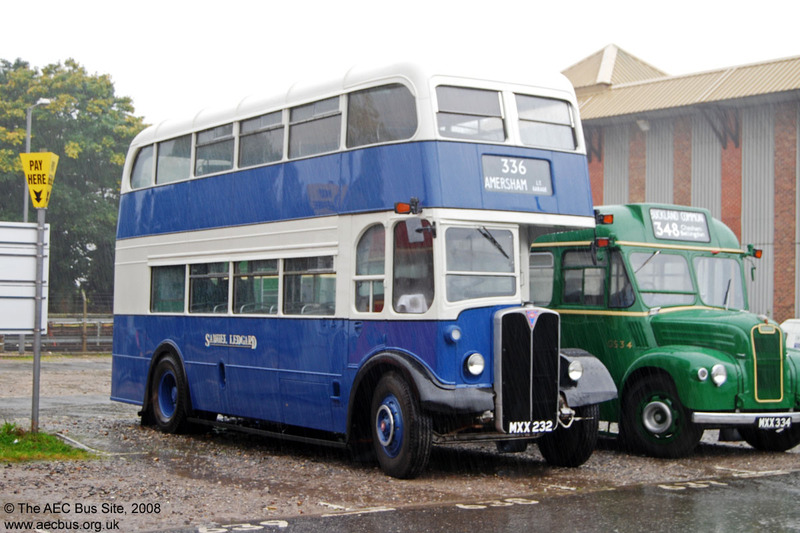 RML2290 is preserved in Cornwall, but has a class VI licence. It was pictured while on hire to Falmouth based OTS in the summer of 2014. 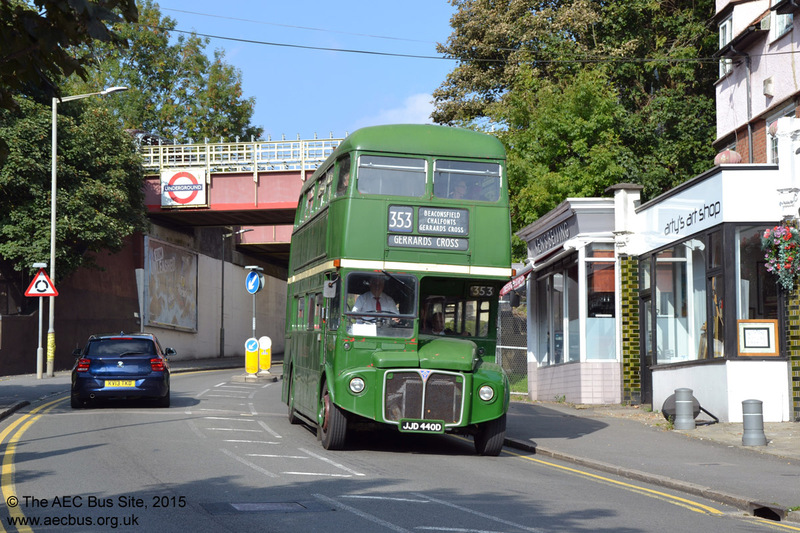 RML2312 is preserved in the West Hampstead area (apparently owned by a countess!) and has recently been repainted from Metroline livery into original LT livery. Green RML2330 stands in the sun at Oxted in April 2009. 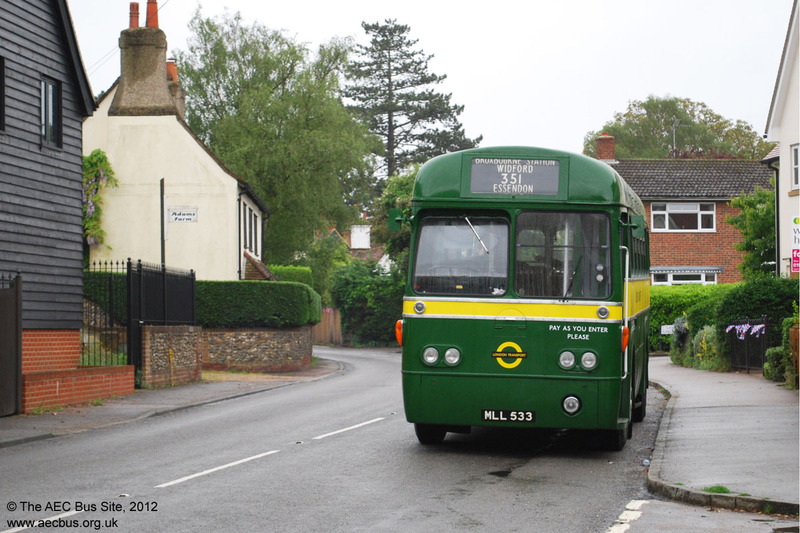 Graham's Training of Wimbledon have RML2331, among their collection of preserved vehicles. It was restored in 2011. 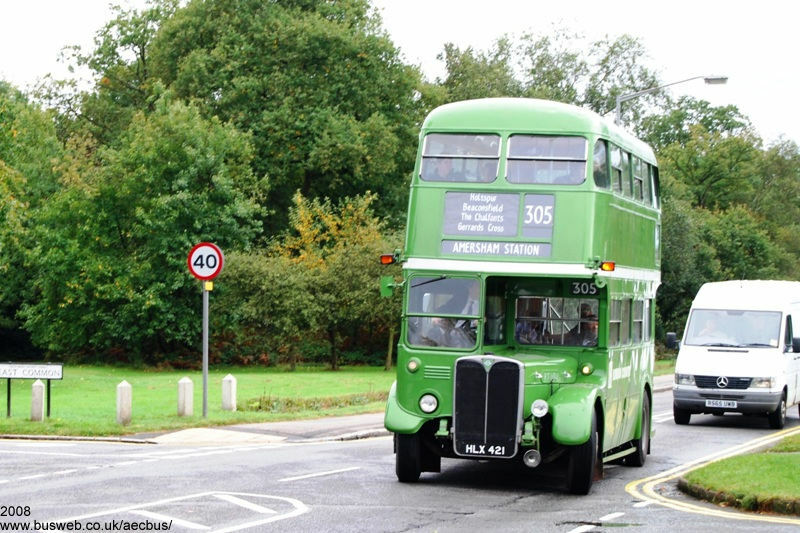 RML2334 is preserved in NBC green livery it carried after London Transpoprt country buses passed to the NBC owned London Country company, seen at a LBM Wisley event in 2012. 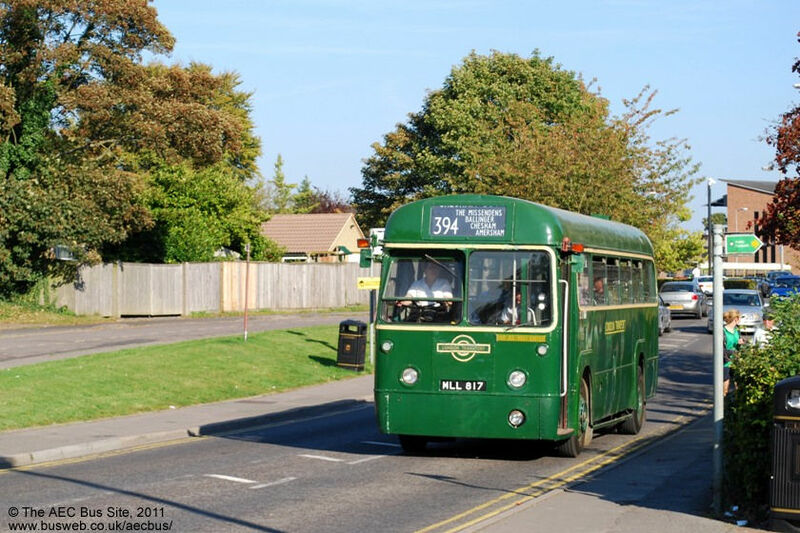 RML2344, whch was a green bus and a red bus, is preserved in LT red in Somerset and was seen at one of the regular Warminster running days in 2010. 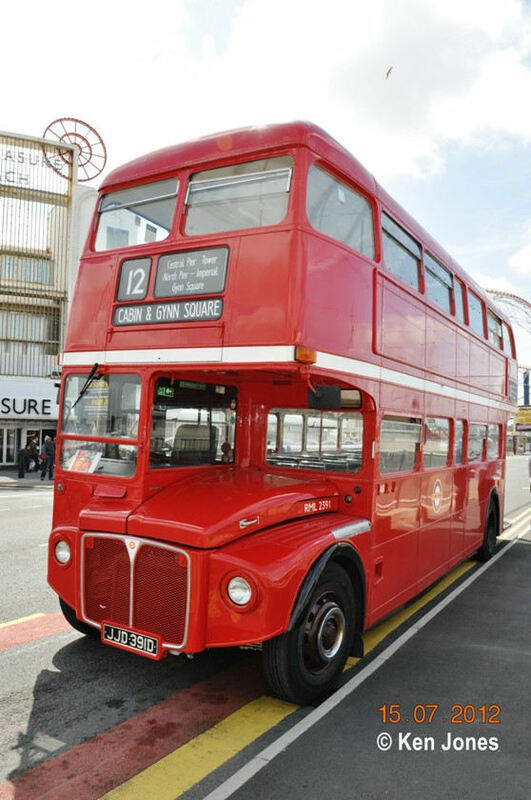 Privately preserved RML2391 has been operating for Classic bus North West on their Blackpool seafront service 12 in 2012. RML2393 was bought for preservation in 2007 by private owner Kingsley Hamilton, who is restoring it to original condition. It passed its MOT after some mechanical work was done, but required a lot of cleaning, inside and out, after sitting under trees for three years in a pub car park. It is now a regular visitor to rallies and running days. RML2396 preserved in Go-ahead style route 12 livery at the 2009 Winchester running day. 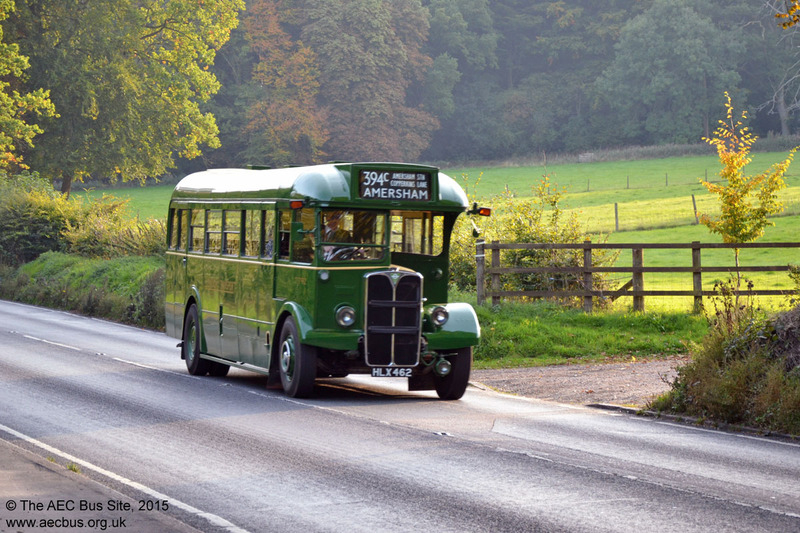 Peter Cartwright, one of the organisers of the Amersham & District running days, owns green RML2440, which was seen at the annual Amersham Running Day in October 2015. 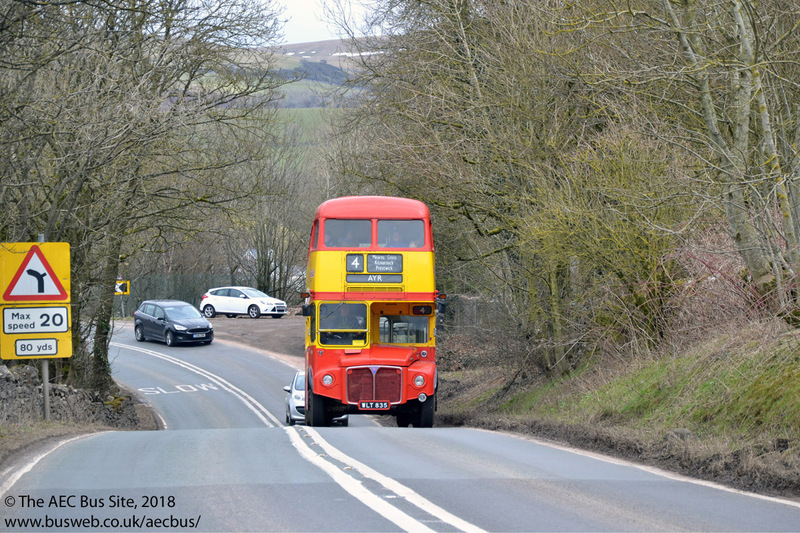 RML2443 is preserved by a private owner in County Durham and was pictured at Brough at Easter 2018. 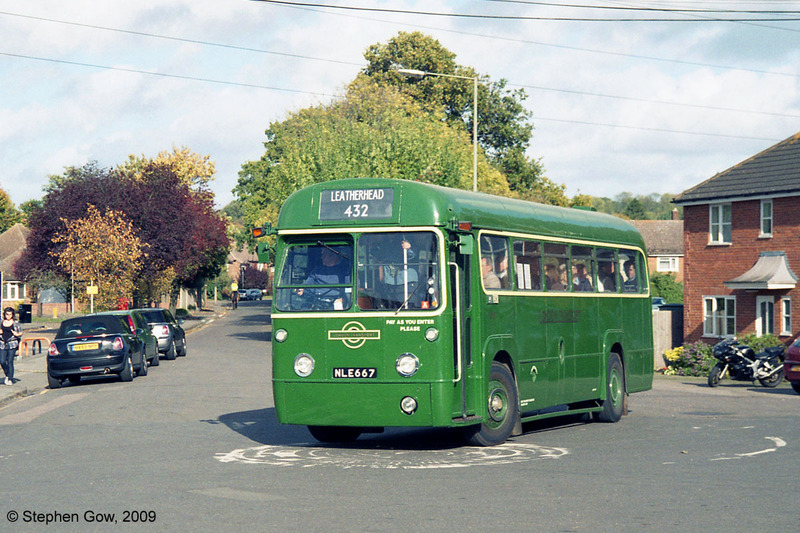 RML2444 is a member of the Stagecoach preserved fleet, and is stored at the Scottish Vintage Bus Museum, Lathalmond. 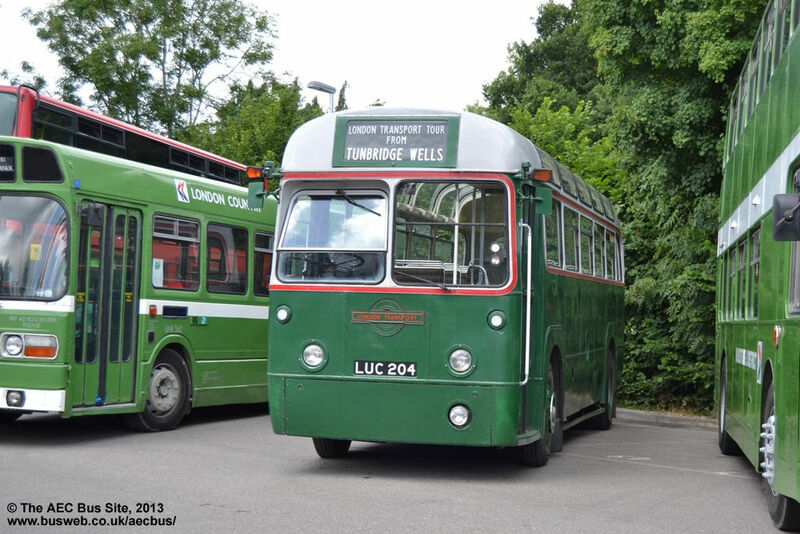 Following a spell in NBC green livery, preserved RML2456 has now been repainted into traditional Lincoln Green livery. RML2478 is owned by one of the organisers of the GWR diesel gala and bus rally, and was seen on the Evesham-Toddington feeder for the 2008 event. 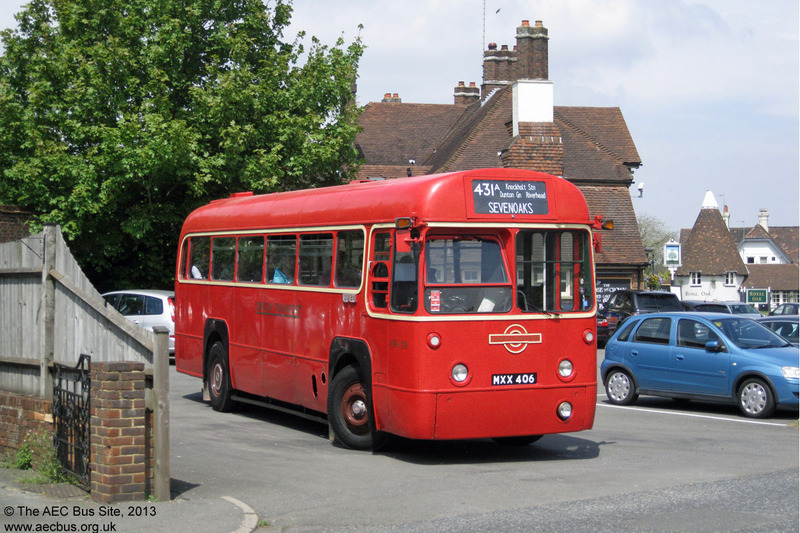 RML2486 entered private preservation in 2013 after previously being with London Bus Company. RML2518 is privately owned in the Manchester area and appears at events in the north-west. Red RML2543 at the 2009 Alton rally RML2547 is under preservation and based in the Hereford/Powys area. 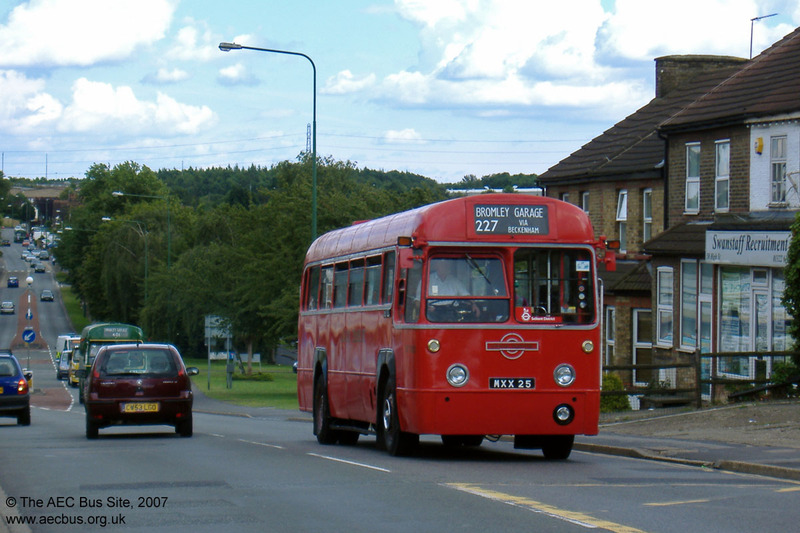 RML2620, which ran for much of its life at Holloway garage and was a golden jubilee vehicle in 2003, is preserved in Metroline livery . RML2633 is privately owned but is kept at Arriva's Cannock garage in Arriva livery. 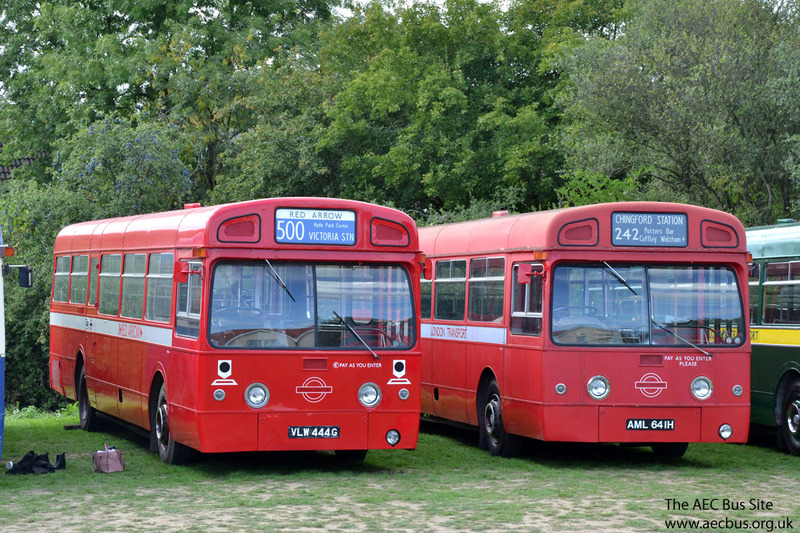 RML2660 and RML2742 are preserved with a private owner in West Sussex. 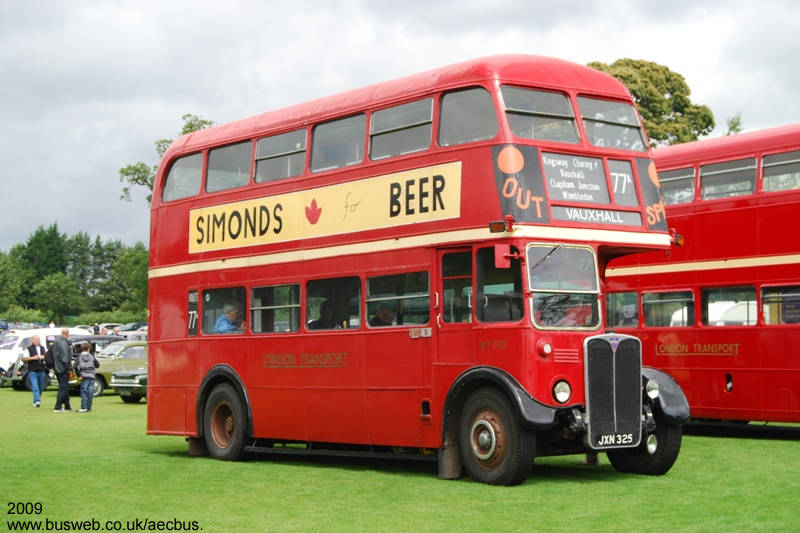 RML2714 is owned by the Stowe School in Buckingham. 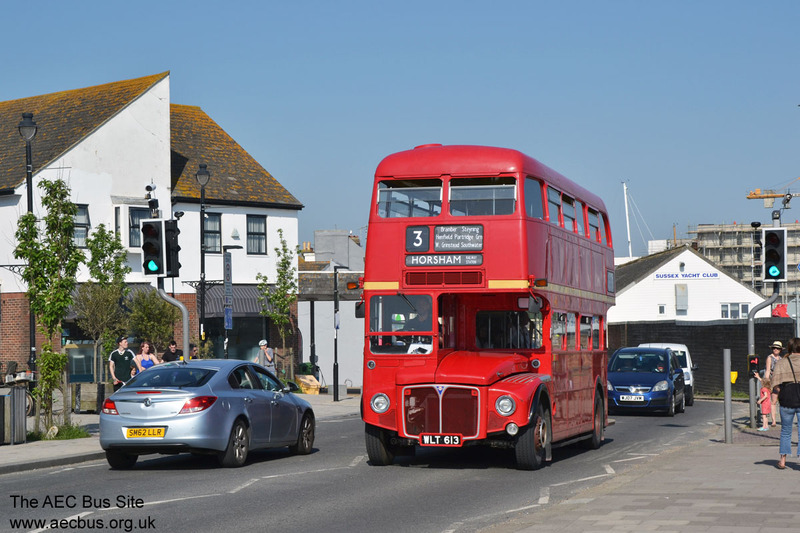 RML2719 is with an owner in Dorset, named Ruby the Routemaster, and although apparently a private hire vehicle is not easy to book so I've put it on this page. Former Centrewest and First Berkshire RML2735 was sold to Peter Hendy in 2017. 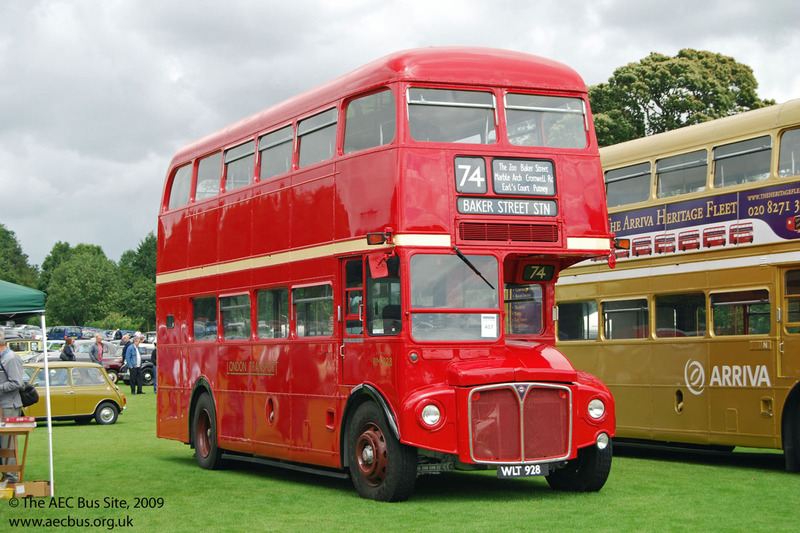 RML2686 is preserved and appears at rallies in the north of England. 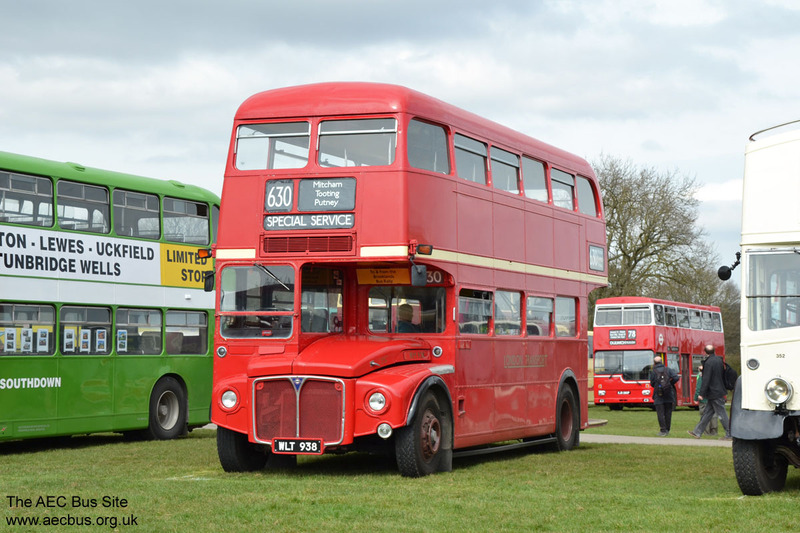 Preserved RML2750 was seen in action giving rides at the 2012 Detling rally. RML2755 (SMK 755F) is with a private owner in Wembley. Forward entrance RMA11 (NMY 648E), which was one of those originally used for BEA airport transfer duties, is privately preserved in the south of England. 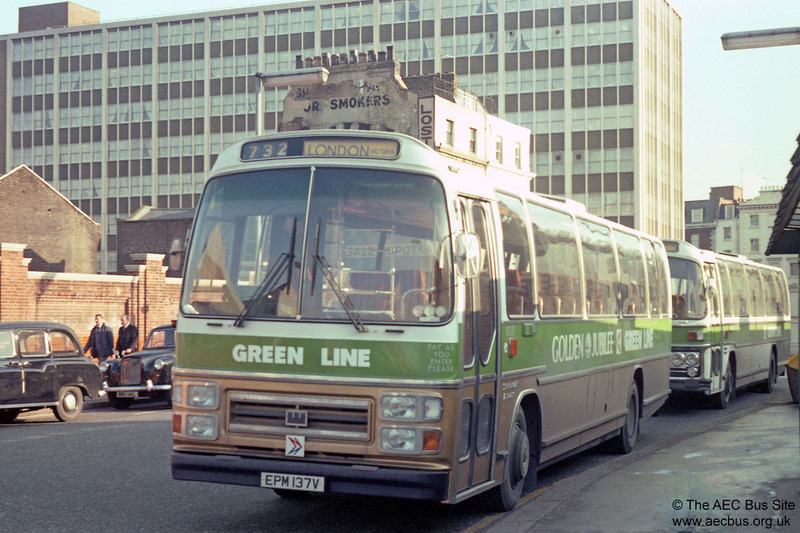 It had previously been used as a special events vehicle with Western Greyhound. 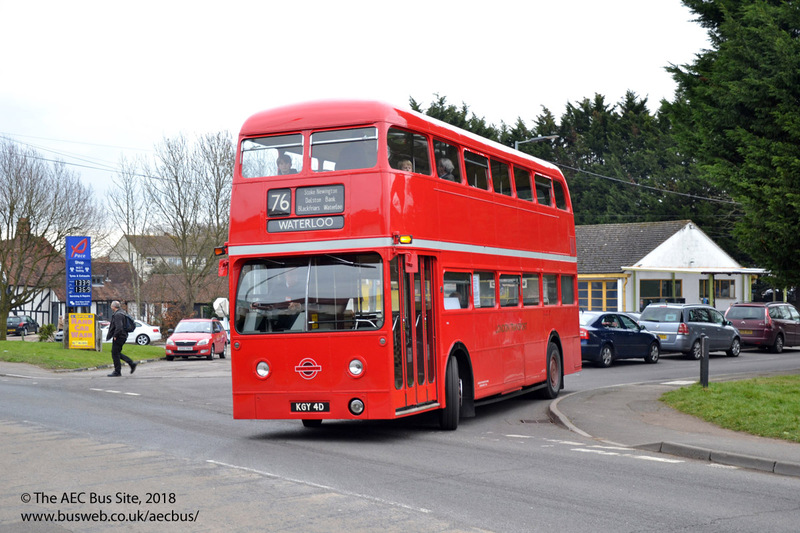 Sister NMY 645E moved from preservation in Ireland, where it was registered 67-KK-501, to Mullany's of Watford in 2018. 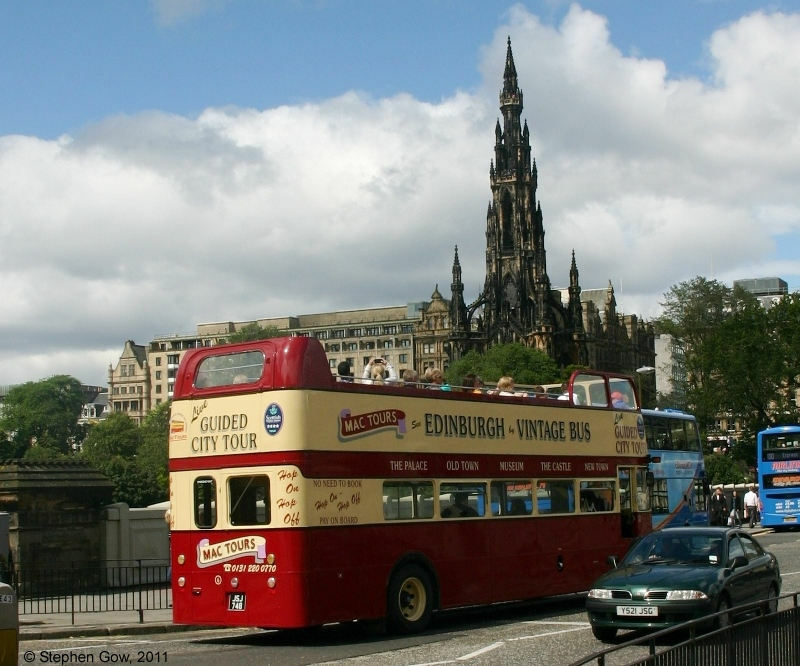 Four of the open-top AEC Routemasters that operated for 14 years with Lothian Buses' Mac Tours subsidiary have been set aside for preservation following closure of the Mac Tours operation in October 2016. They are RCL2241 (CUV 241C), RCL2248 (CUV 248C), ERM90 (JSJ 748 ex VLT 90) and ERM281 (VLT 281). 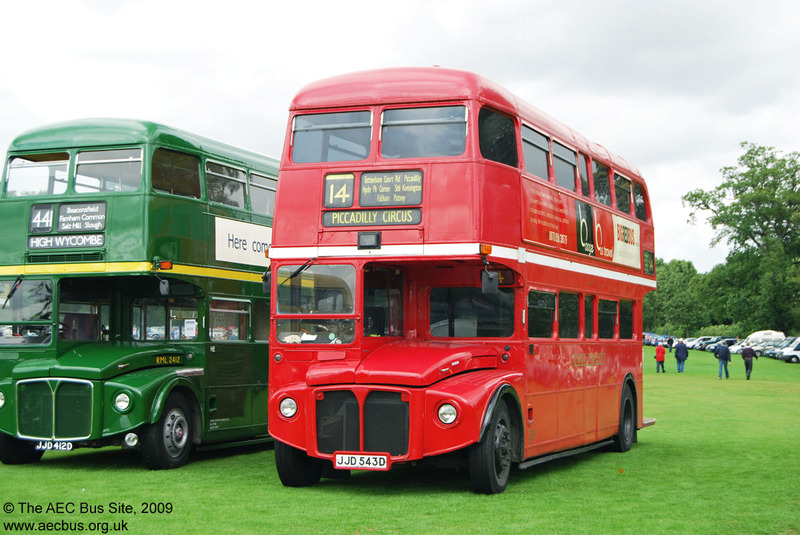 Other Routemasters that are preserved and can be seen at rallies and running days are RM737, RM811, RM1403 (open-top), RM1989, RML2364, RML2731. 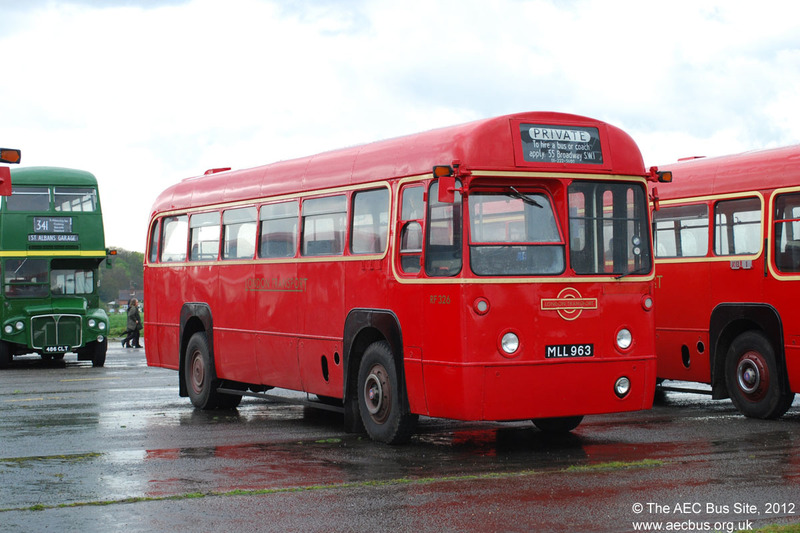 RM446 is being restored at Crosville, Weston-Super-Mare. 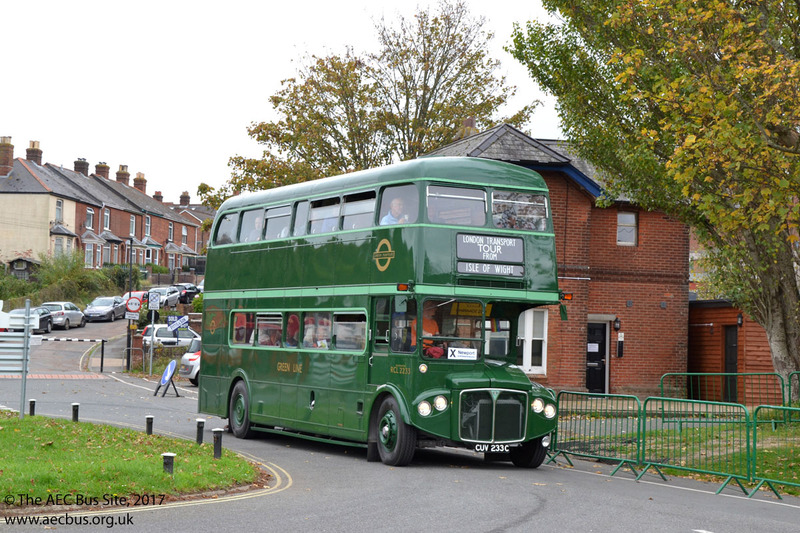 How much effort goes into preserving a bus? Well, Jonathan Wilkins has been keeping a diary of his restoration of SM106. You'll find it on his website. It's interesting reading and also demonstrates just how much time, money and effort is expended by those whose dedication to keeping these old vehicles in such good condition in museums and on the road for the benefit of us all. Thanks to all of you.